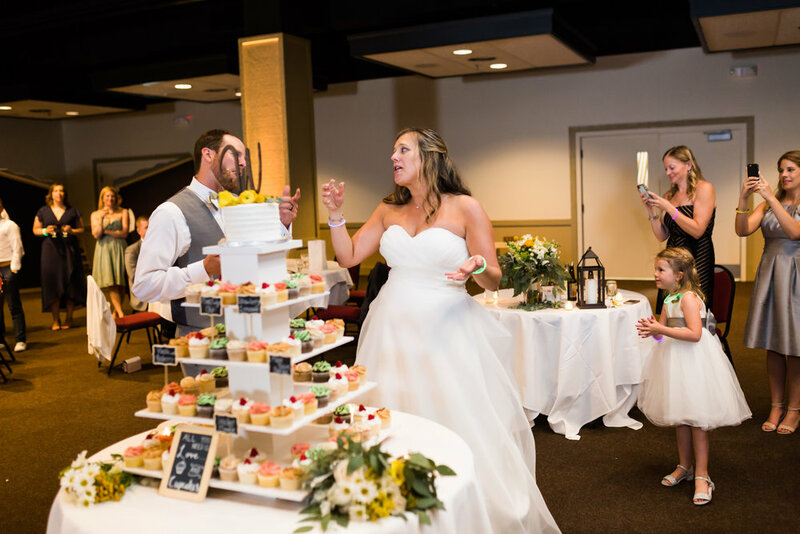 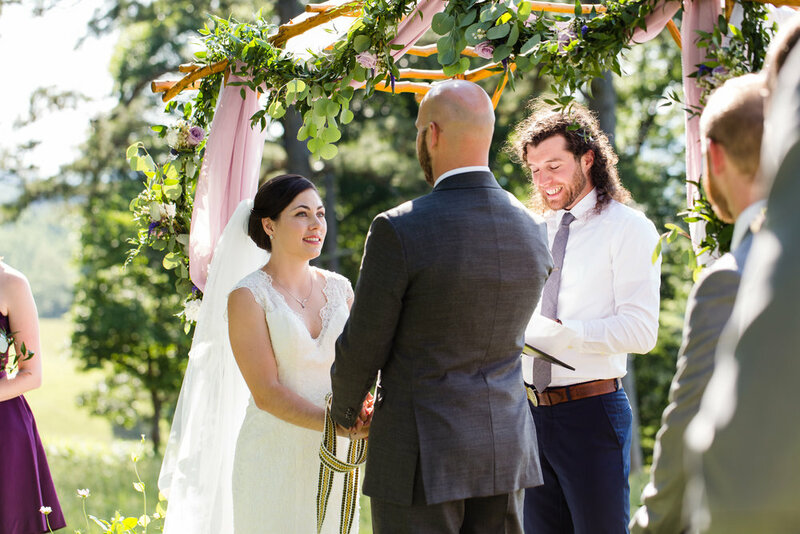 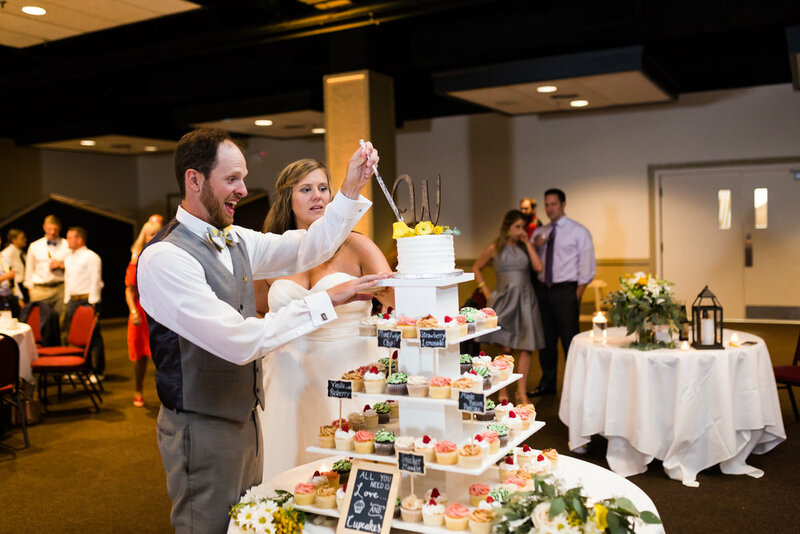 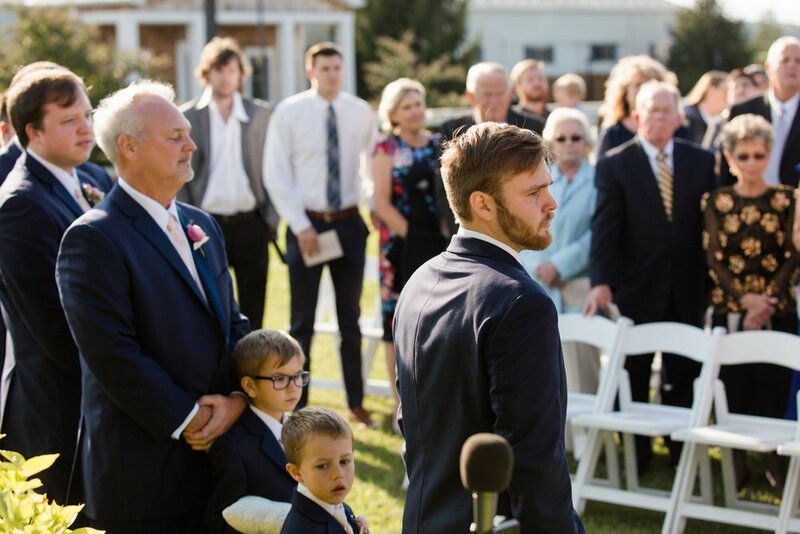 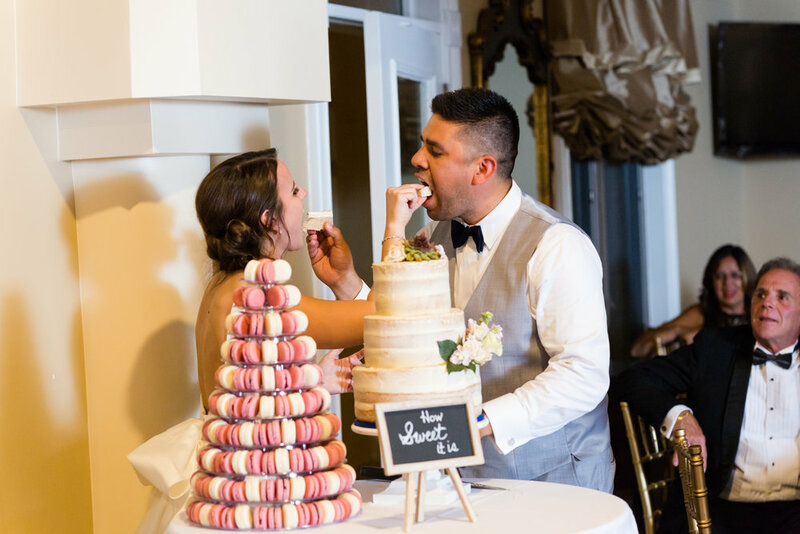 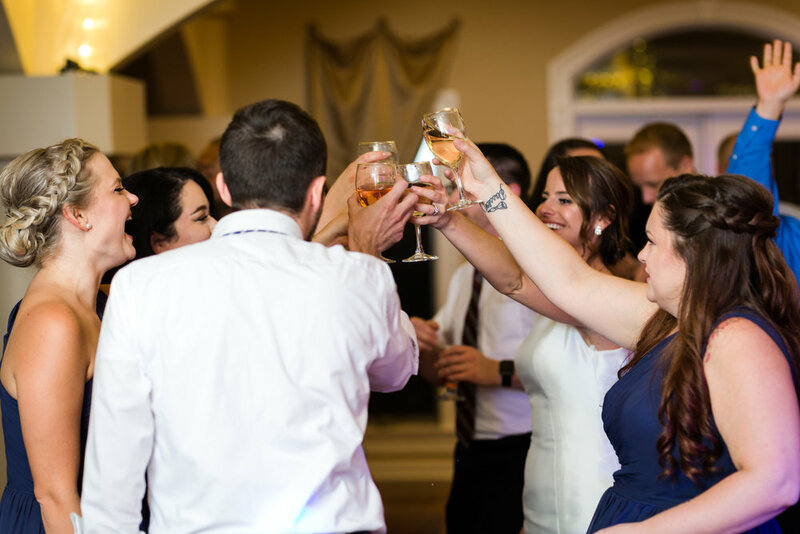 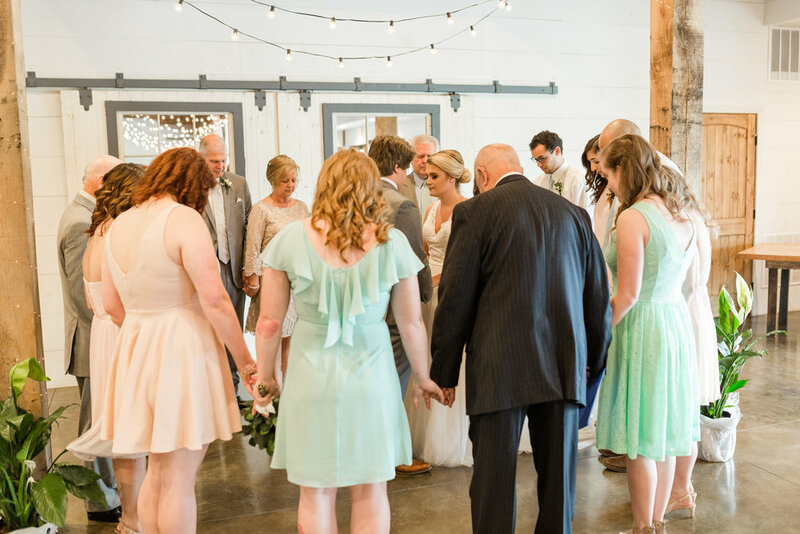 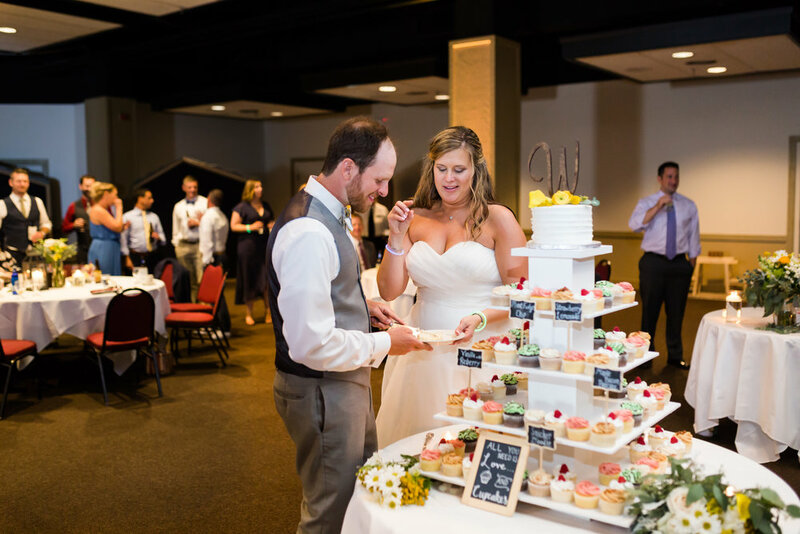 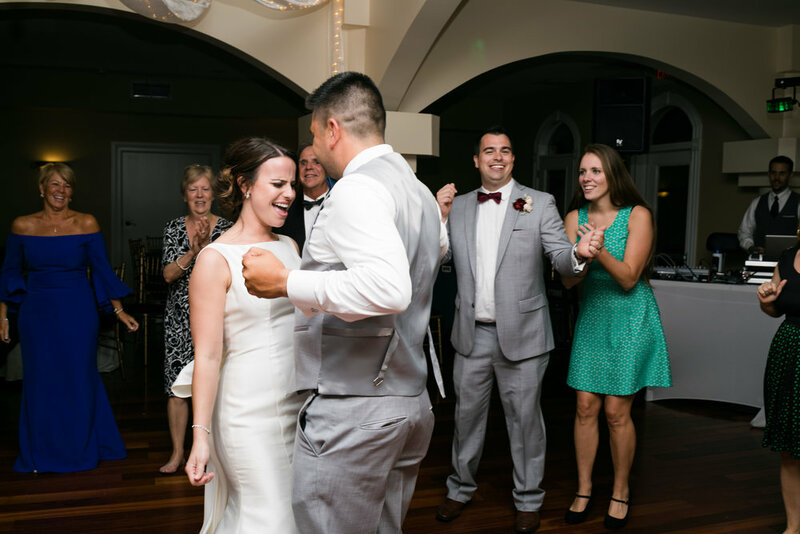 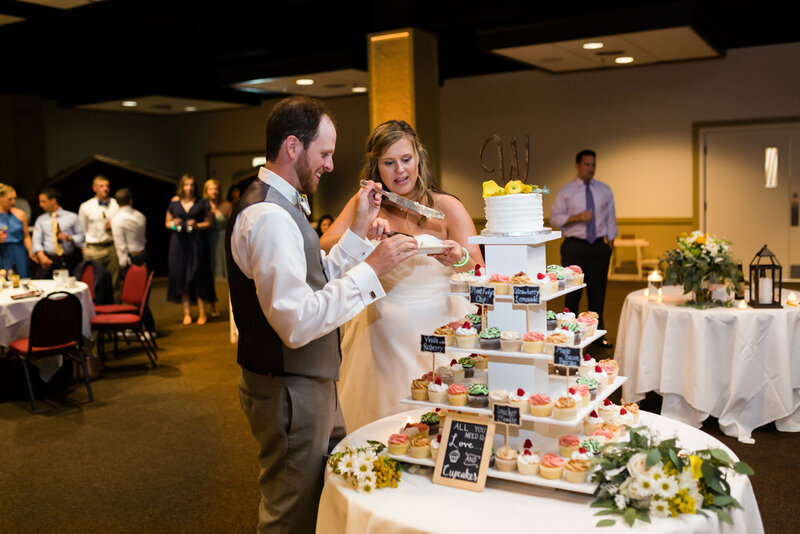 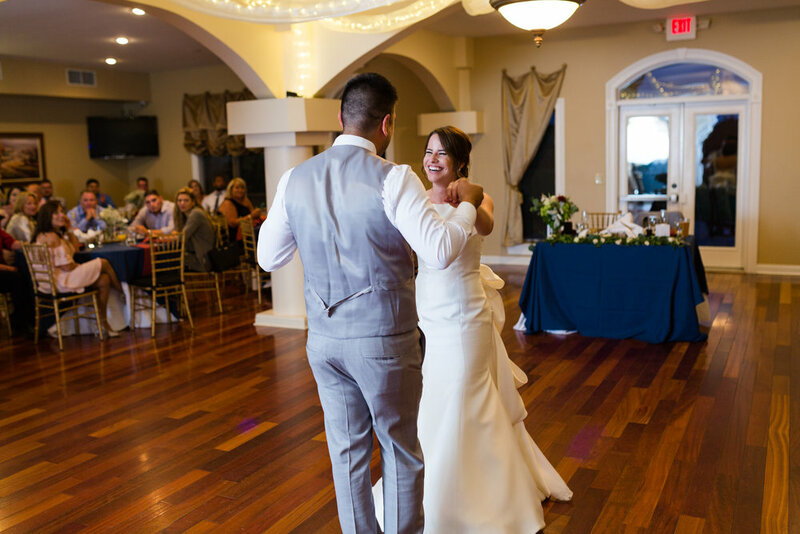 After dating for 6 years Tori and Chris said their vows at their spring wedding this May filled with family, friends, and so much love! 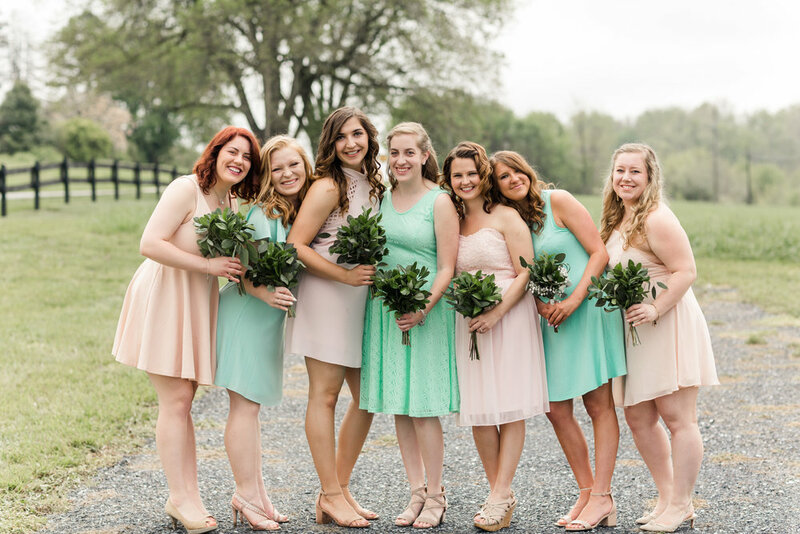 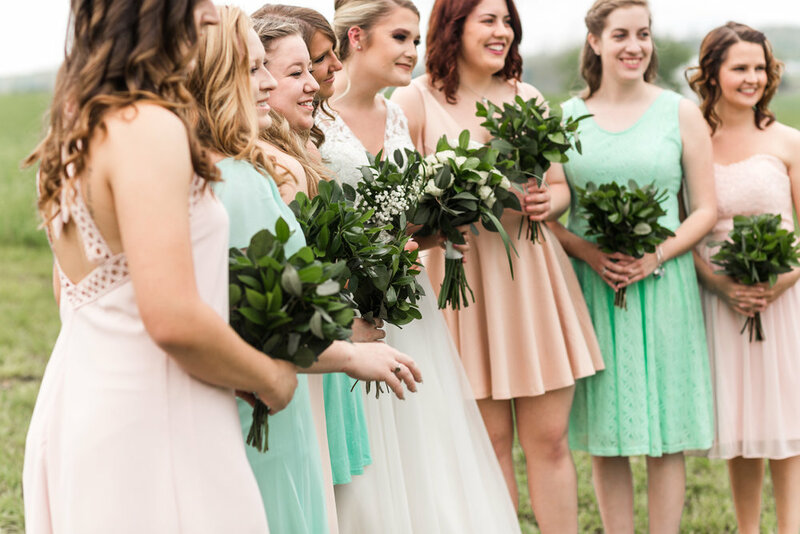 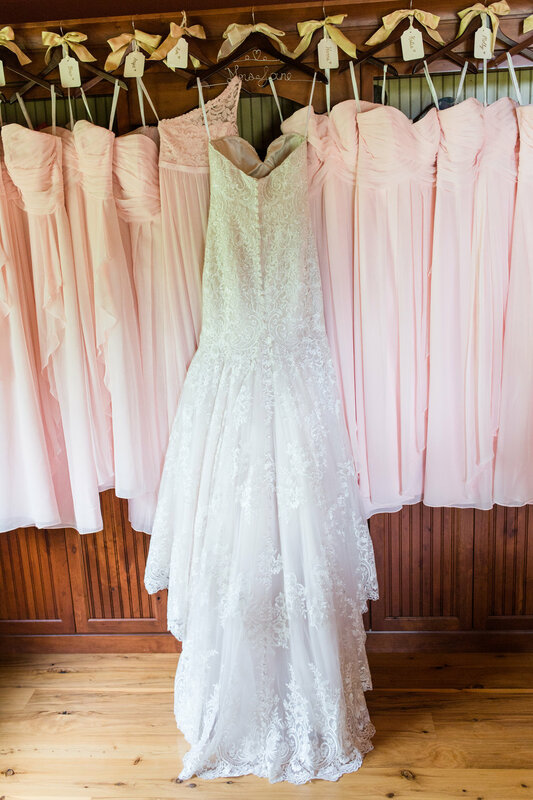 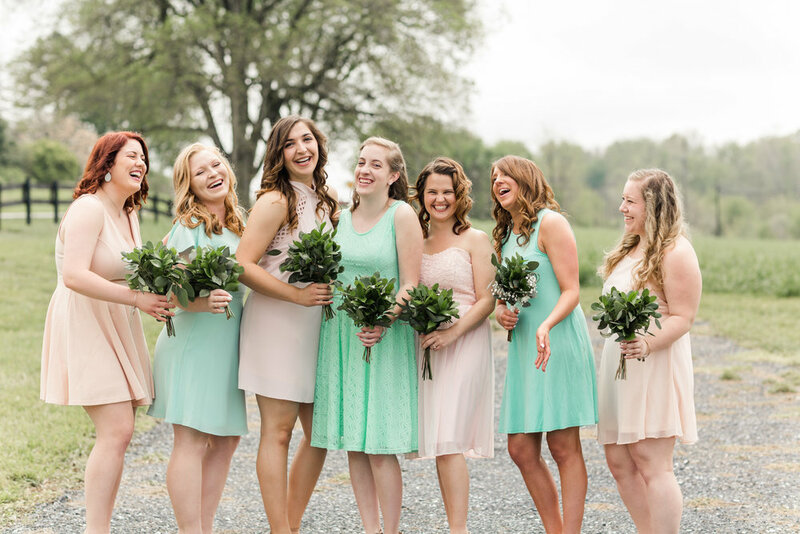 Tori and Chris chose the colors of light pink and light green to create a beautiful spring tone. 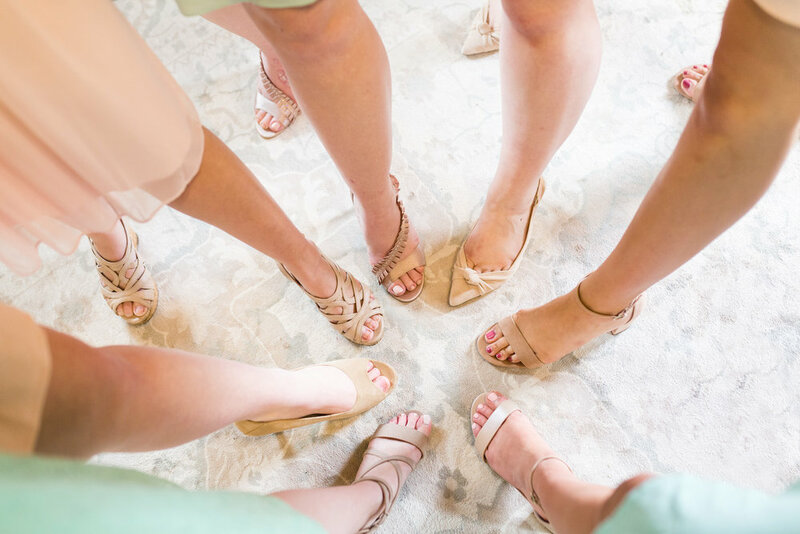 The bridesmaids worse an array of light pink and light green dresses in different styles and wore the cutest tan shoes again all in different styles! 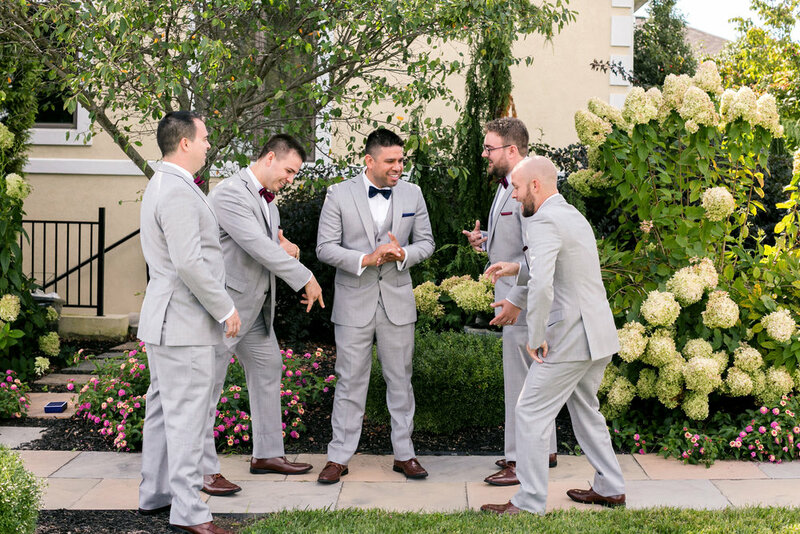 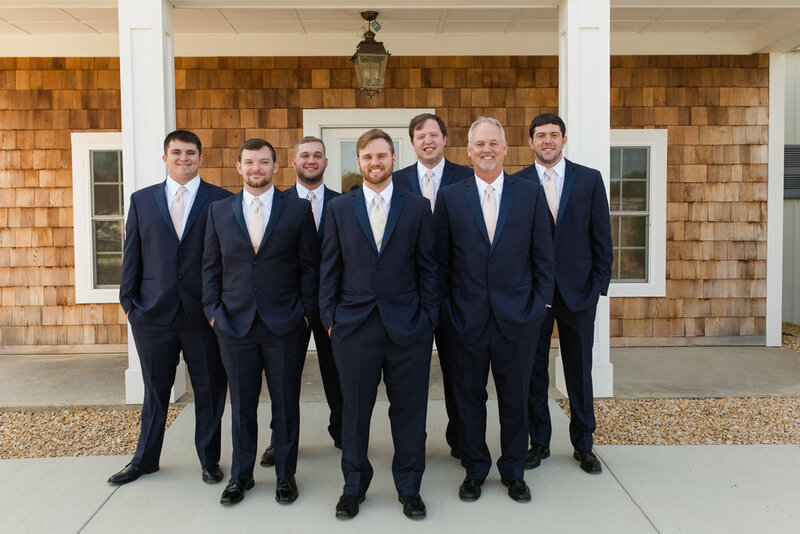 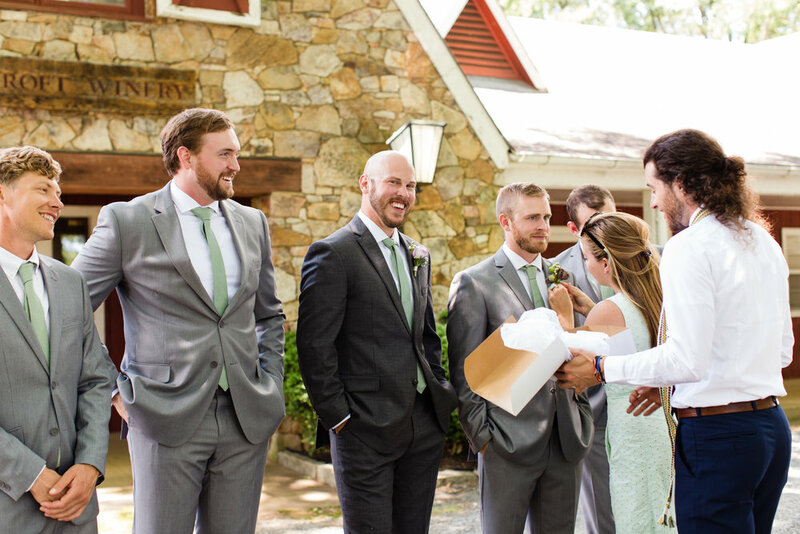 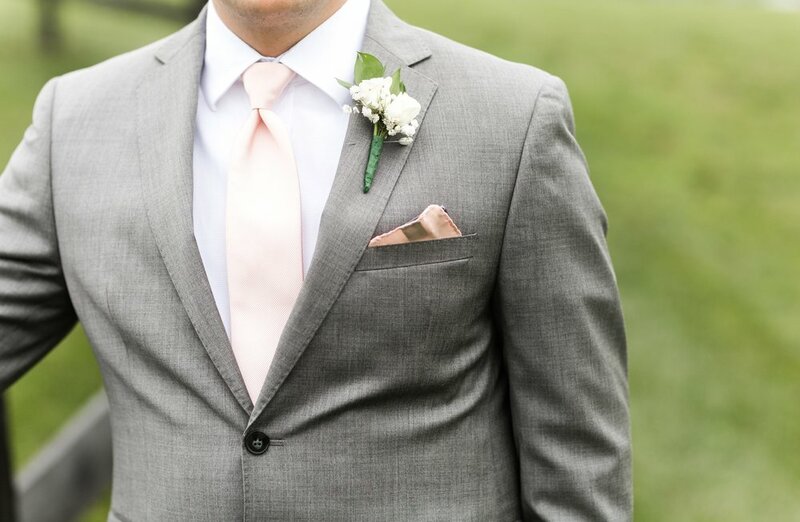 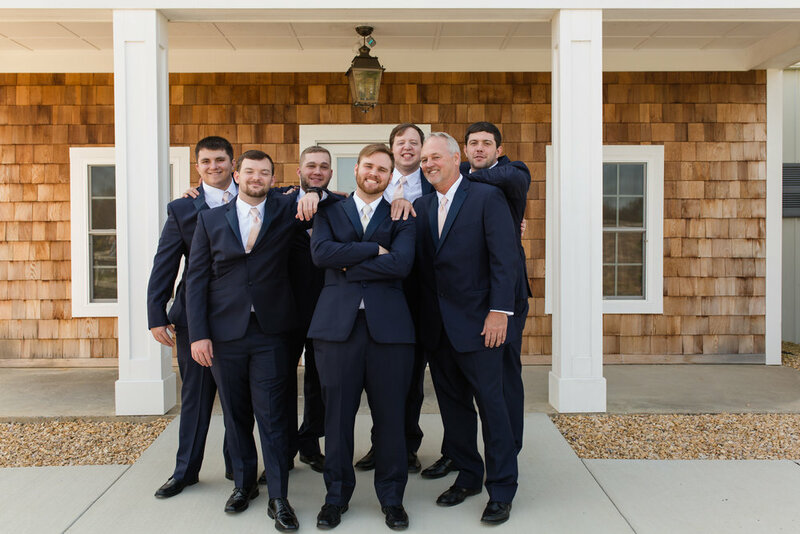 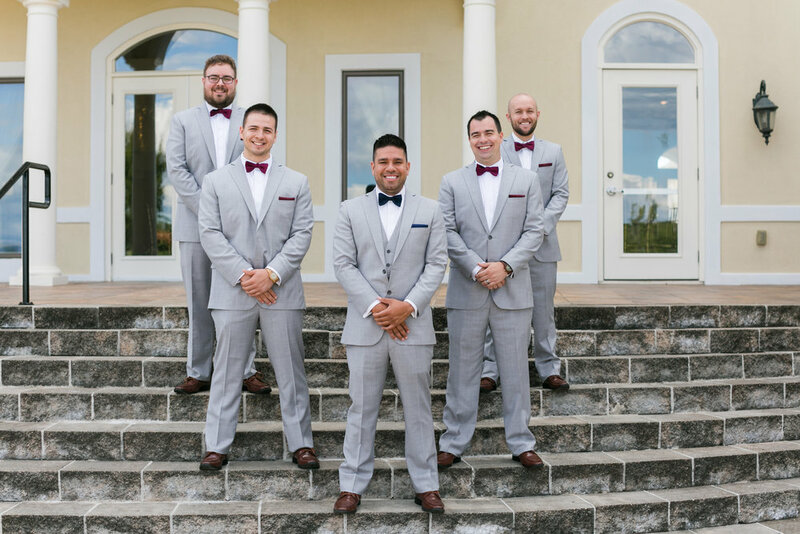 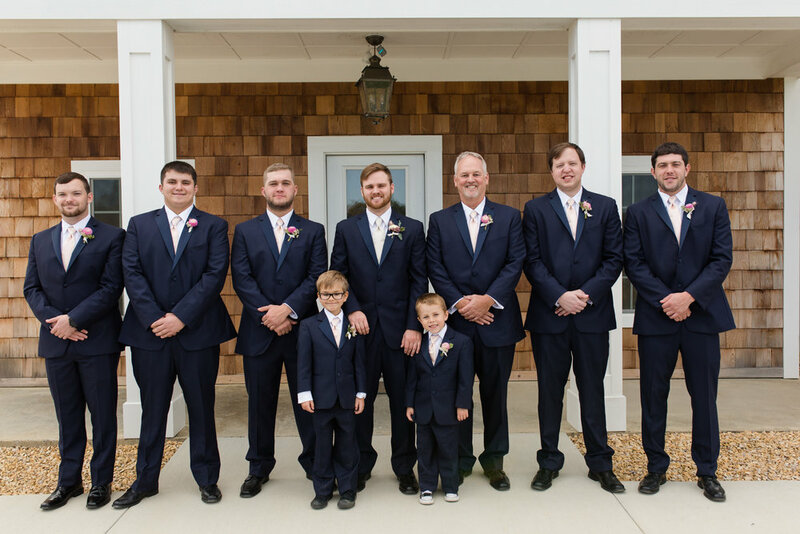 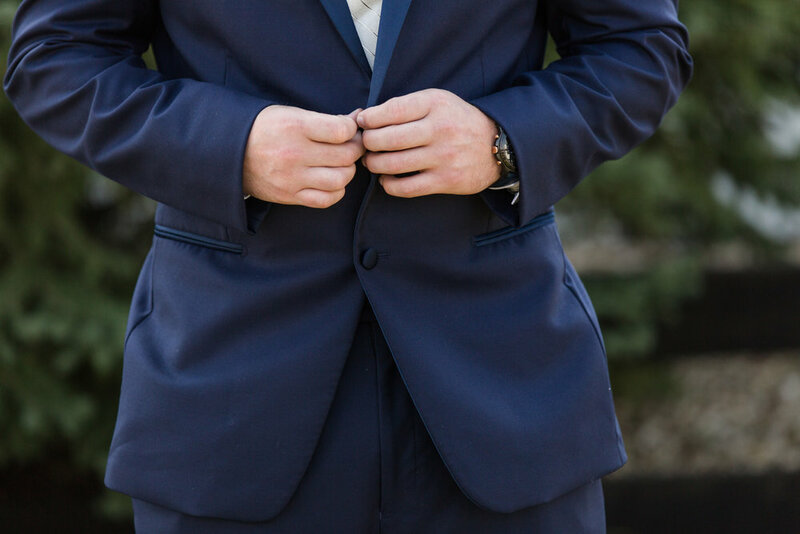 The men looked dashing in their light green and light pink ties with classic gray suits. 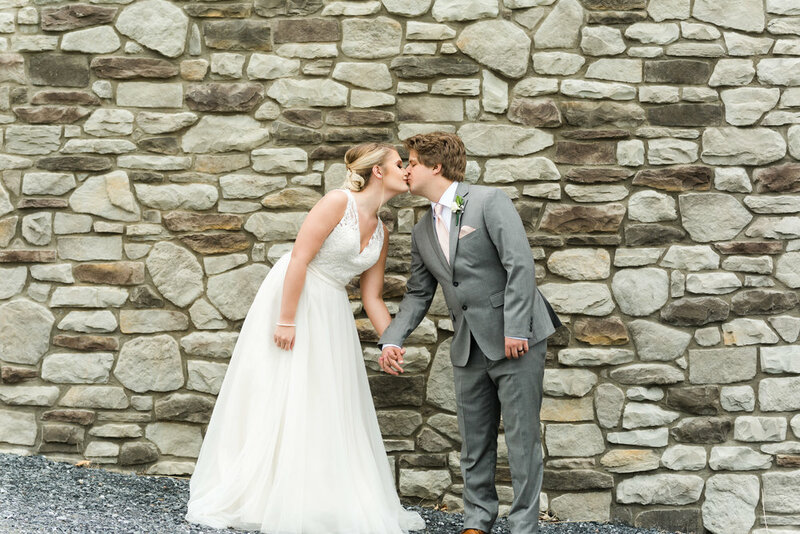 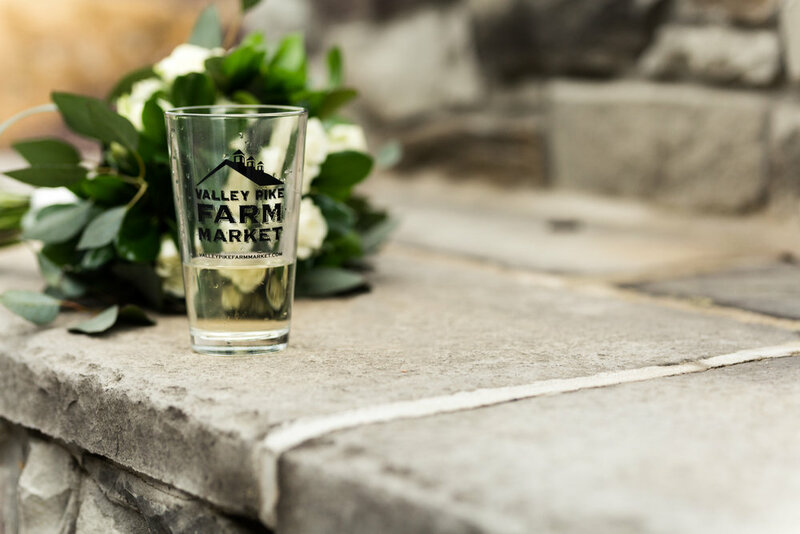 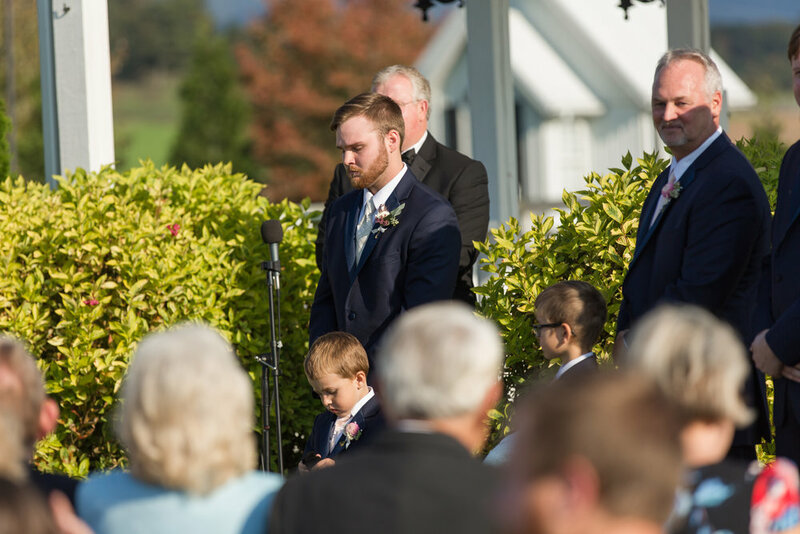 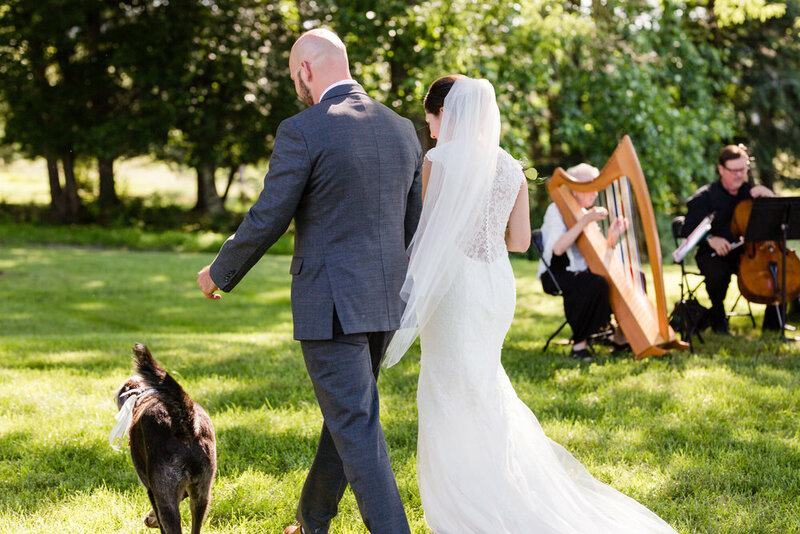 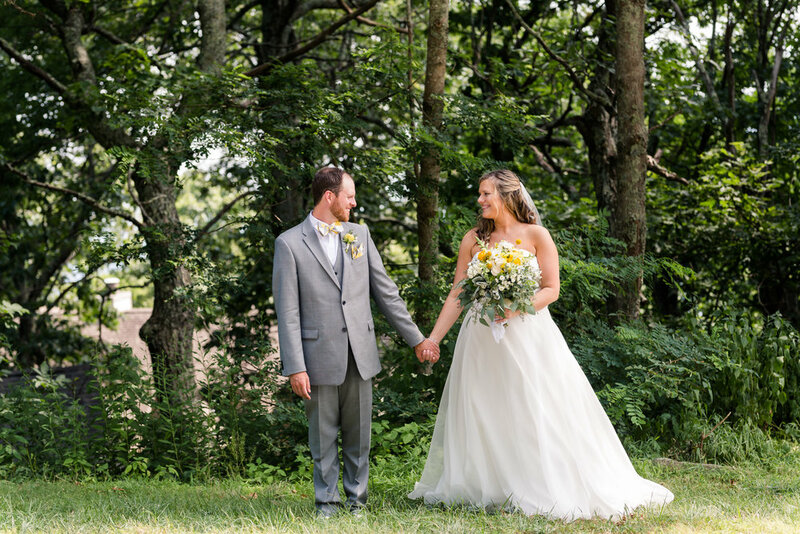 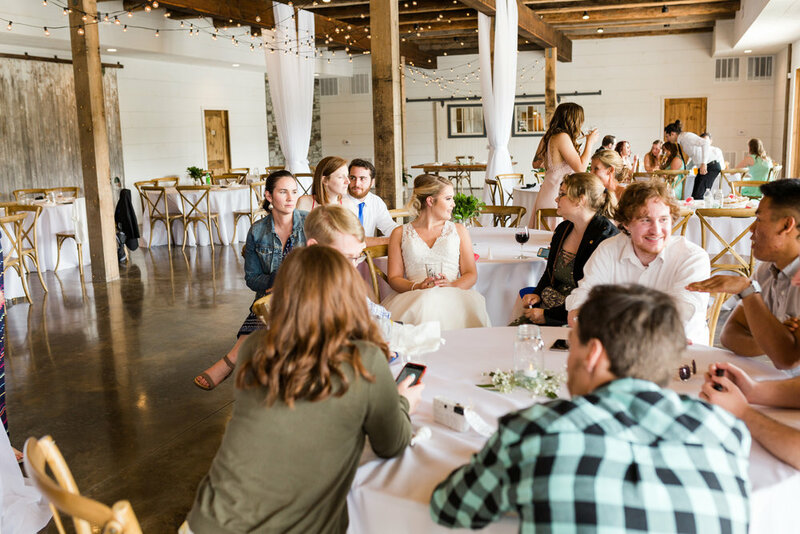 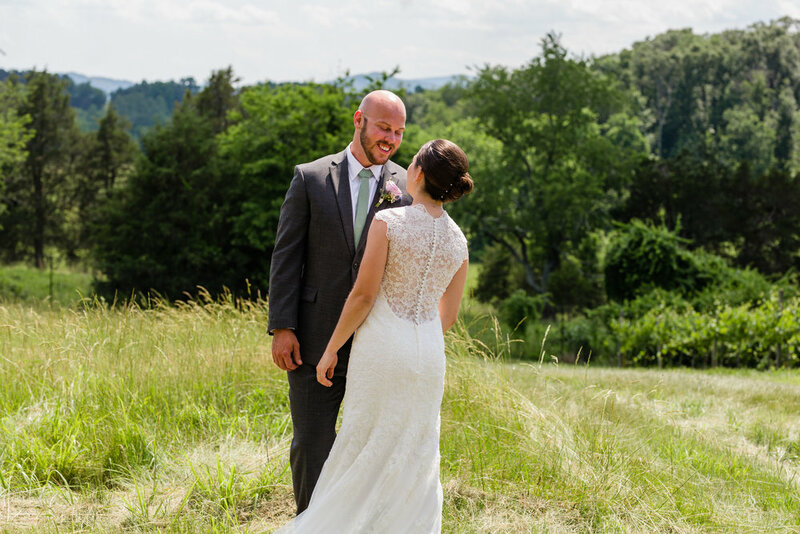 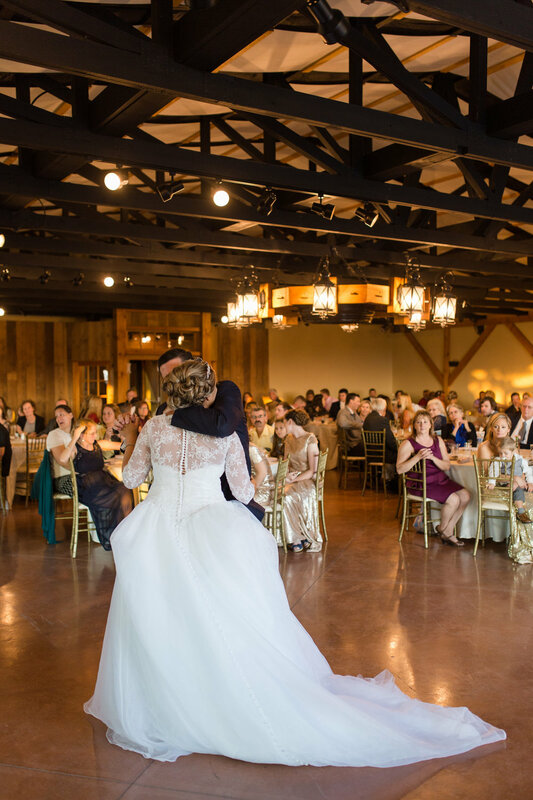 Tori and Chris chose to get married at The Granary at Valley Pike because of their love for the outdoors. 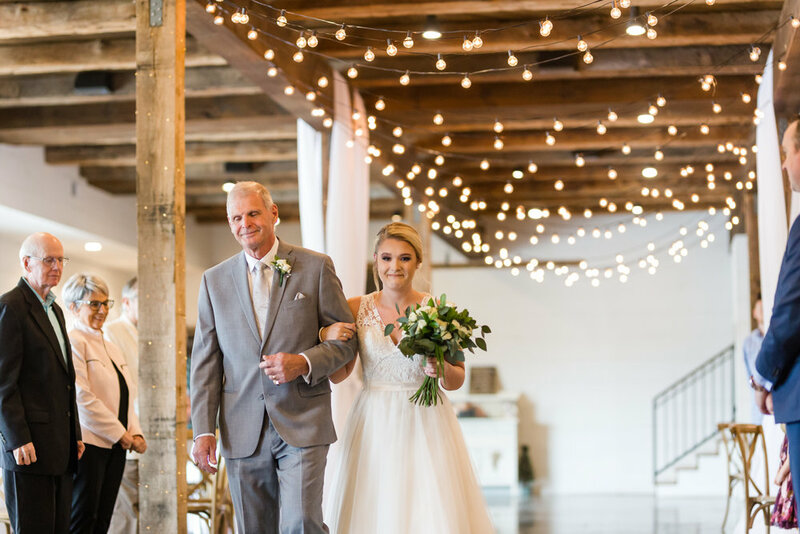 They had planned for an outdoor wedding but due to weather they decided to have their ceremony indoors which was equally as beautiful with the restored barnwood and natural light! 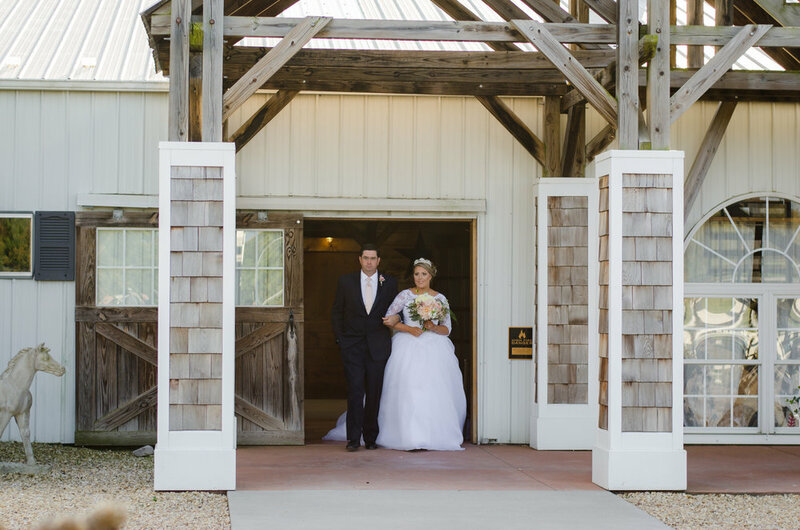 The Granary at Valley Pike is a newer wedding venue and I was so excited to get to shoot a wedding there, especially this wedding! 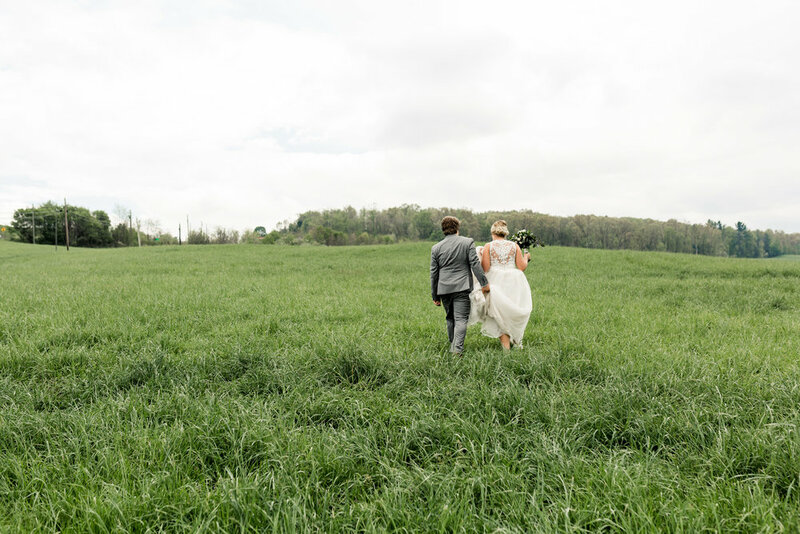 The fields were so green in contrast to the white and brown barn. 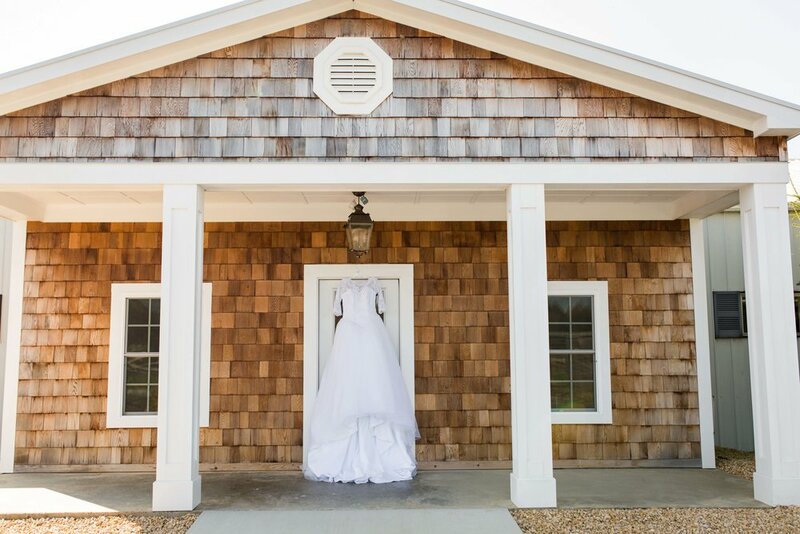 Their bridal and groom suites are so pretty too and the girls robes looked perfect in the white washed wood room. 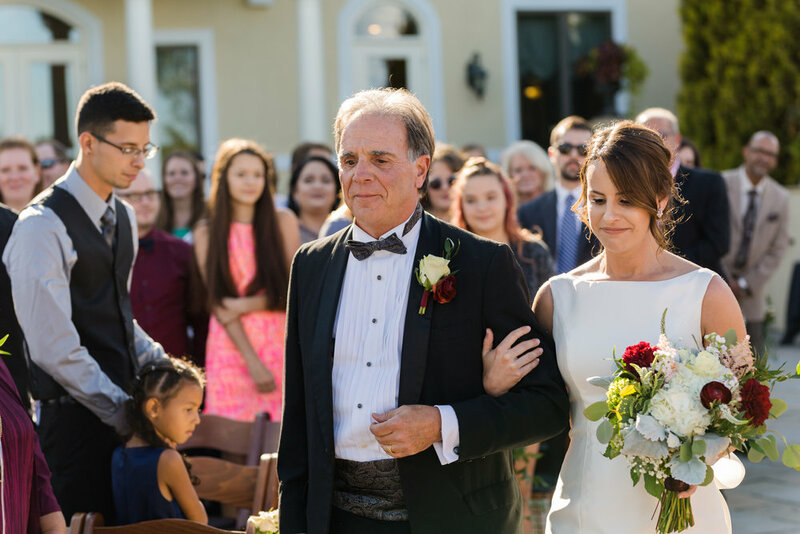 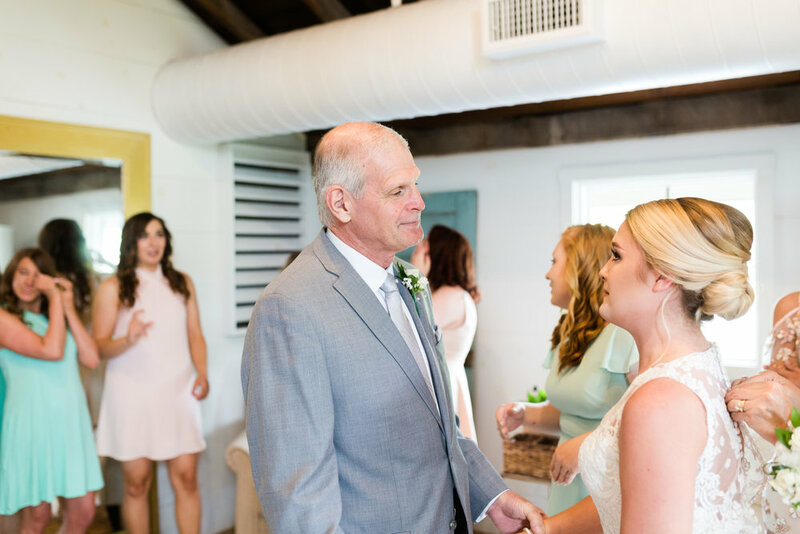 Tori had the sweetest first look with her dad while finishing getting ready, there wasn't a dry eye in the room!! 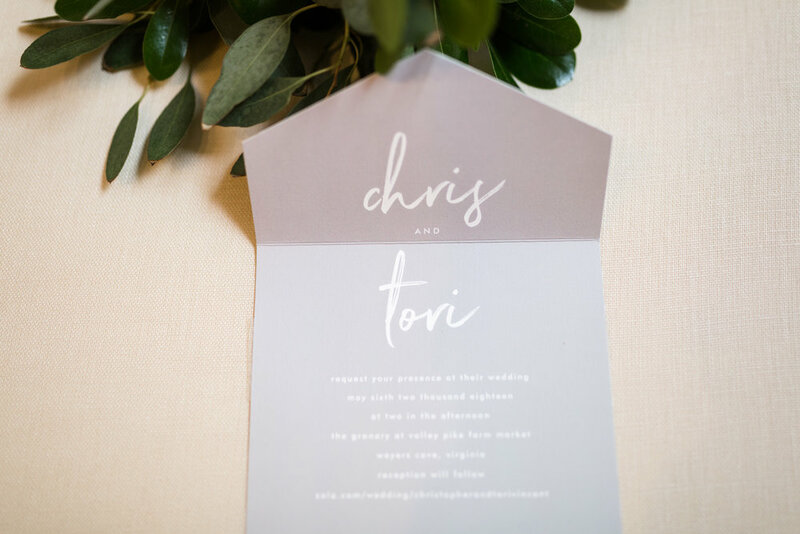 Tori and Chris are so laid back and their entire wedding day reflected the ease and comfort they share in their love. 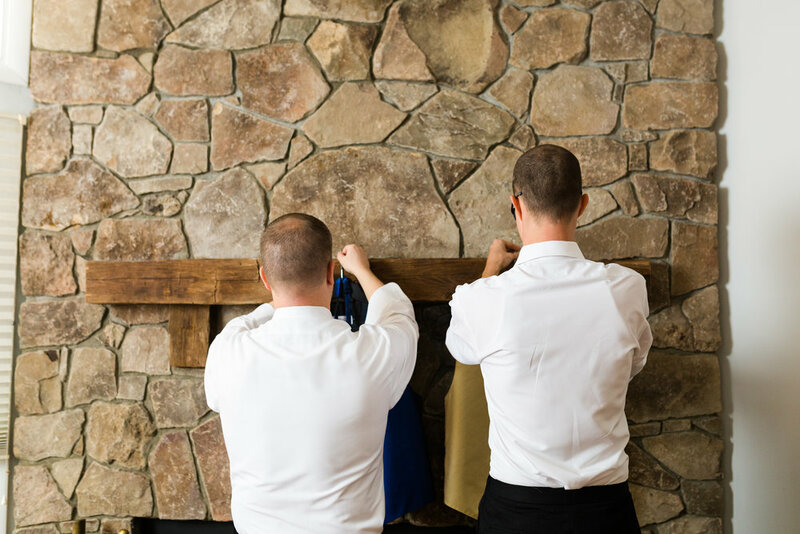 They chose to spend a few minutes alone after their ceremony which is such a special time to have. 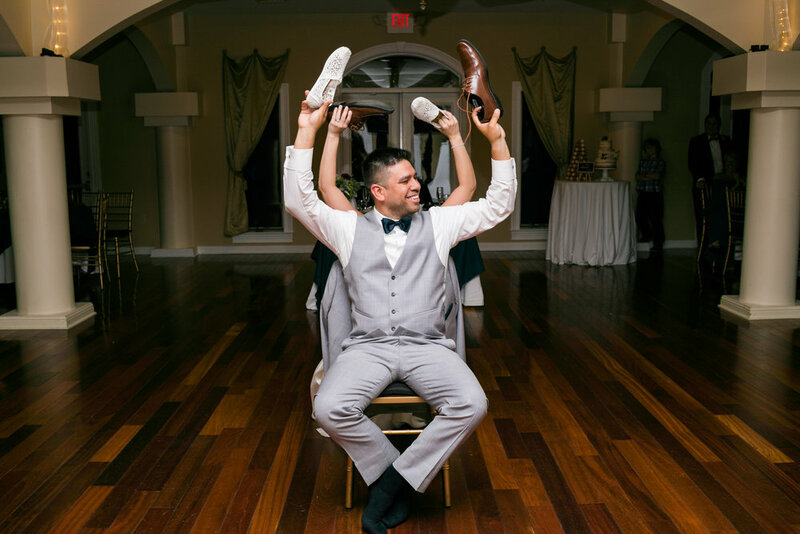 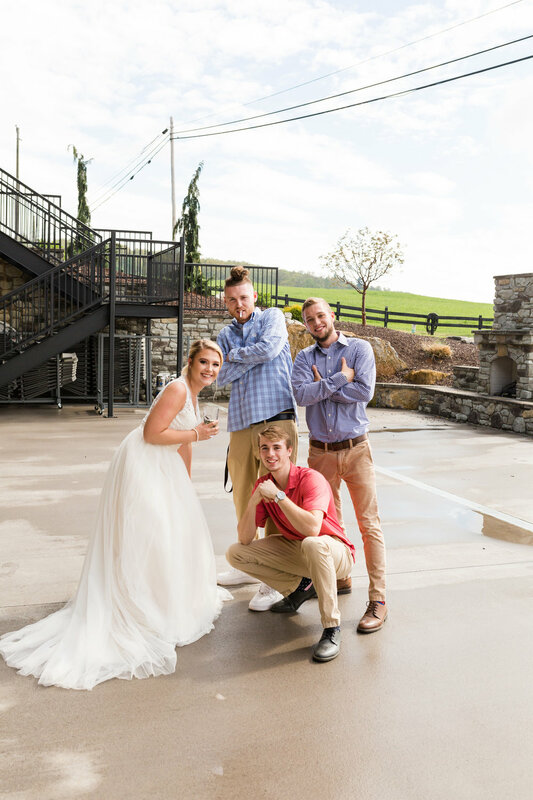 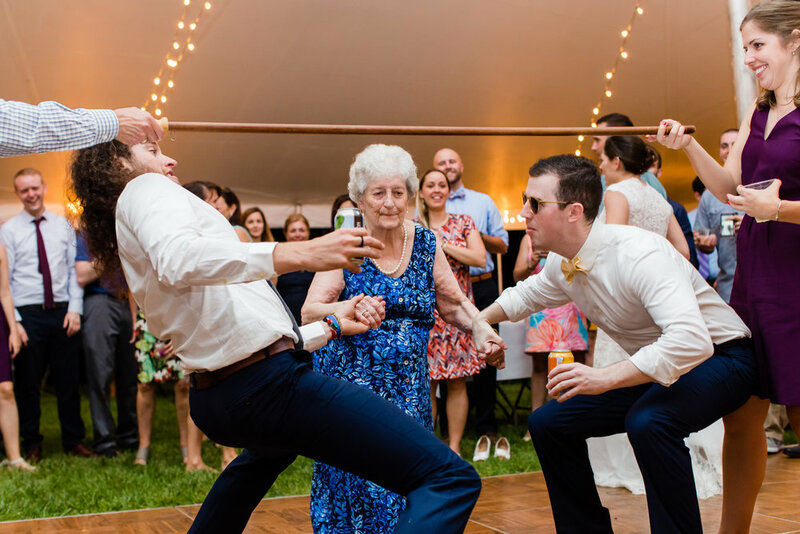 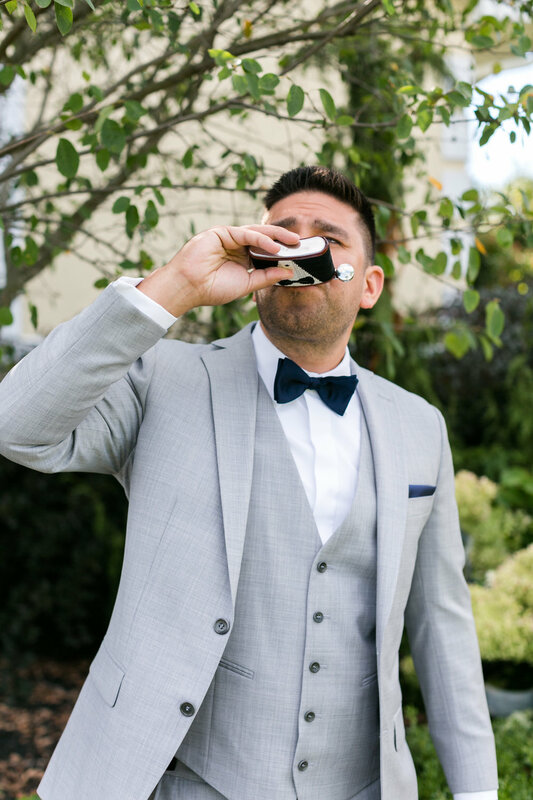 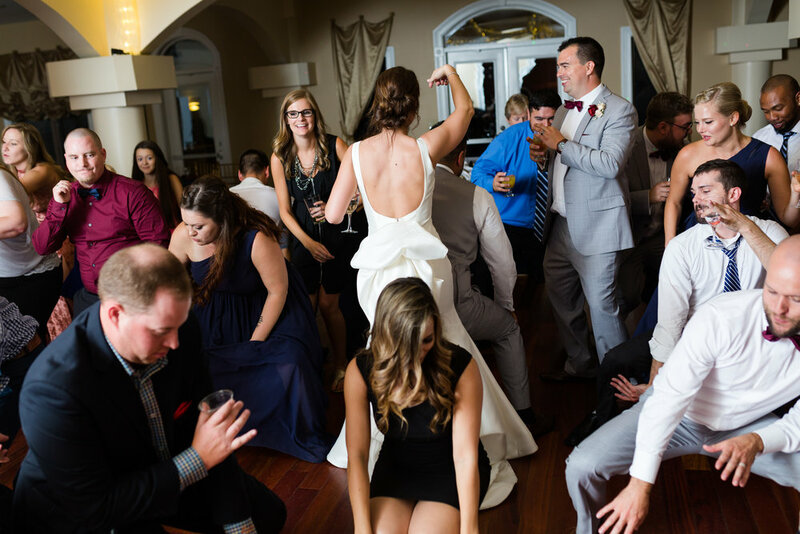 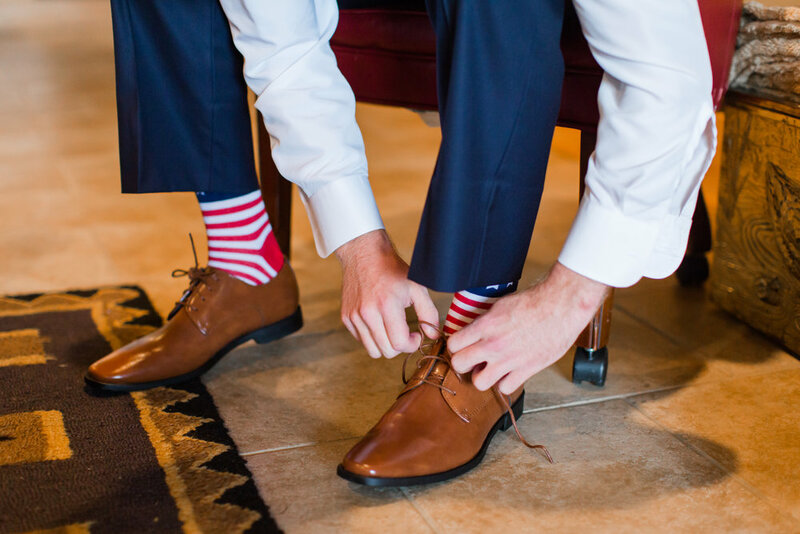 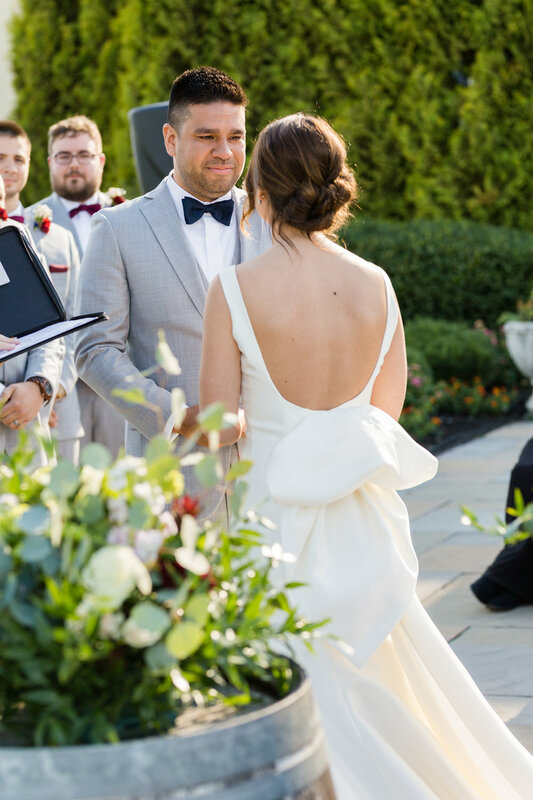 While they followed most of the common wedding traditions they also added a few unique details to their wedding, like the visit from the Virginia Tech Hokie bird. 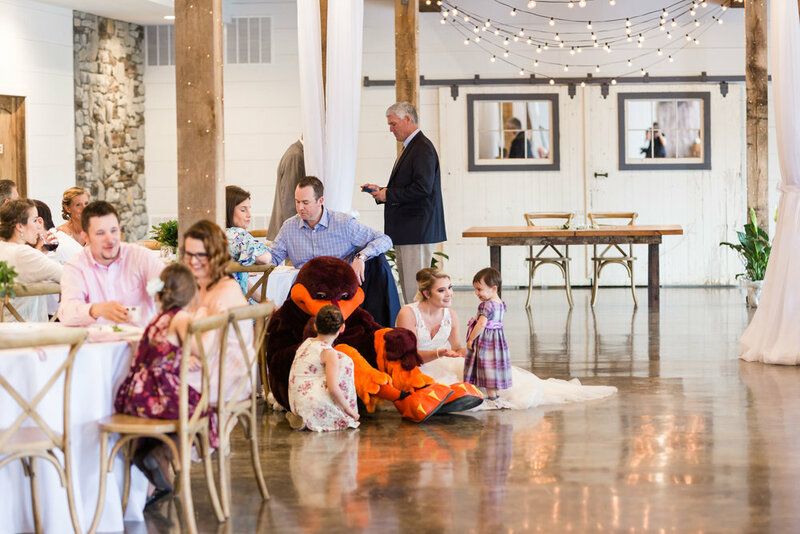 The Hokie bird joined us for some fun portraits and spent time with the guests at the start of the reception too. 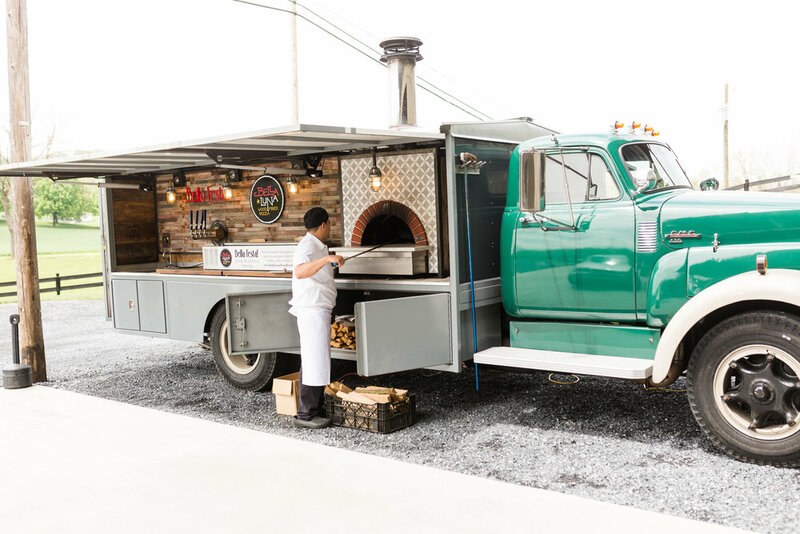 They also had the Bella Luna Pizza truck which was so delicious. 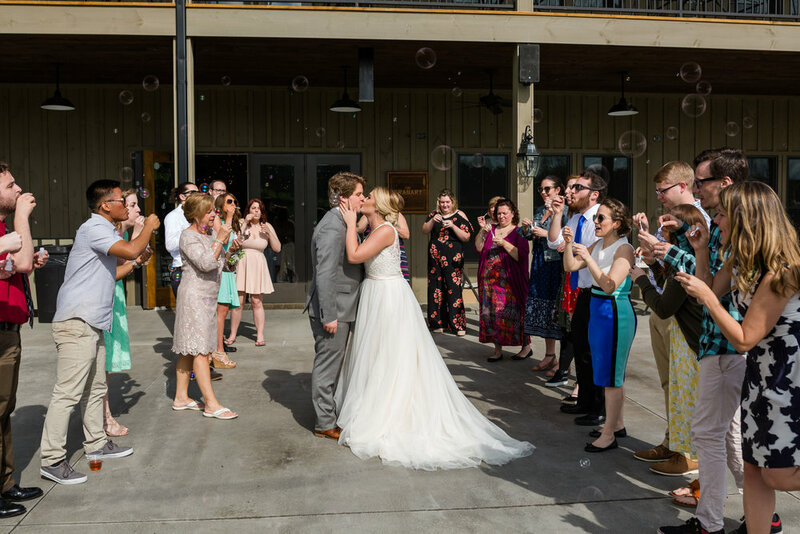 They ended the day with a bubble exit. 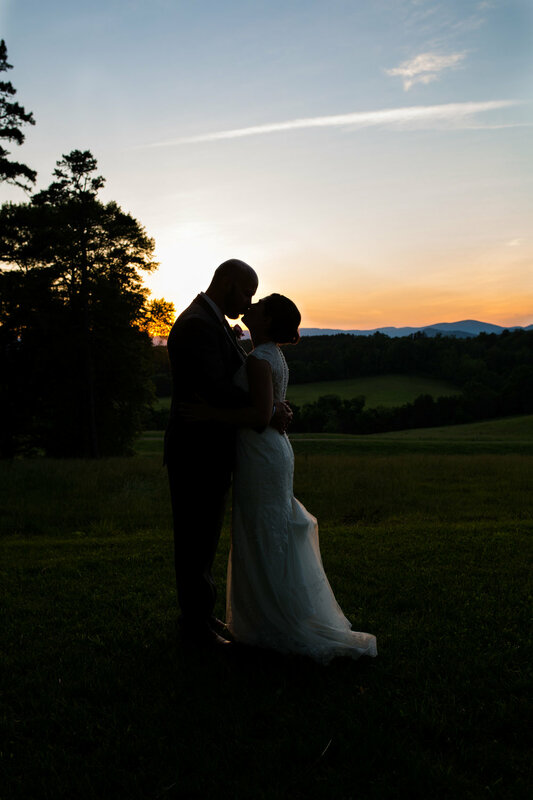 While spring weather may be unpredictable the lighting after rain is always beautiful. 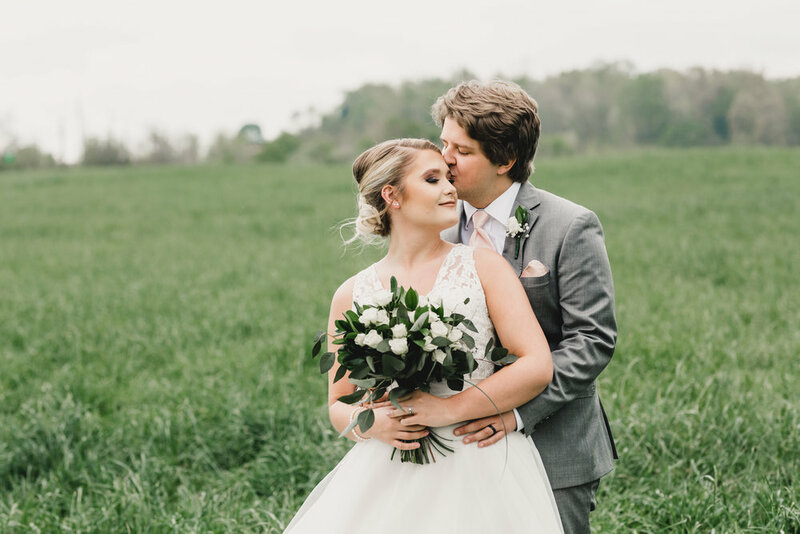 So after their bubble exit and the final rainfall for the day we went back into the fields for some beautiful bride and groom portraits. 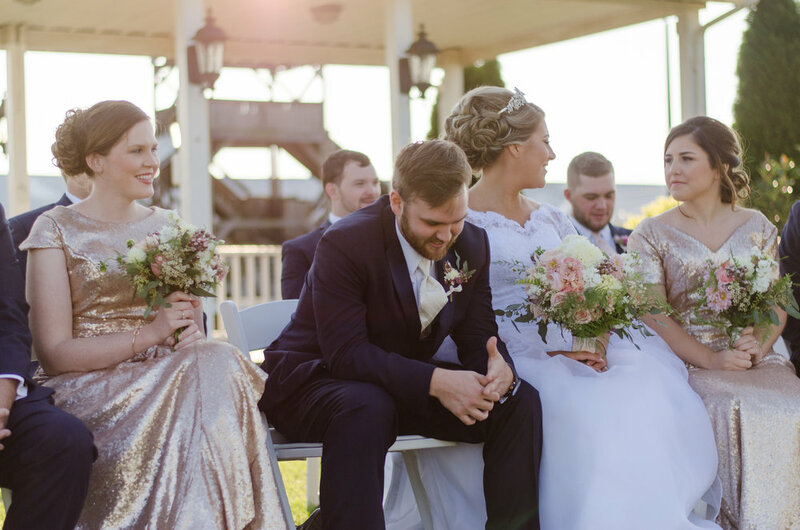 I loved the timing of these portraits because most of the guests had left and the bride and groom were feeling elated from being married, but also relaxed and at ease from the pressure of their wedding day. 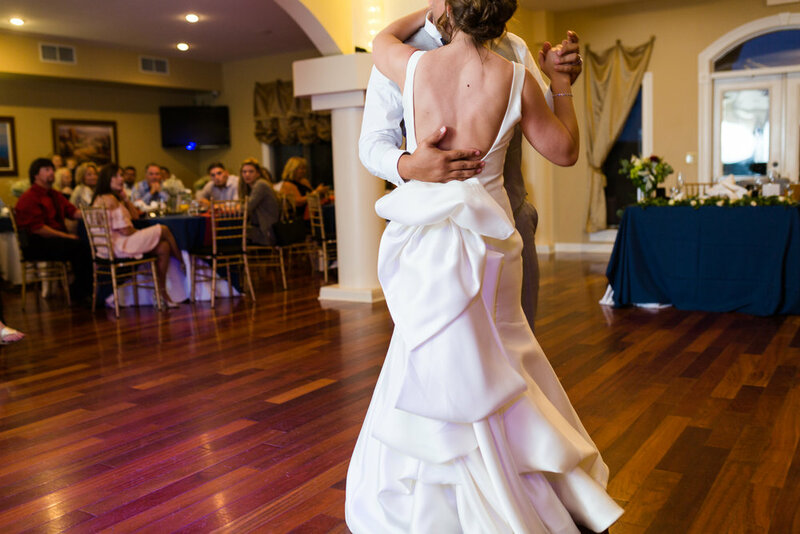 Tori's wedding dress was so much fun to photograph because it was so full of movement. 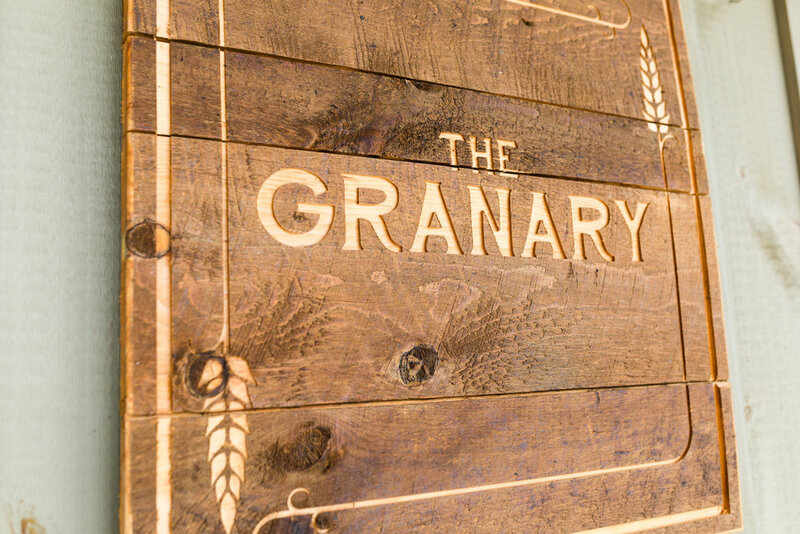 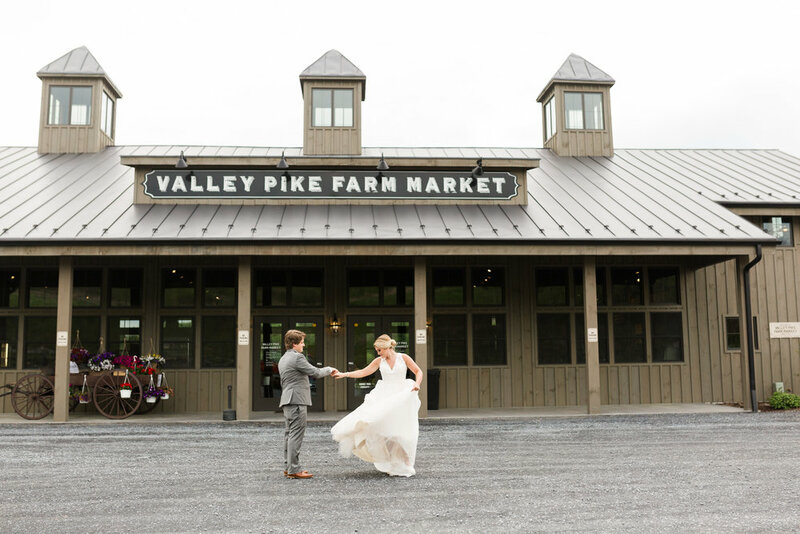 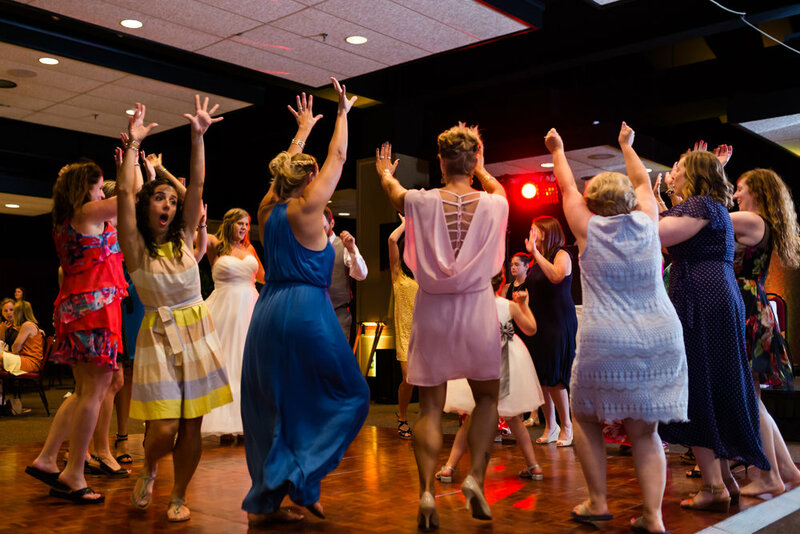 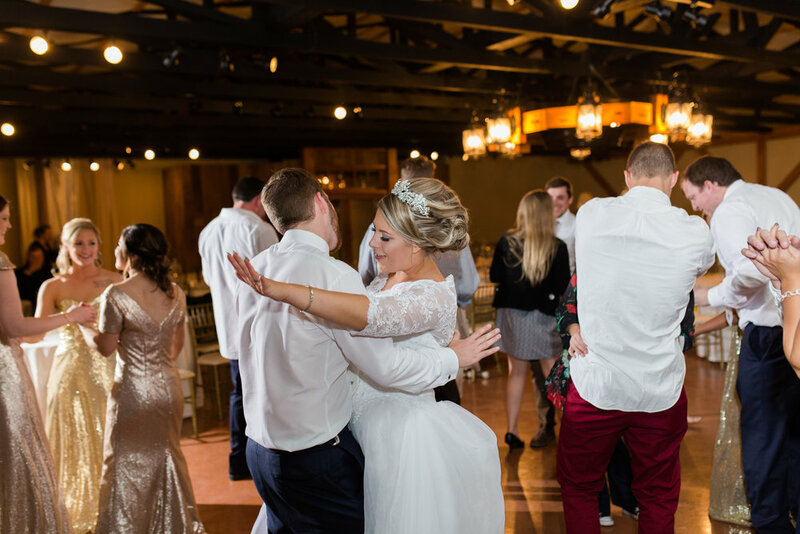 They walked, danced, and twirled all around the The Granary and Valley Pike Market! 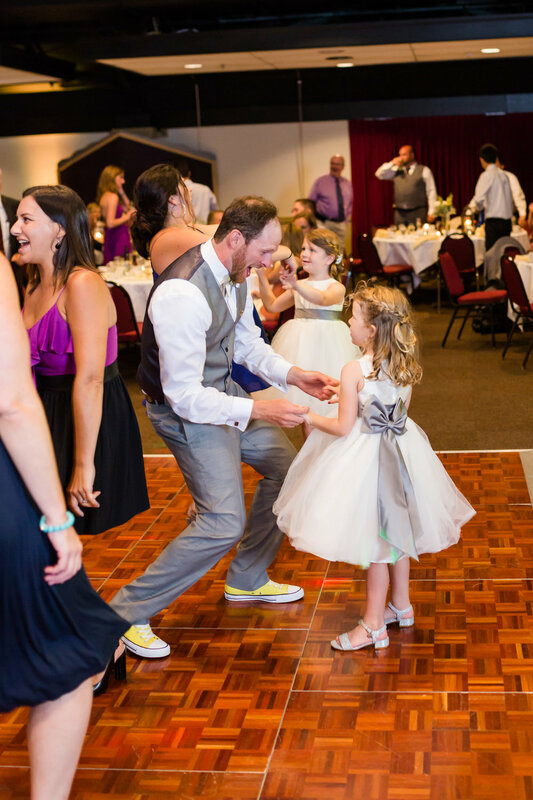 She also chose to wear comfortable and cute crotched Tom shoes which were perfect. 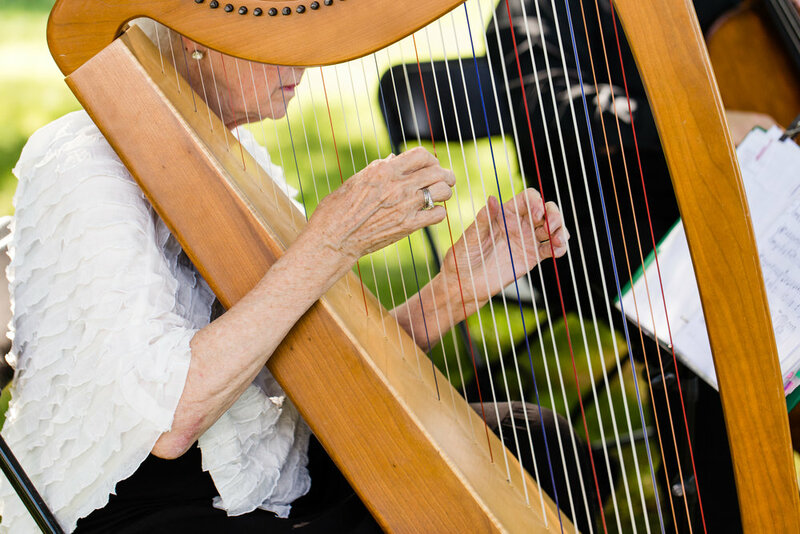 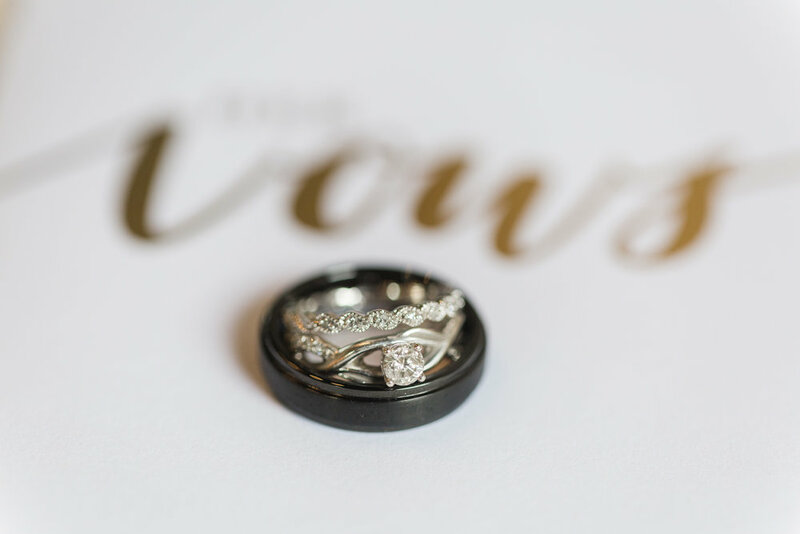 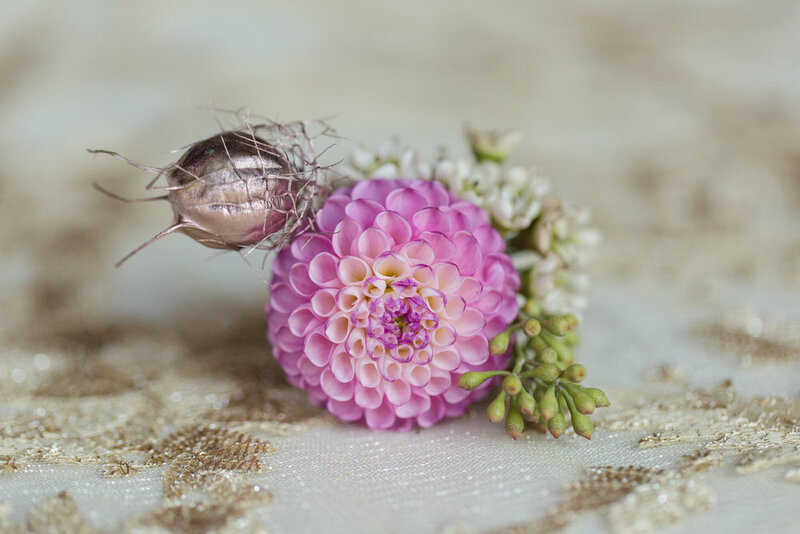 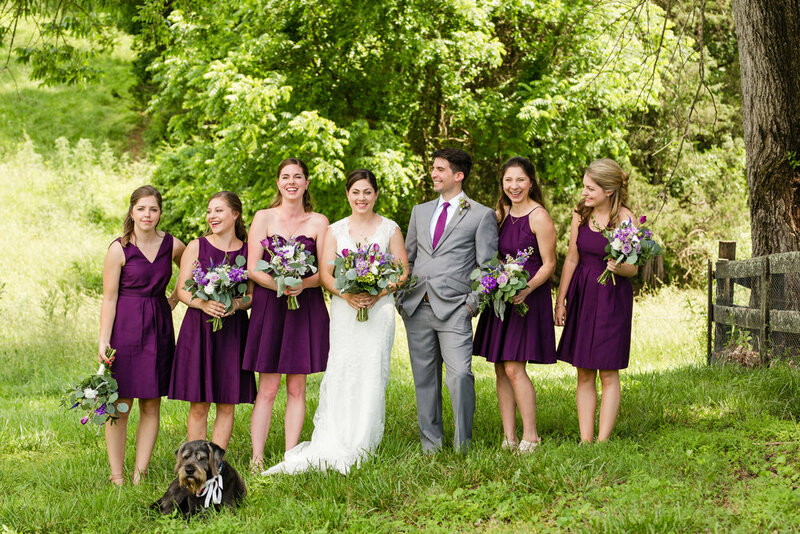 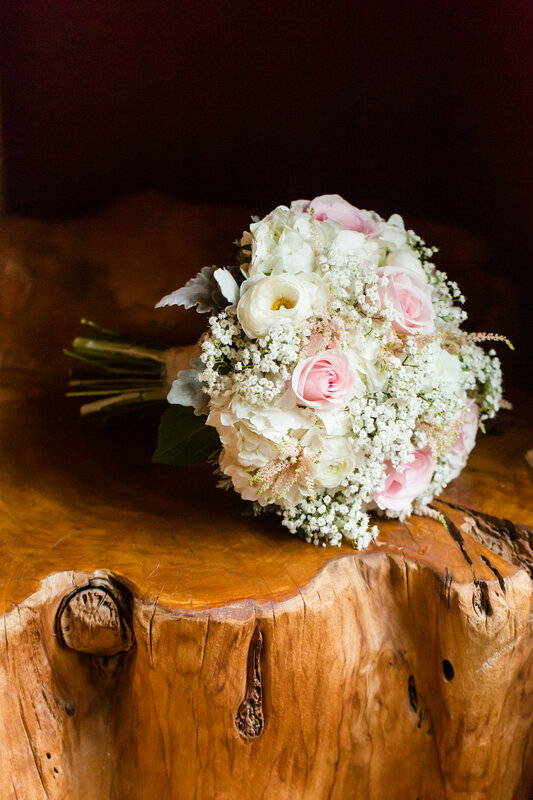 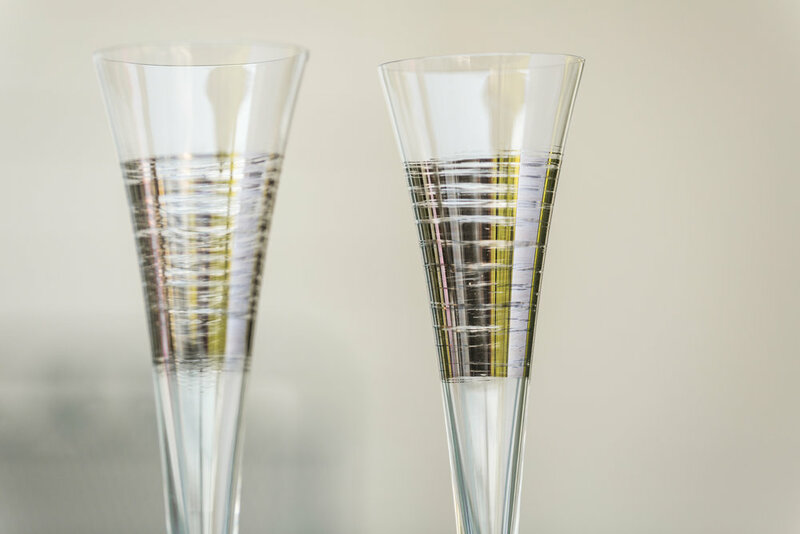 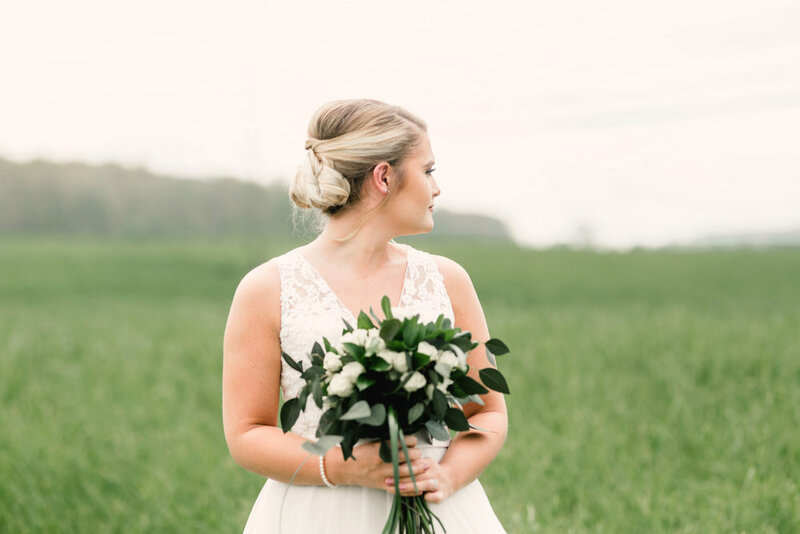 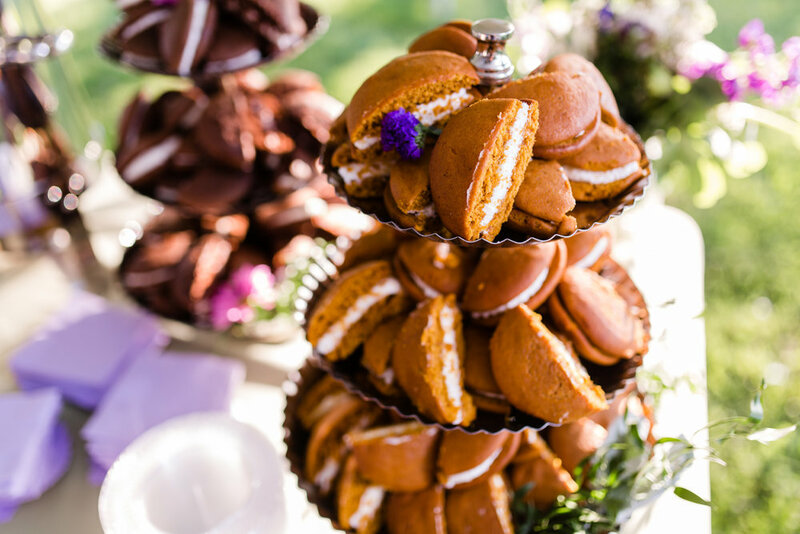 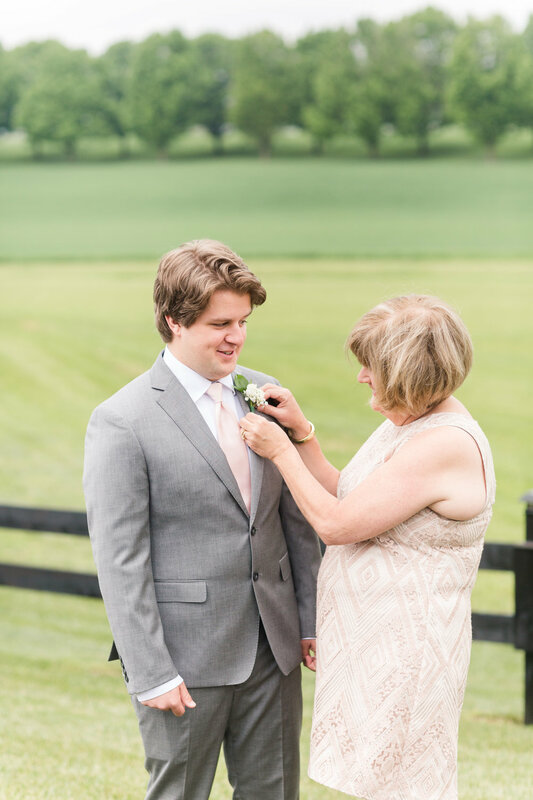 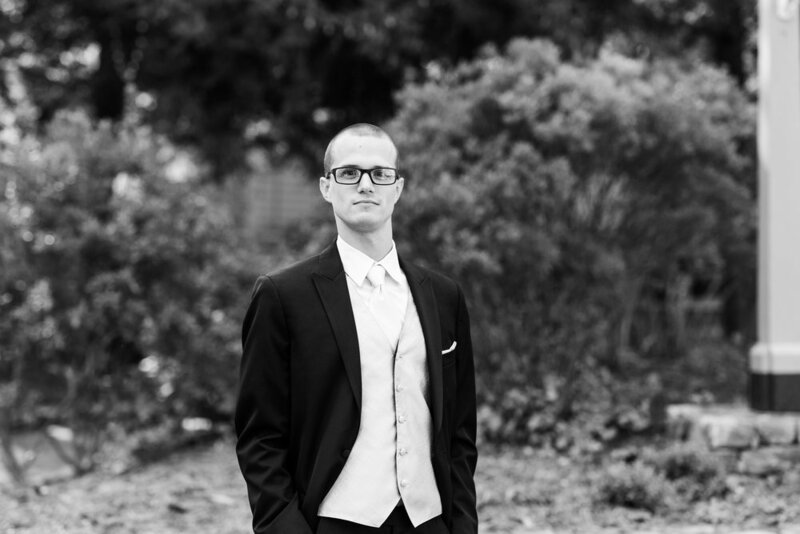 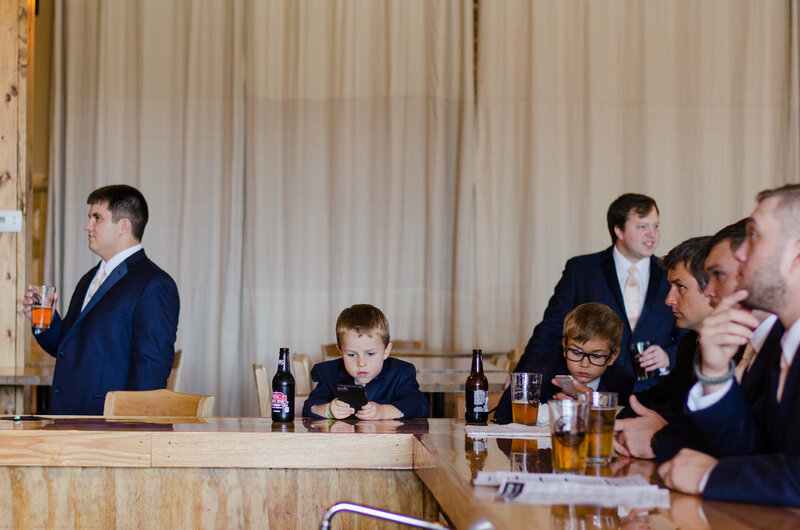 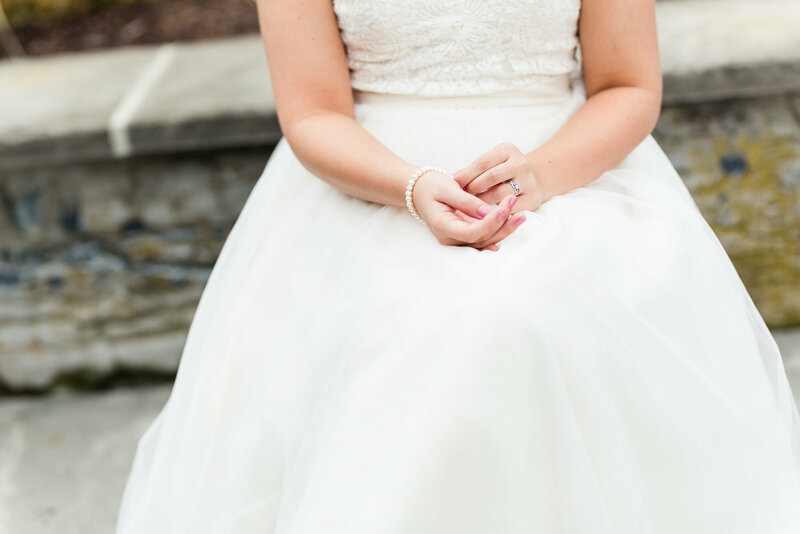 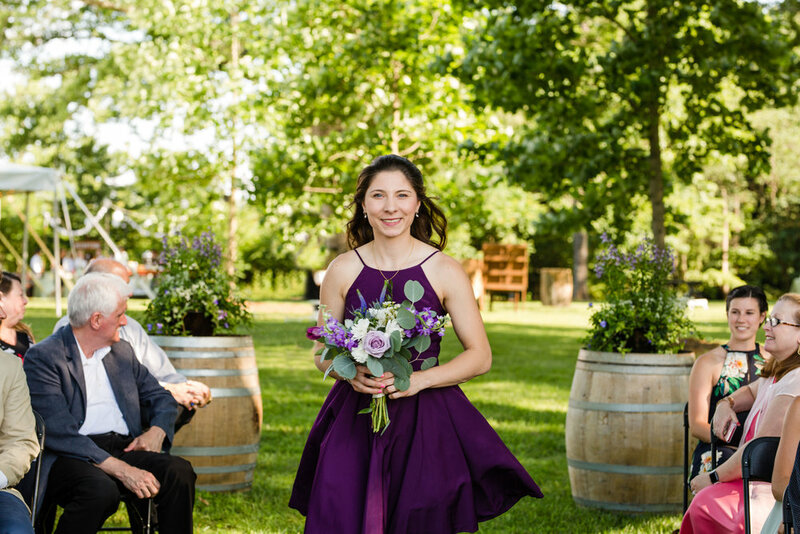 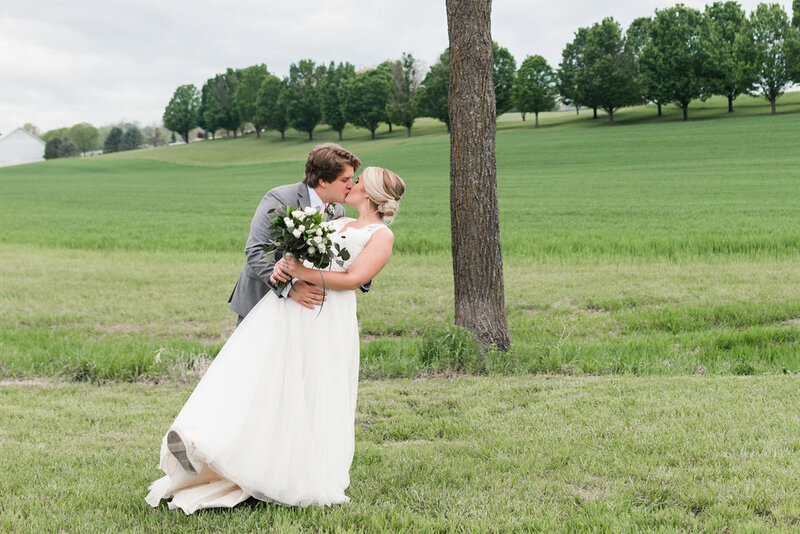 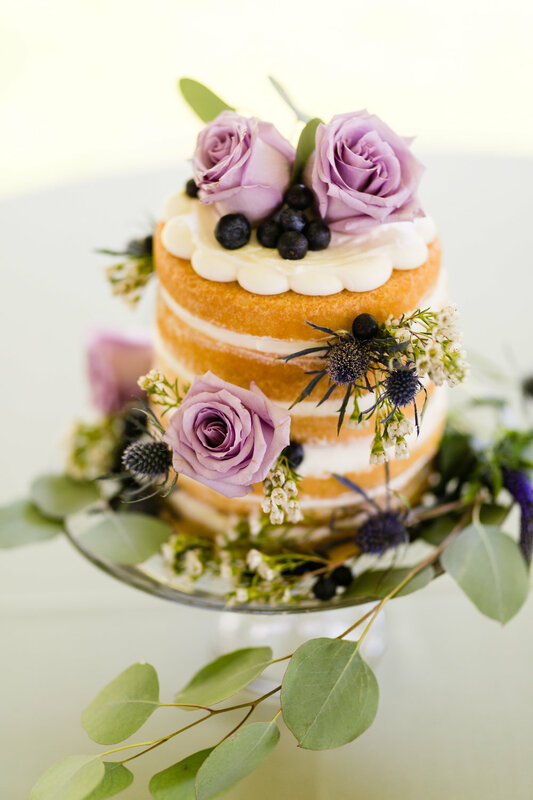 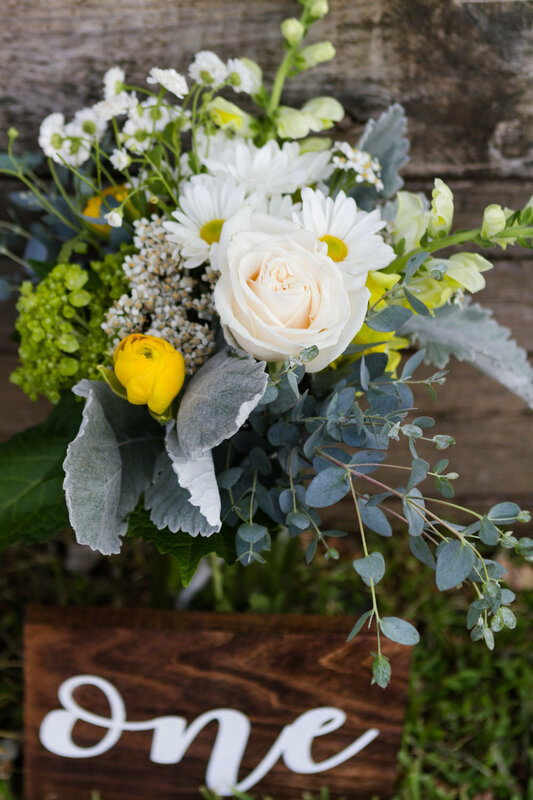 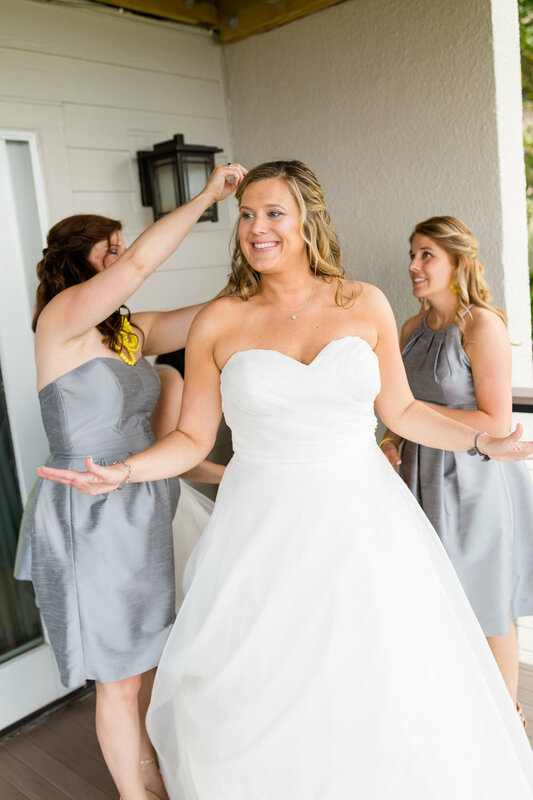 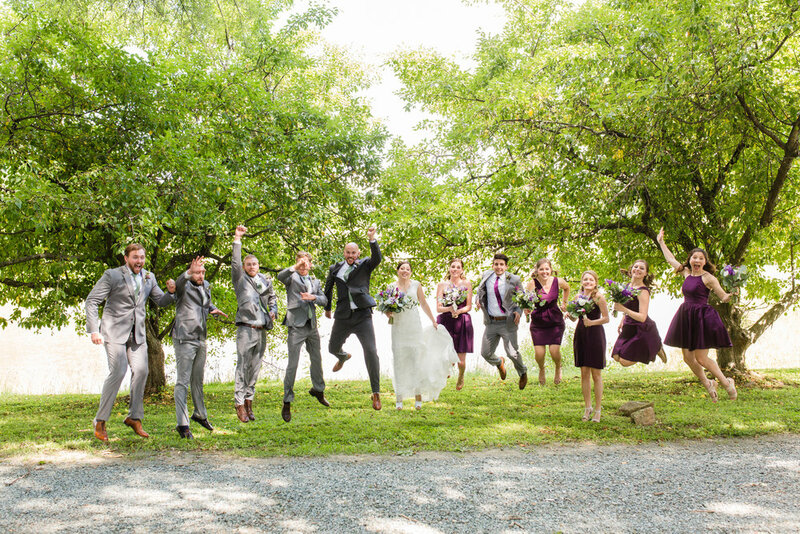 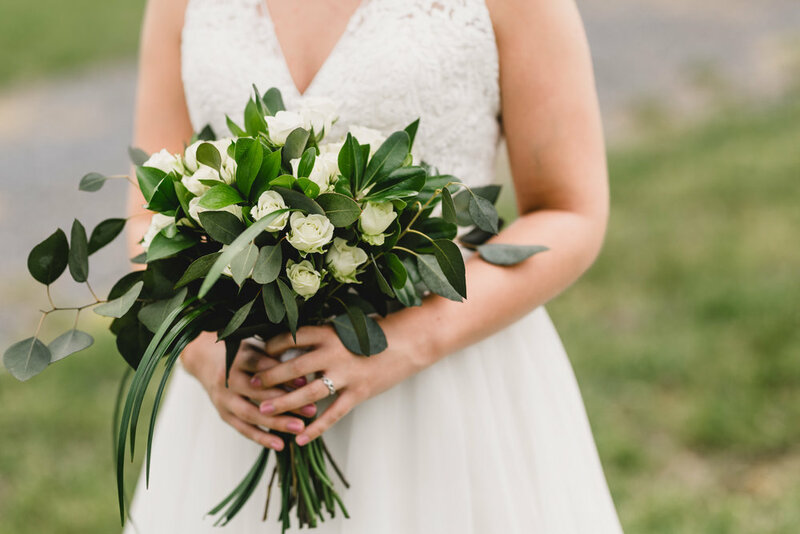 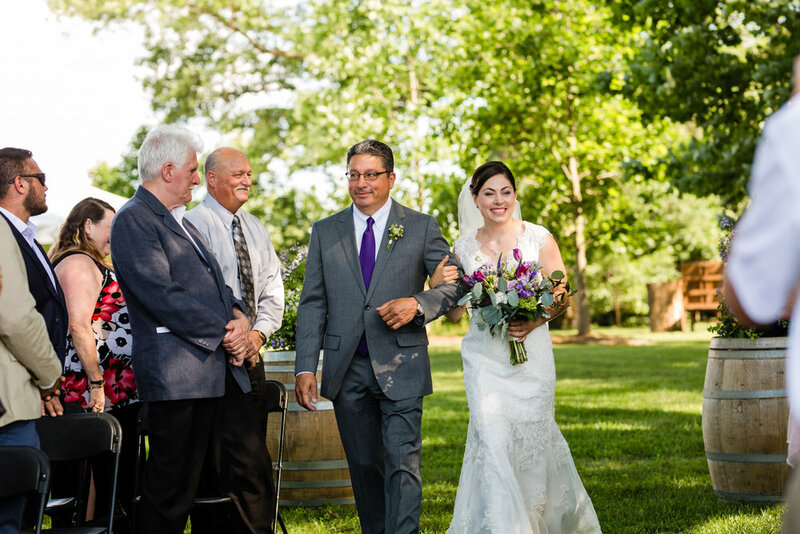 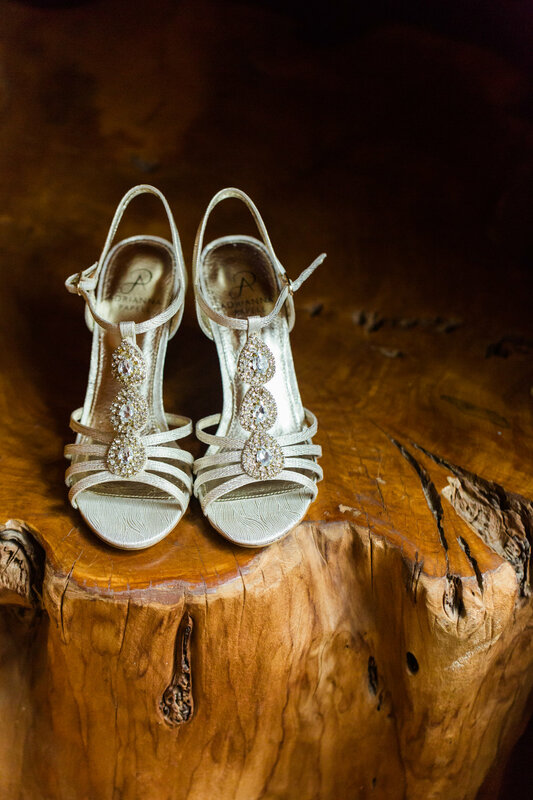 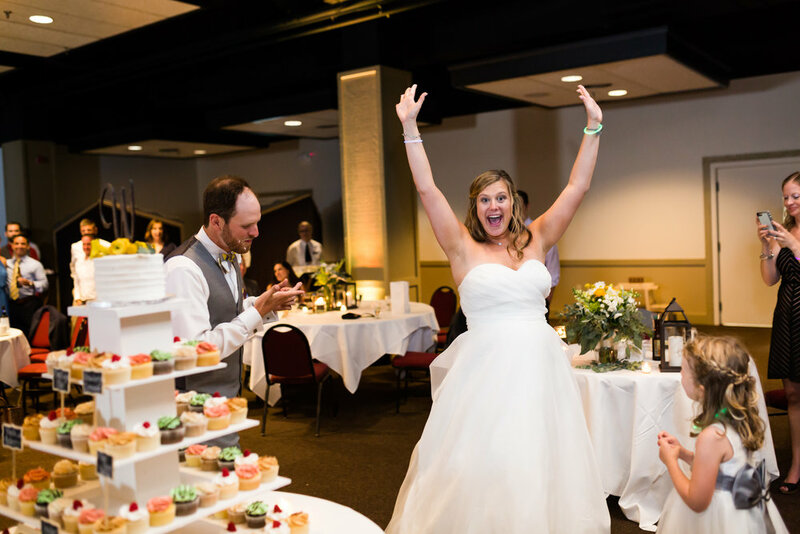 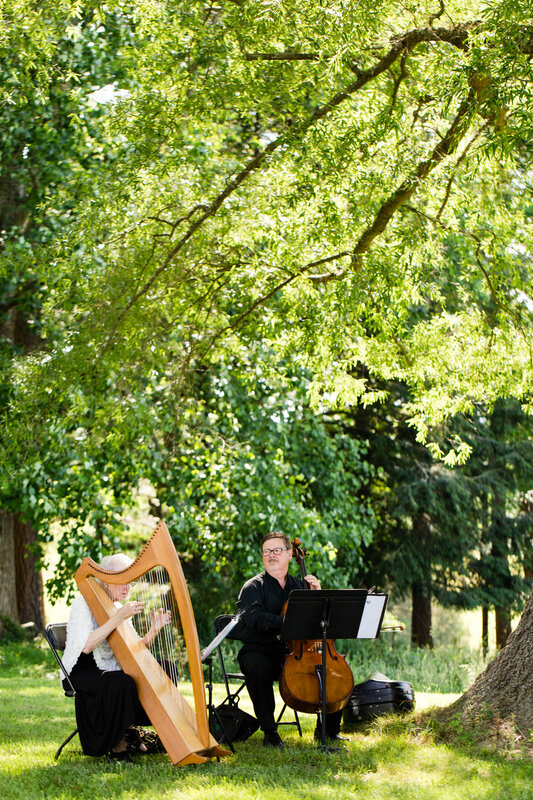 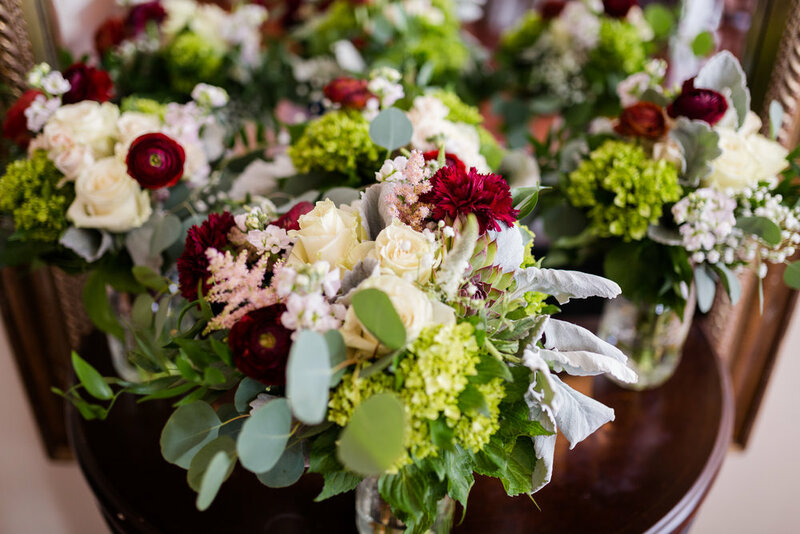 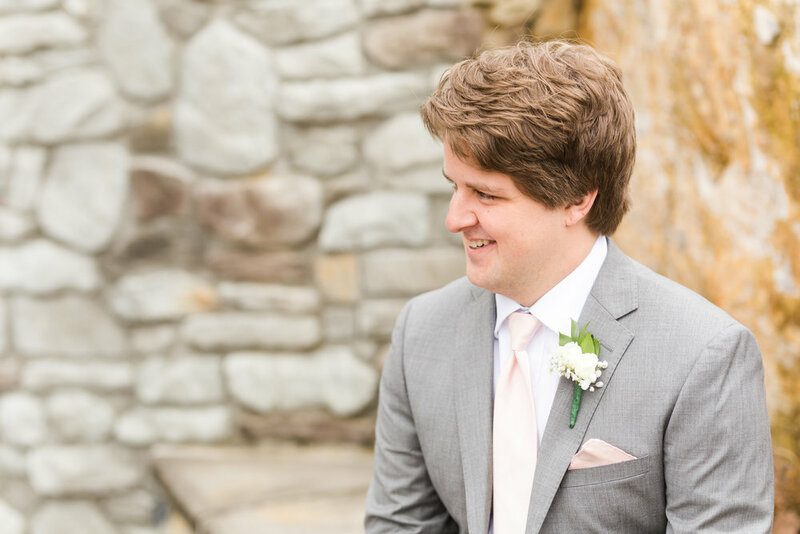 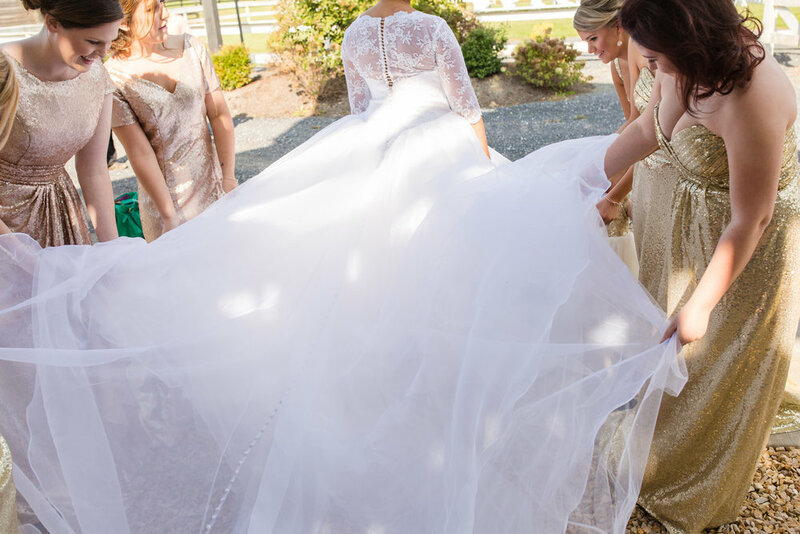 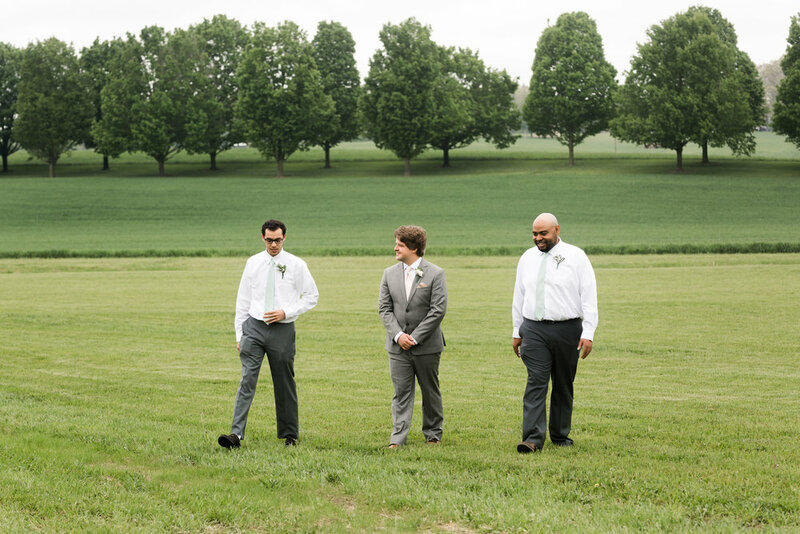 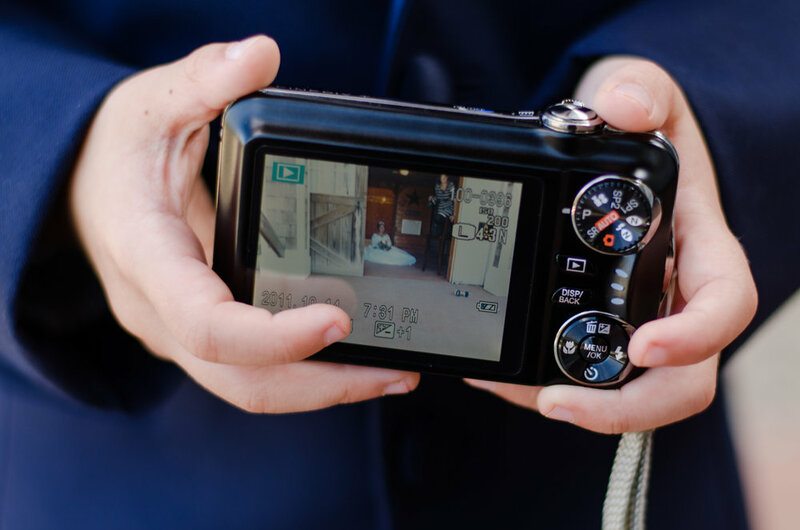 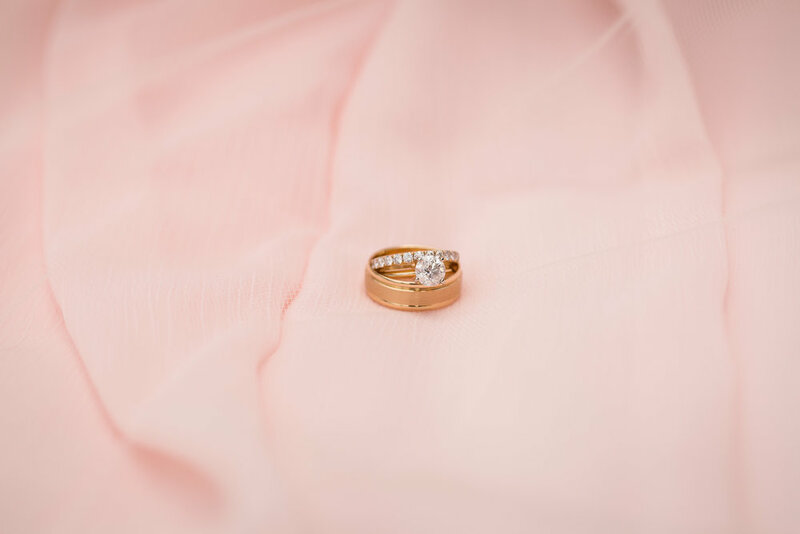 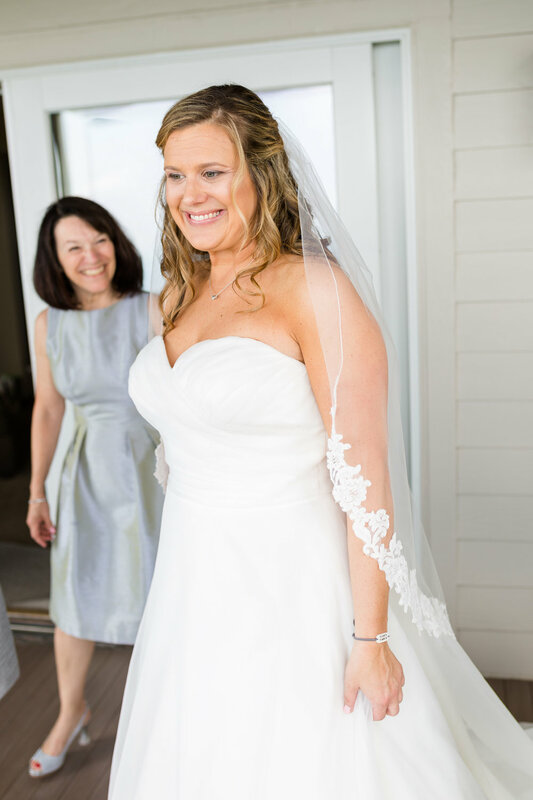 Enjoy this the images from this beautiful mostly outdoor spring wedding at The Granary! 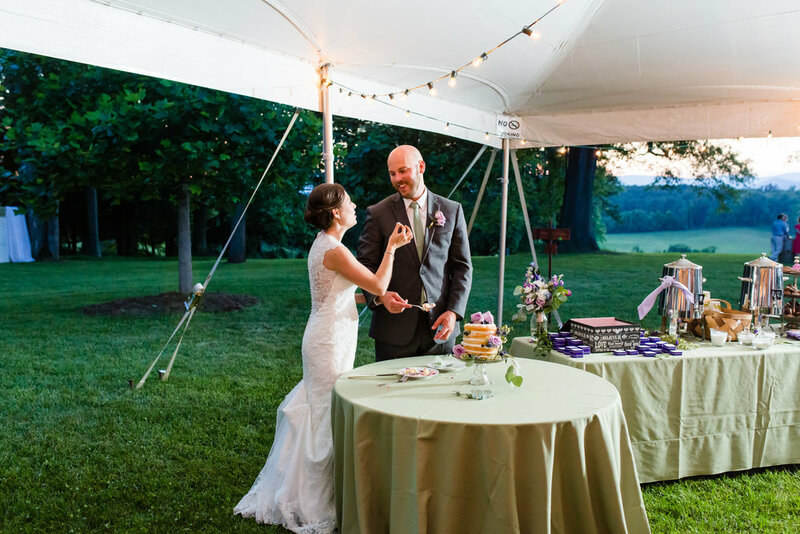 Special thanks to all the amazing vendors that made Tori and Chris' wedding day perfect! 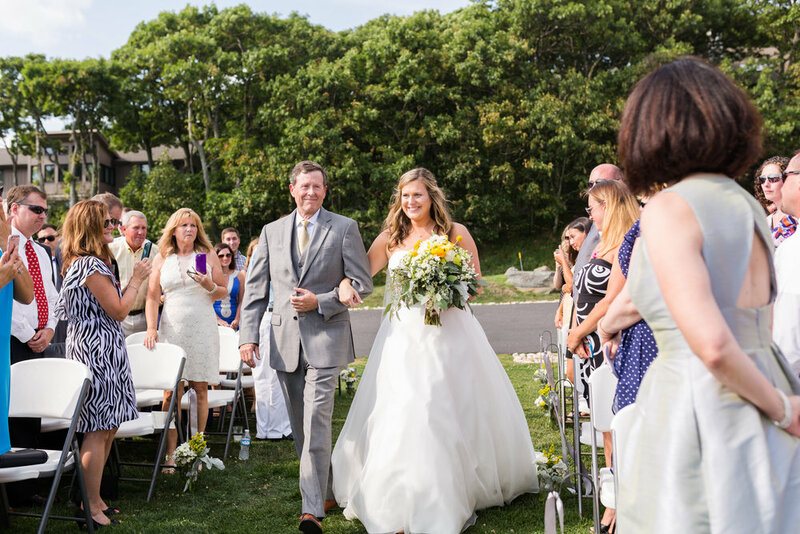 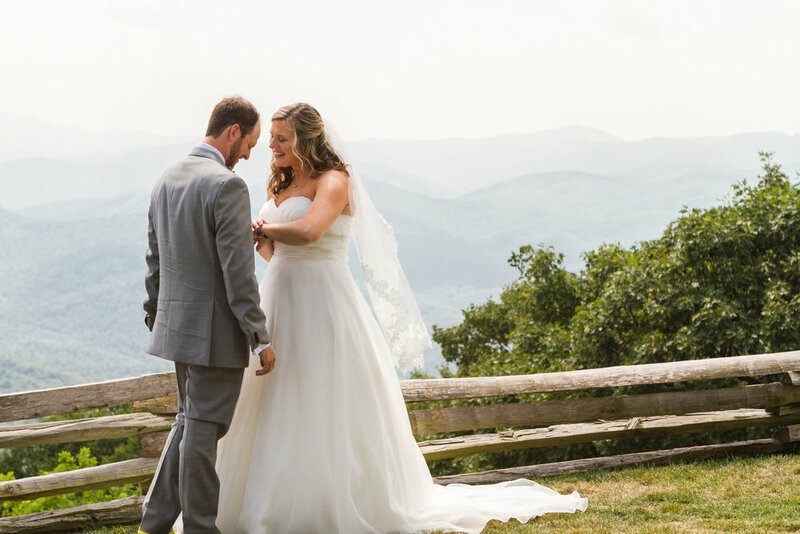 Jessica and Walt chose one of the most beautiful locations on the east coast for their wedding day! 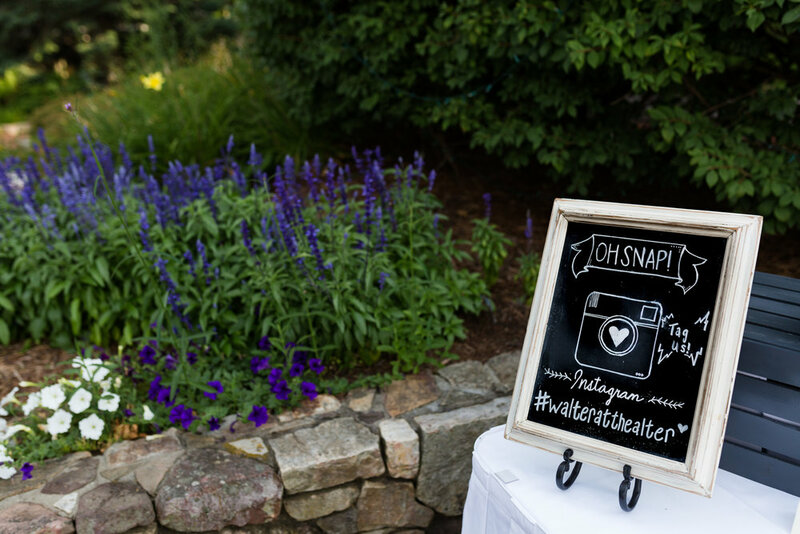 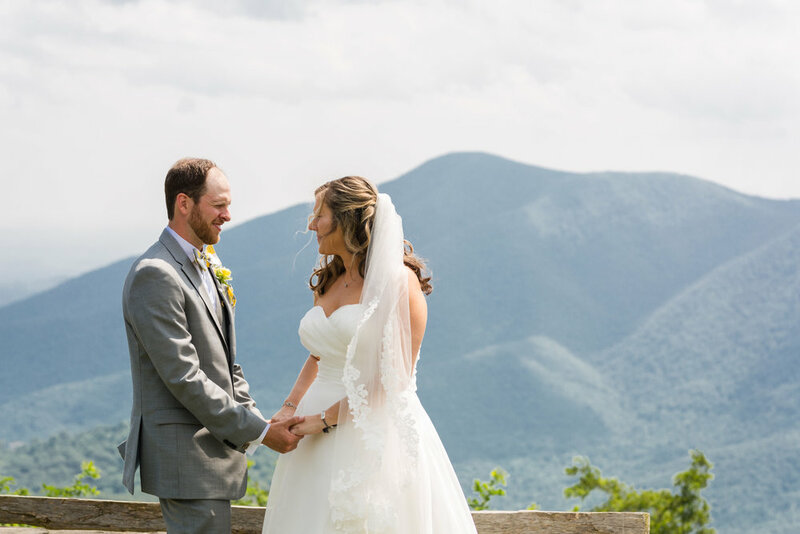 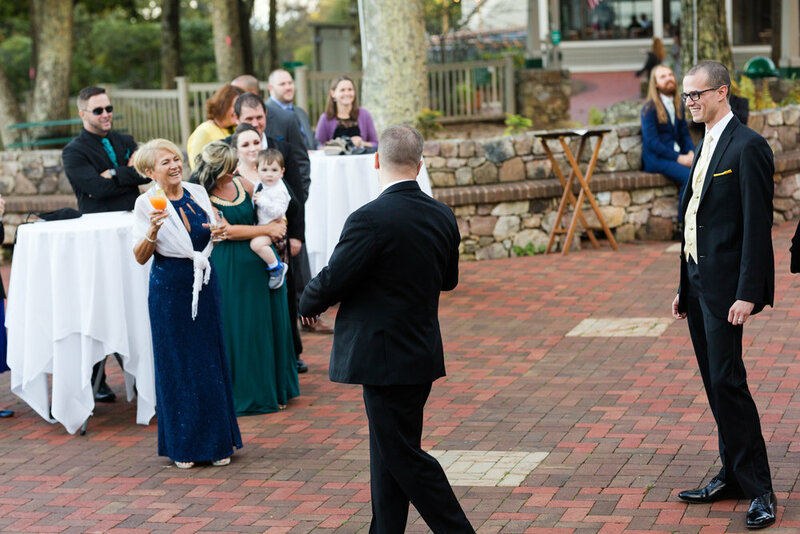 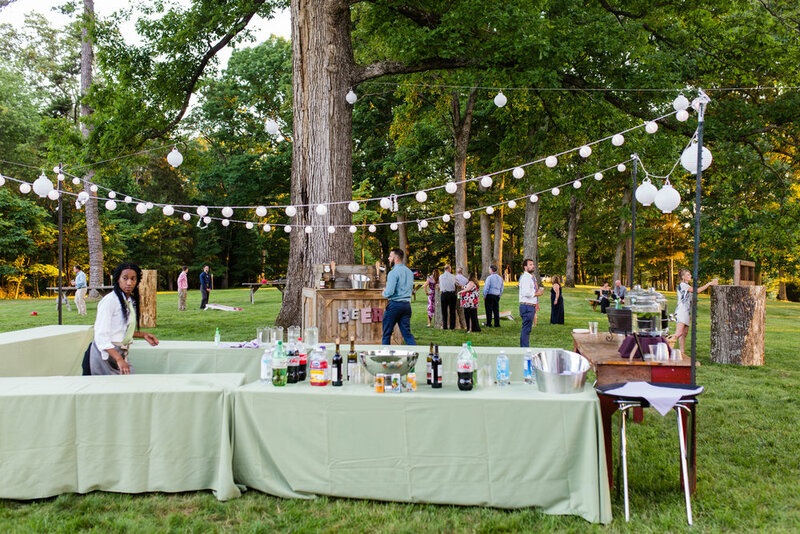 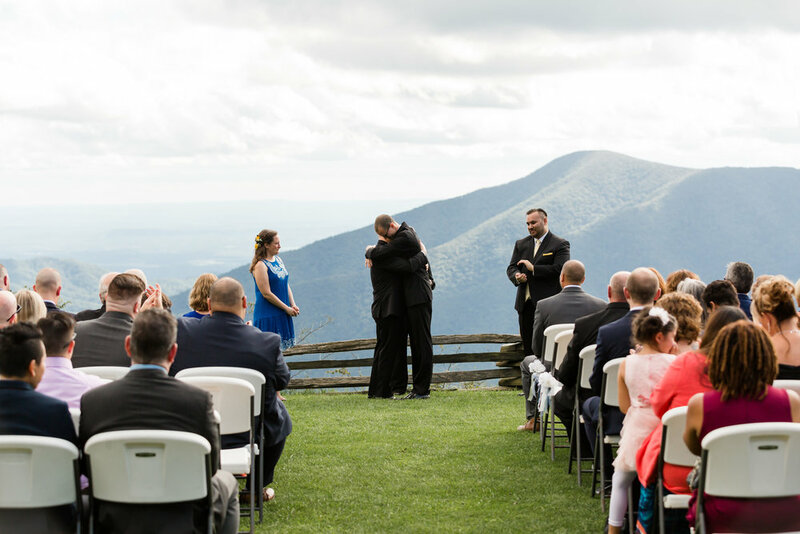 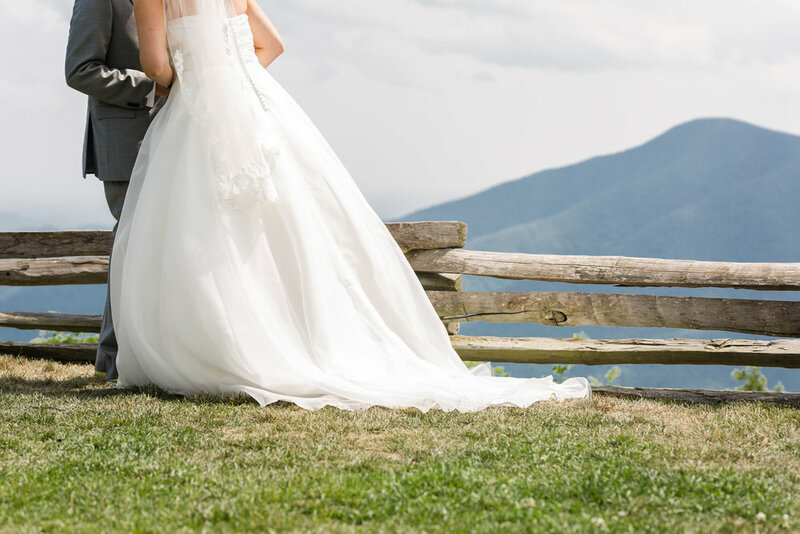 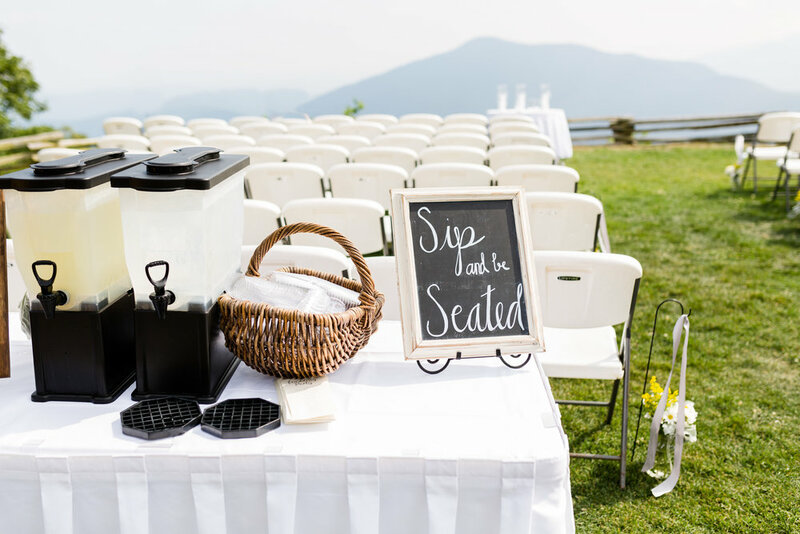 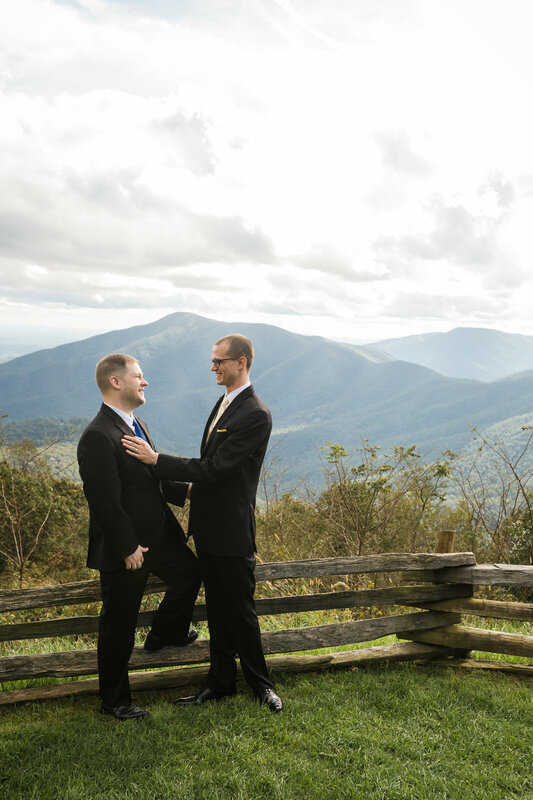 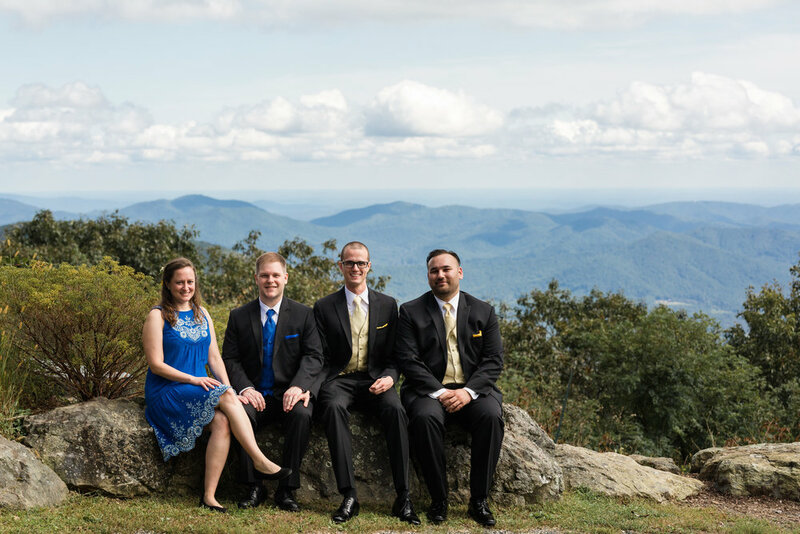 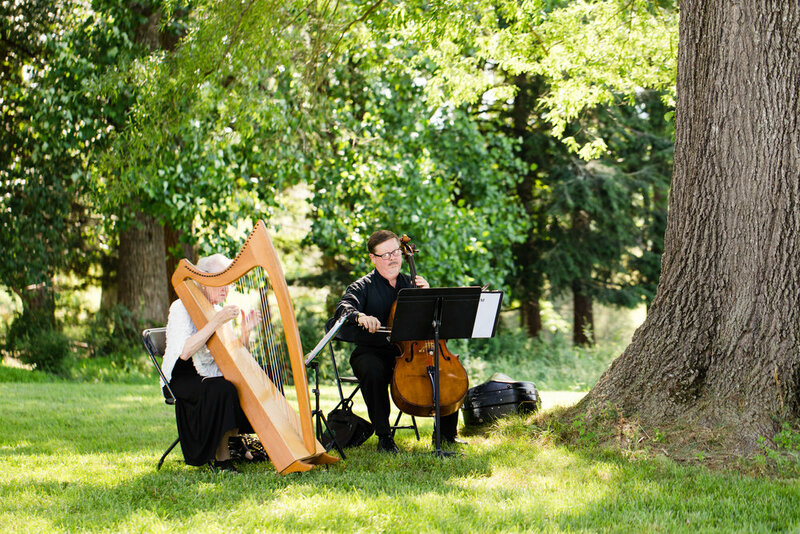 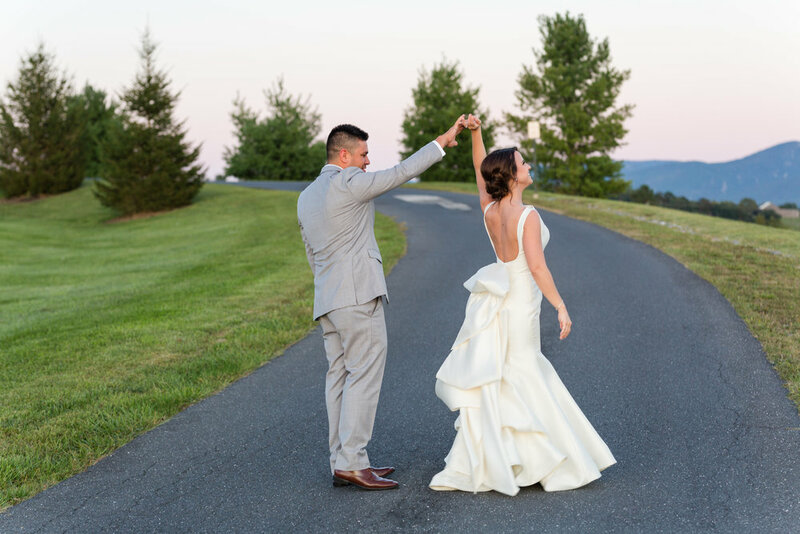 Wintergreen Resort has so many picturesque spots for an outdoor wedding. 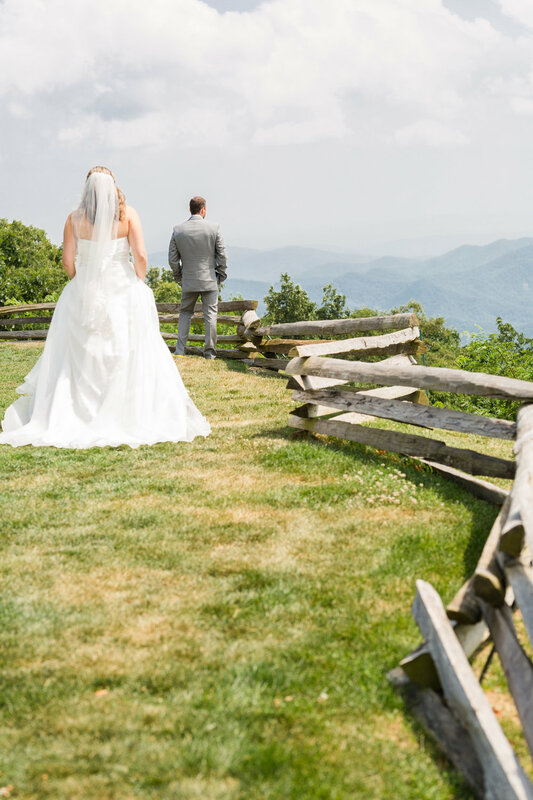 The Blue Ridge mountains in the summer are full of greenery, but still look blue which is what makes them so beautiful. 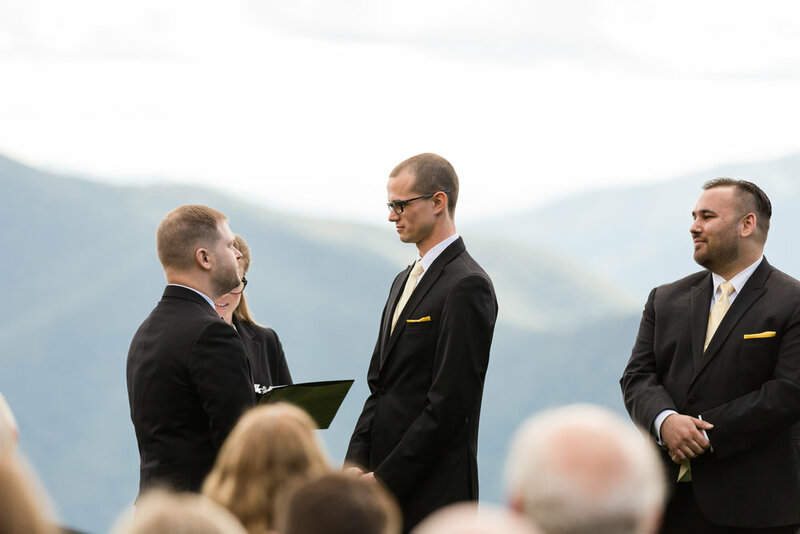 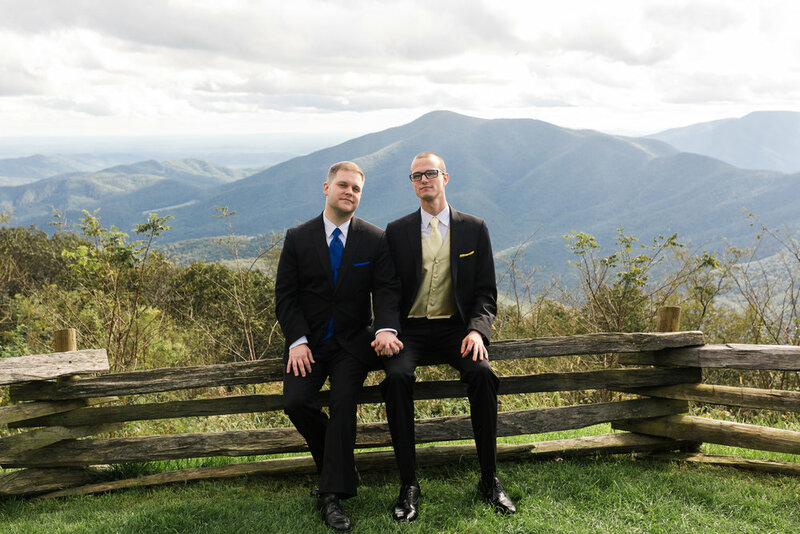 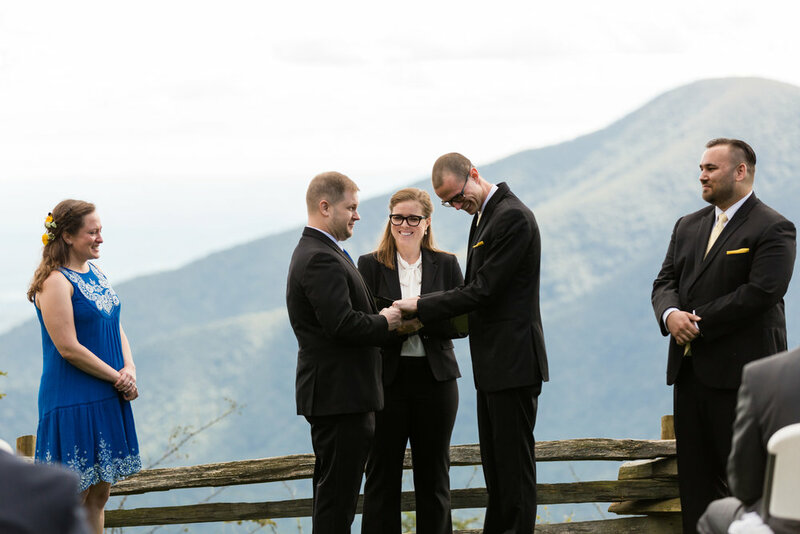 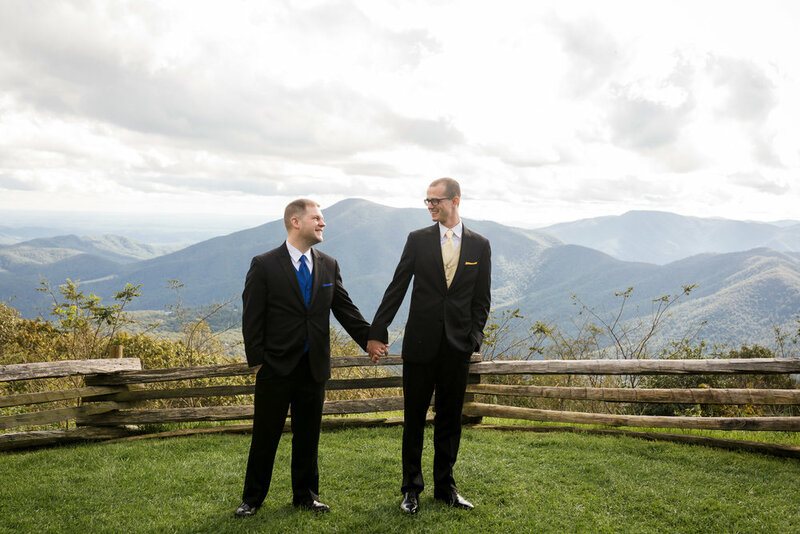 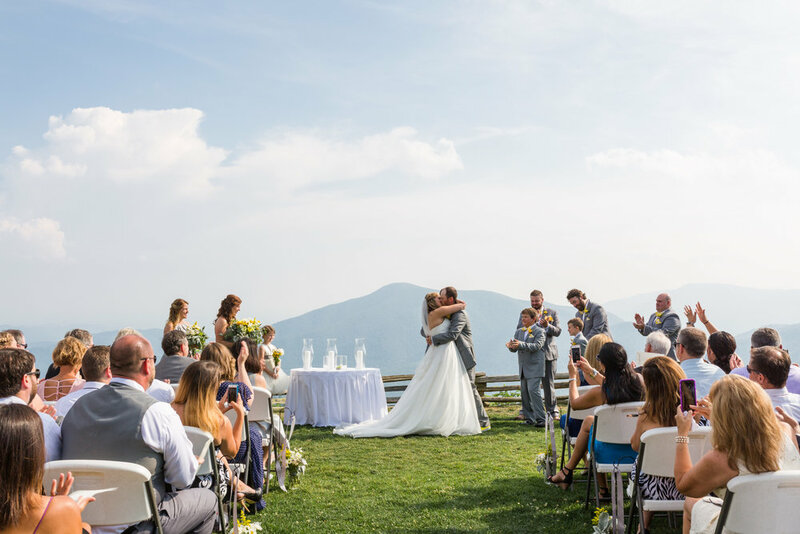 I love that they chose the mountains as the backdrop for their first look and ceremony. 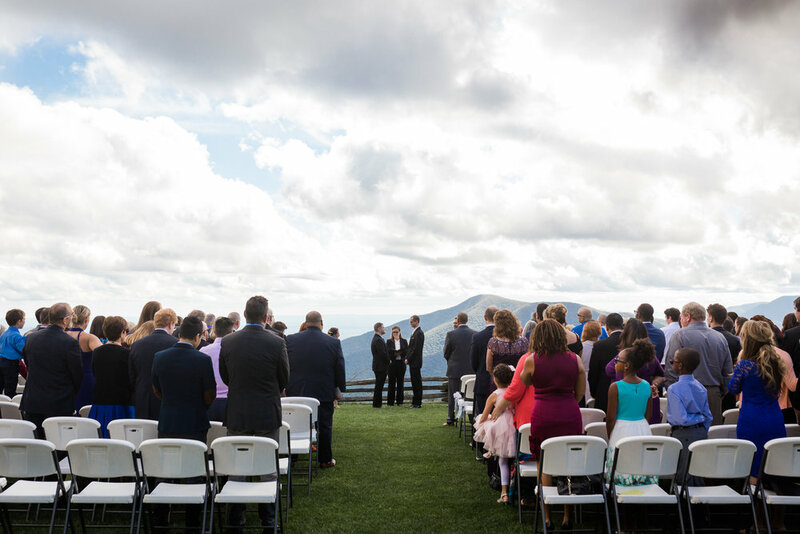 Mountain weddings are quickly becoming a favorite of mine. 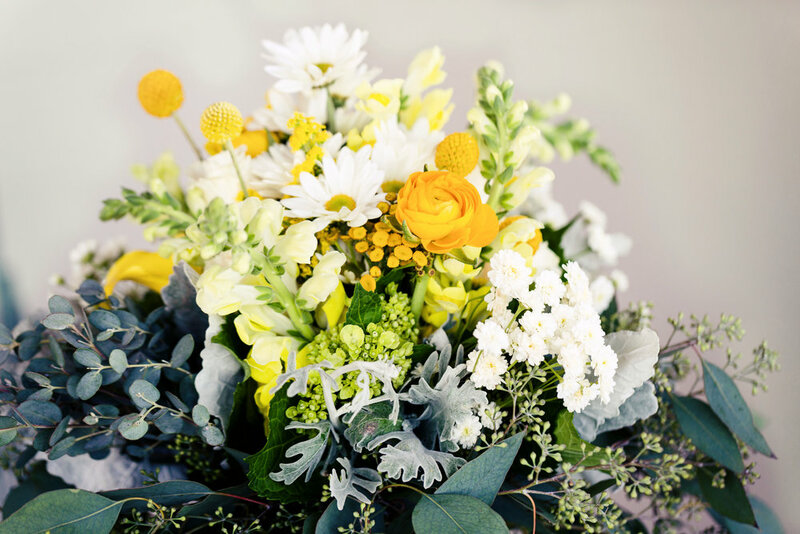 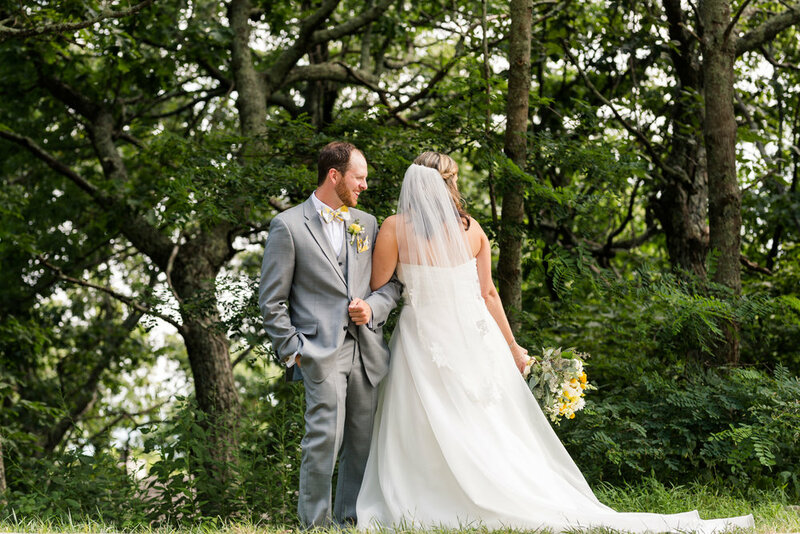 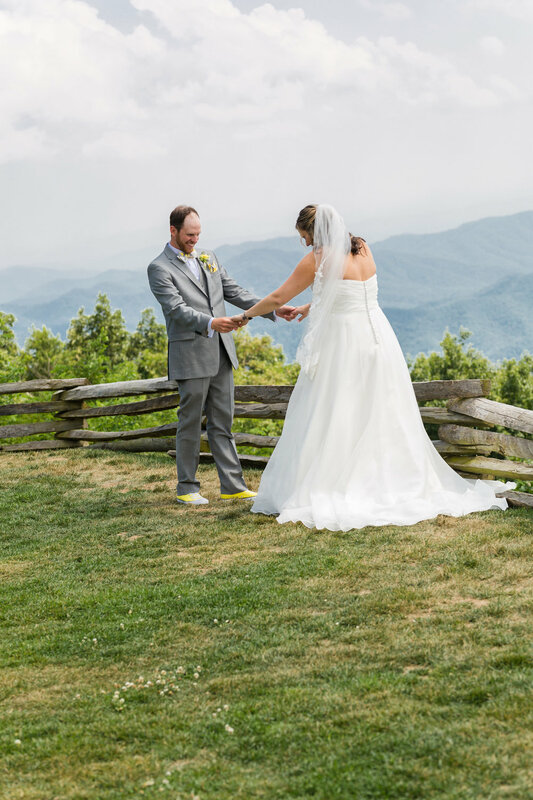 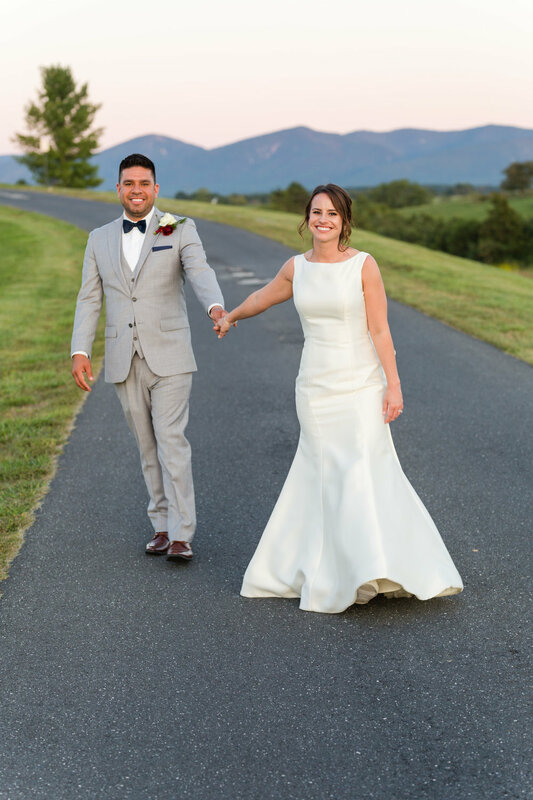 Jessica and Walt chose beautiful colors of gray and yellow to accent the mountain scenery. 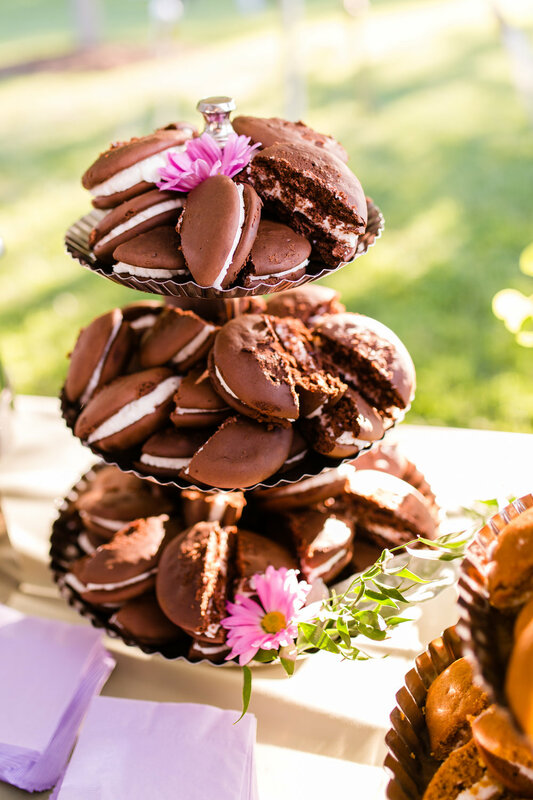 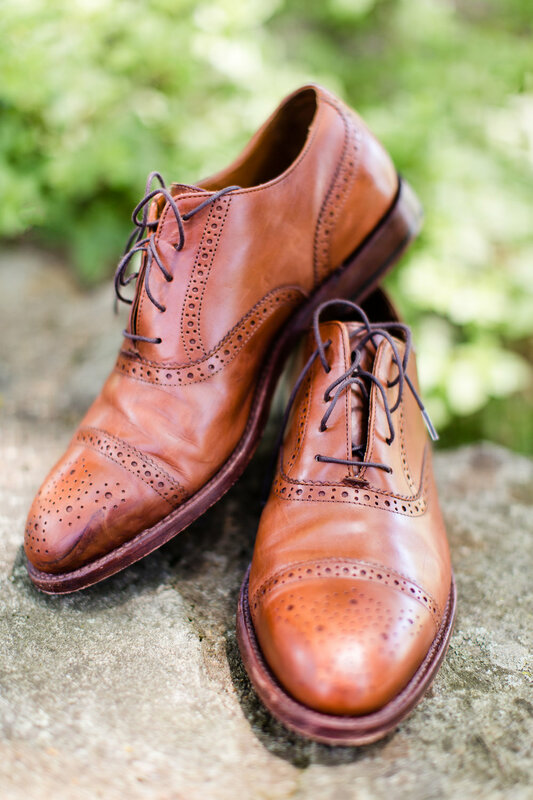 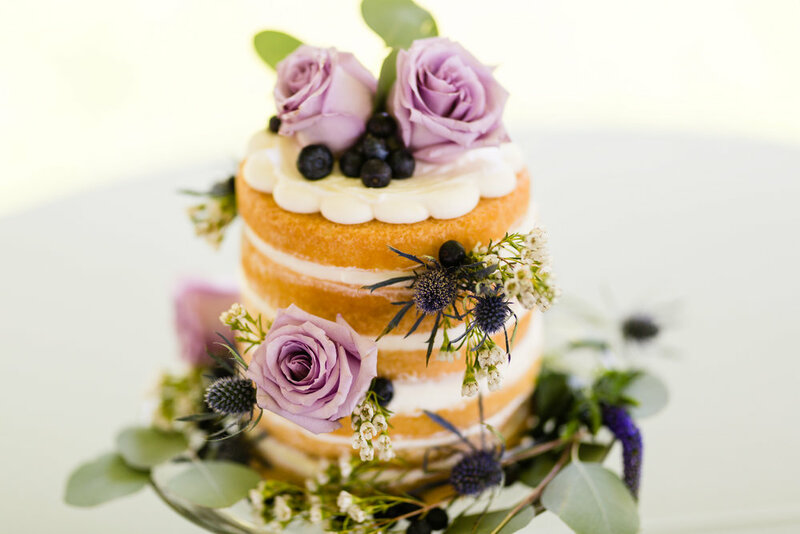 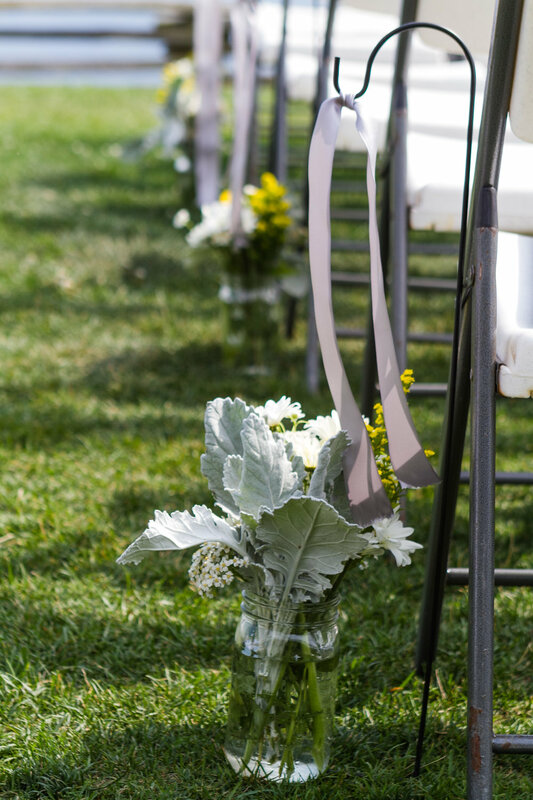 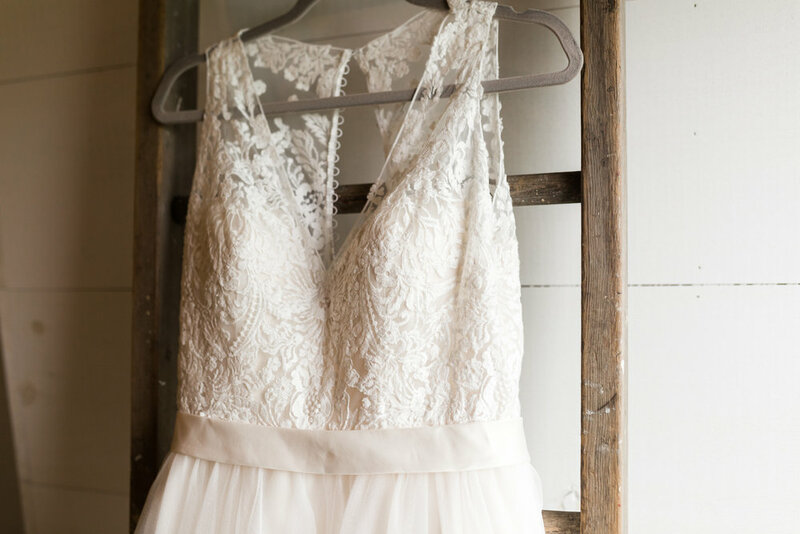 So many perfect details for a summer wedding. 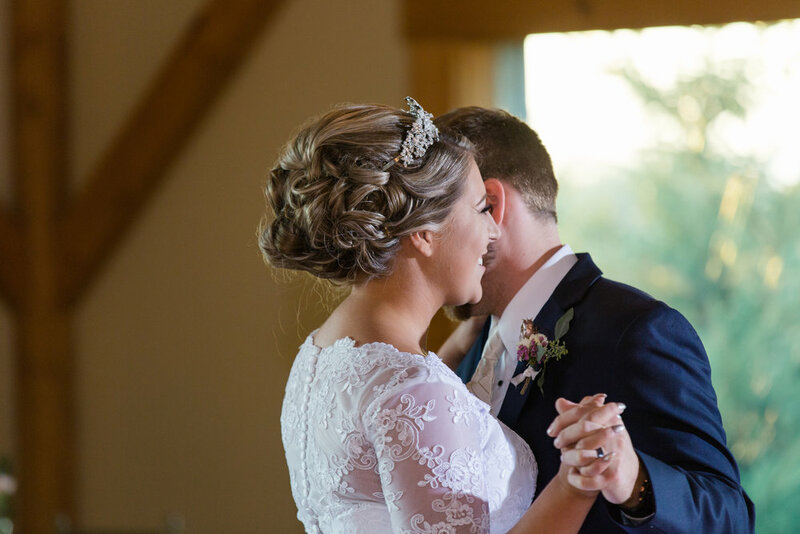 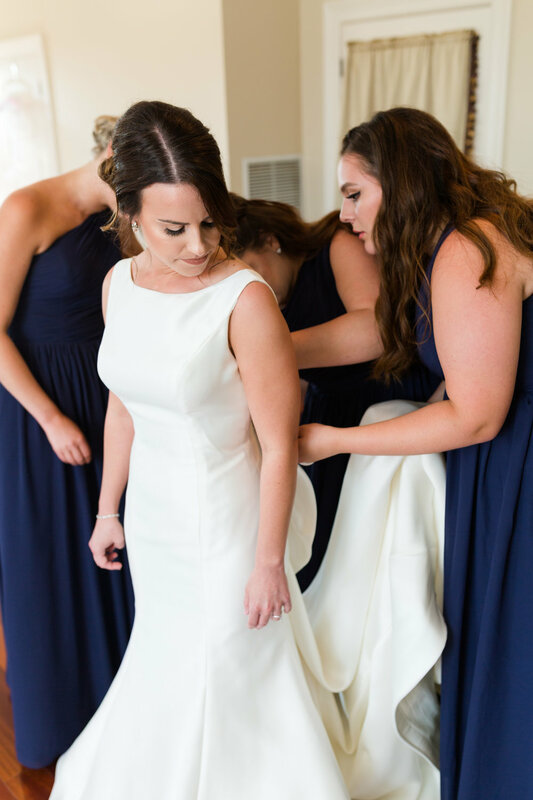 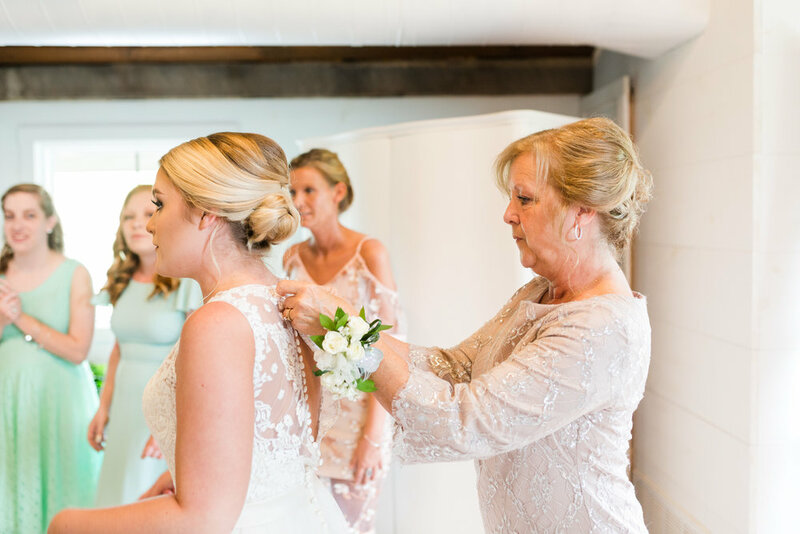 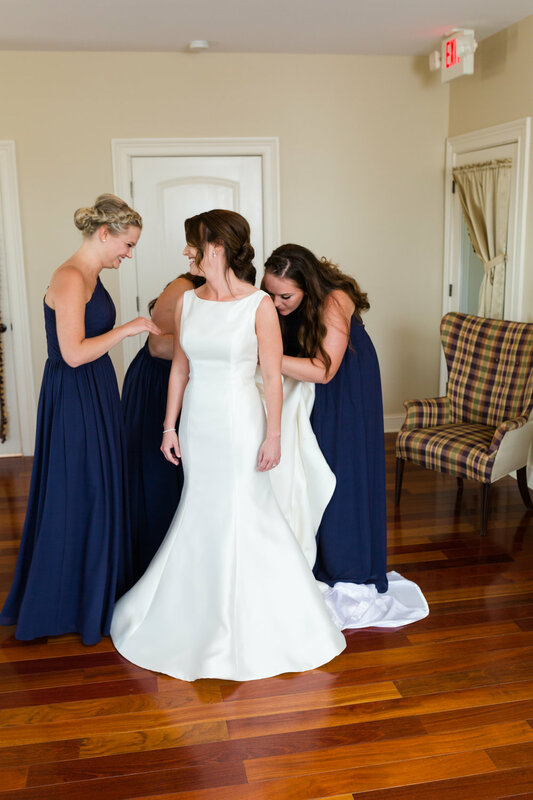 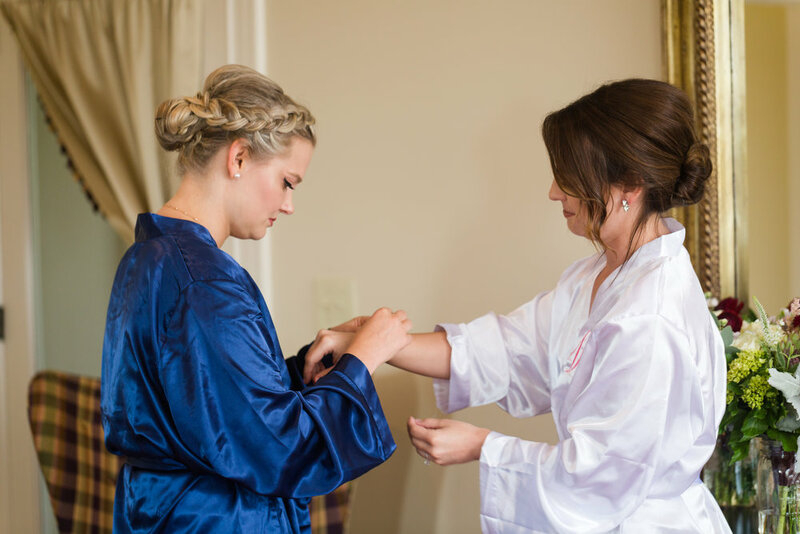 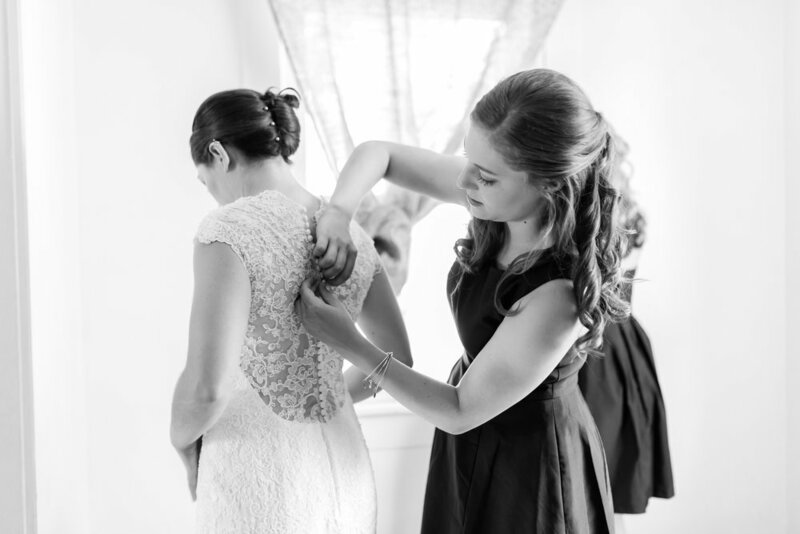 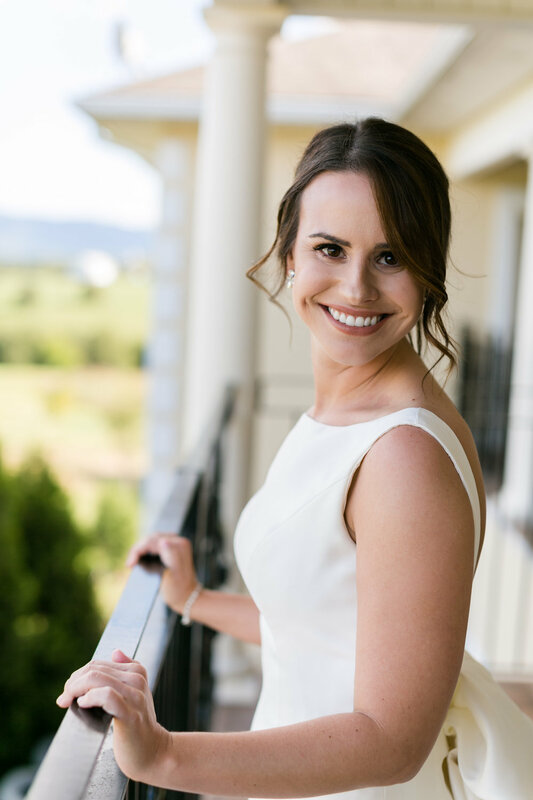 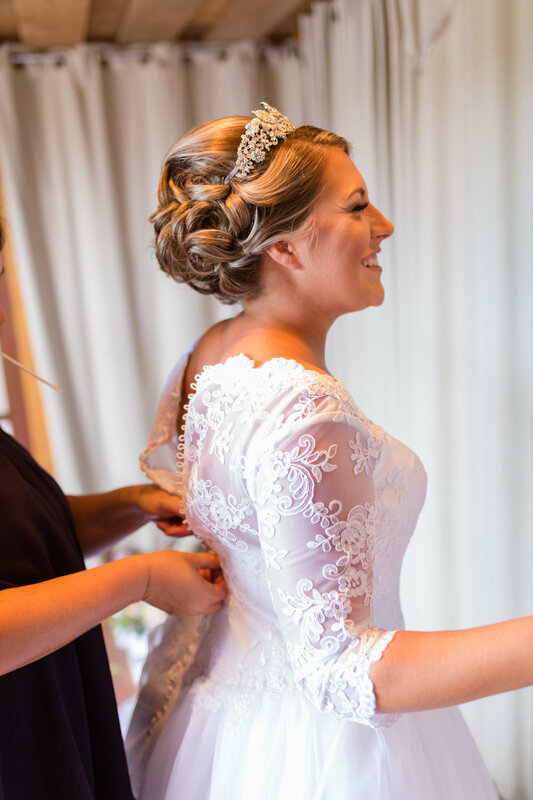 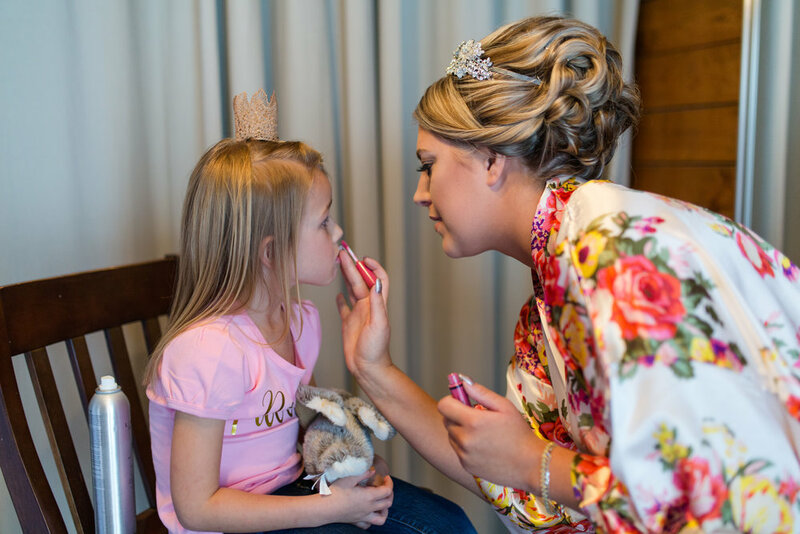 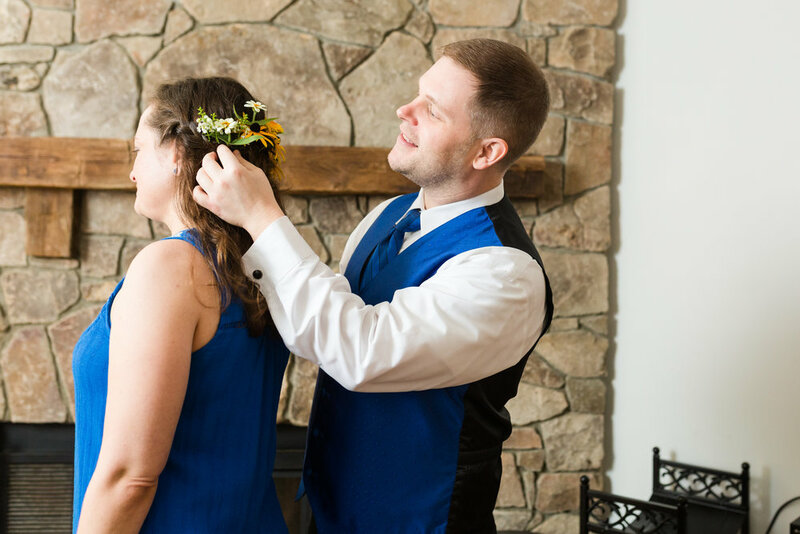 Their wedding day started at the Wintergreen spa for hair and make up and then back in the lodges for the final touches. 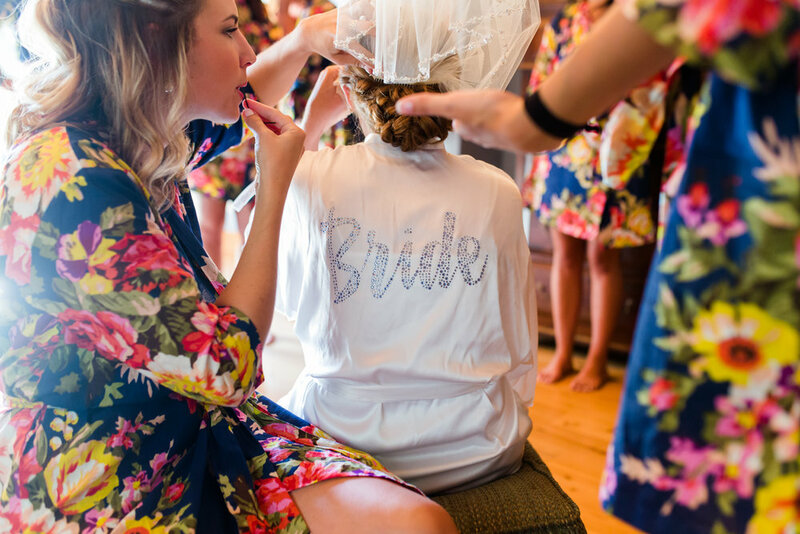 The girls' lodge was full of light and rustic details. 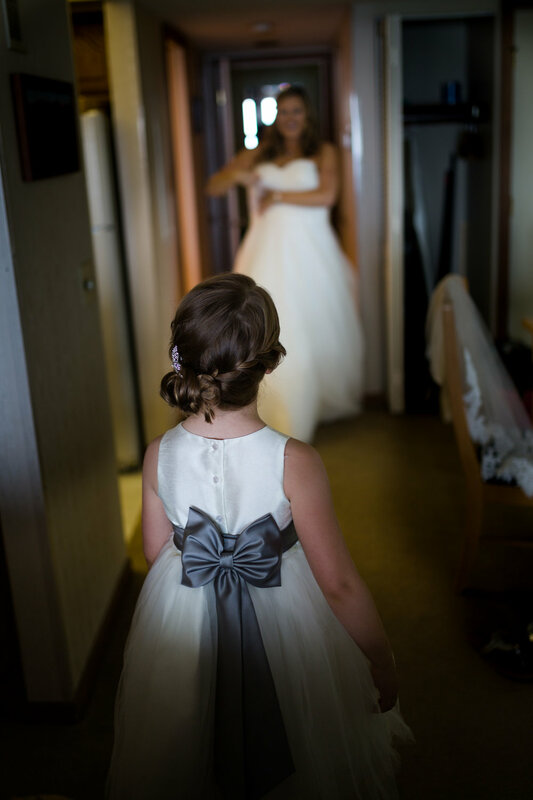 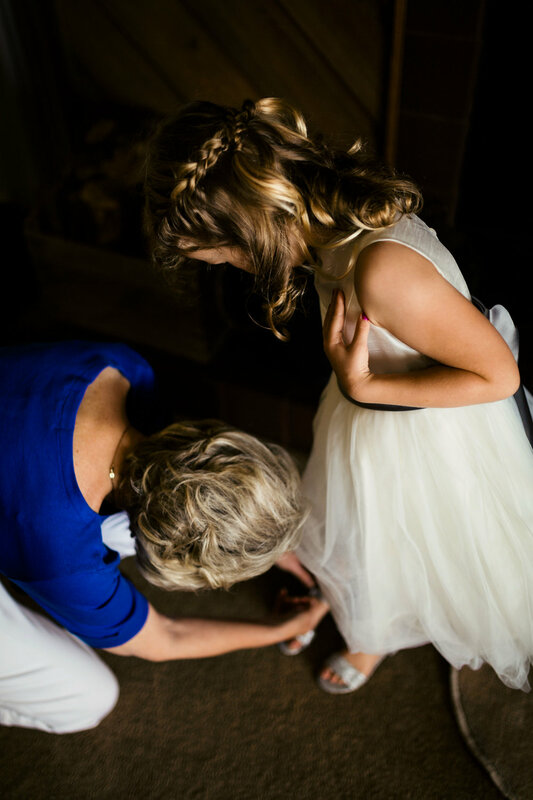 The flower girls were so sweet getting into their tulle dresses with big bows. 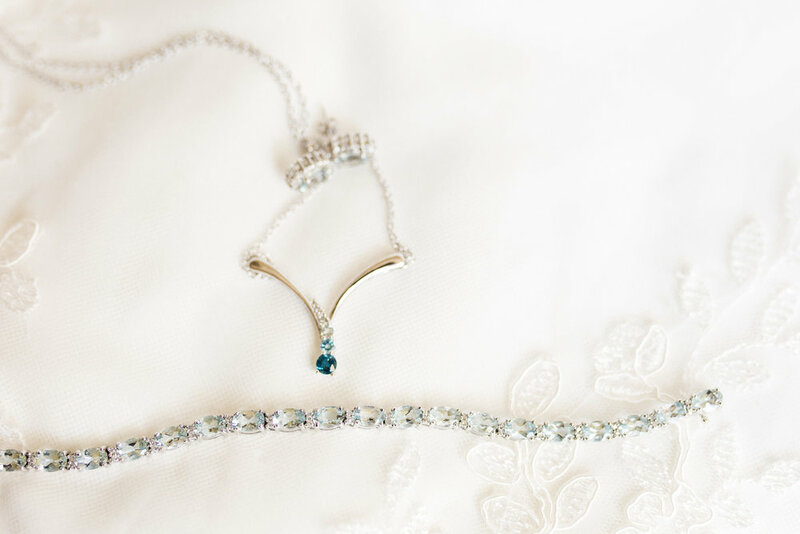 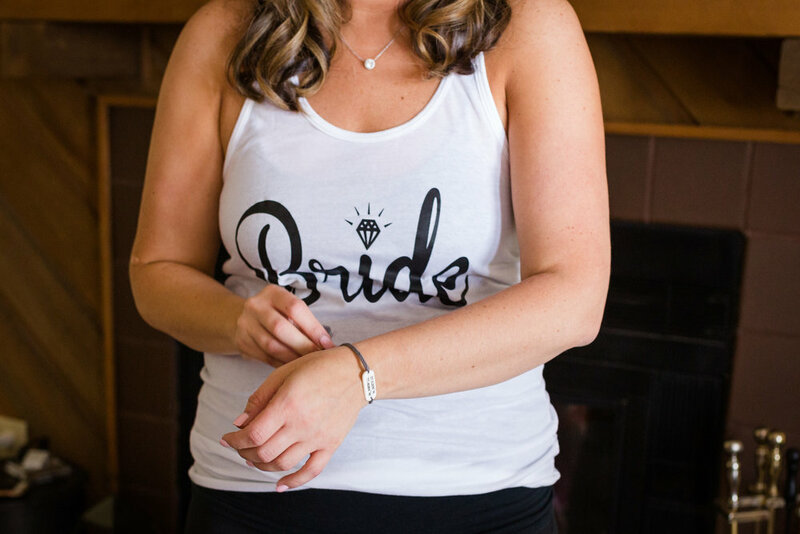 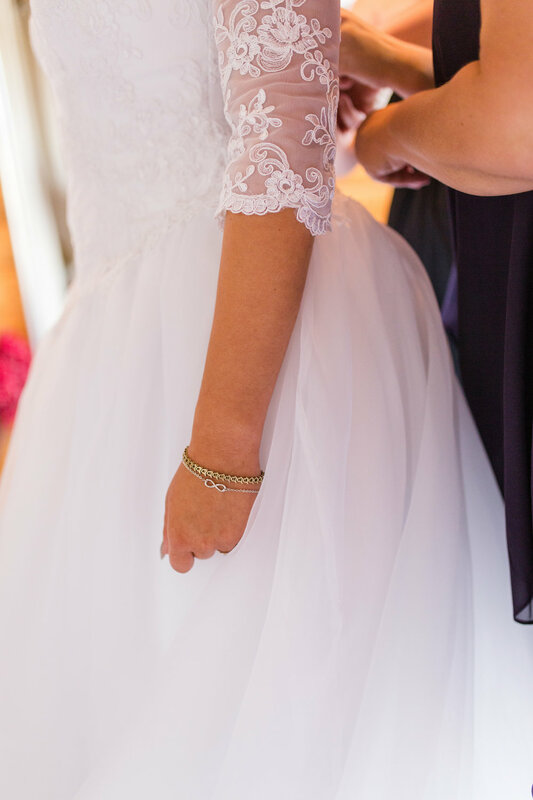 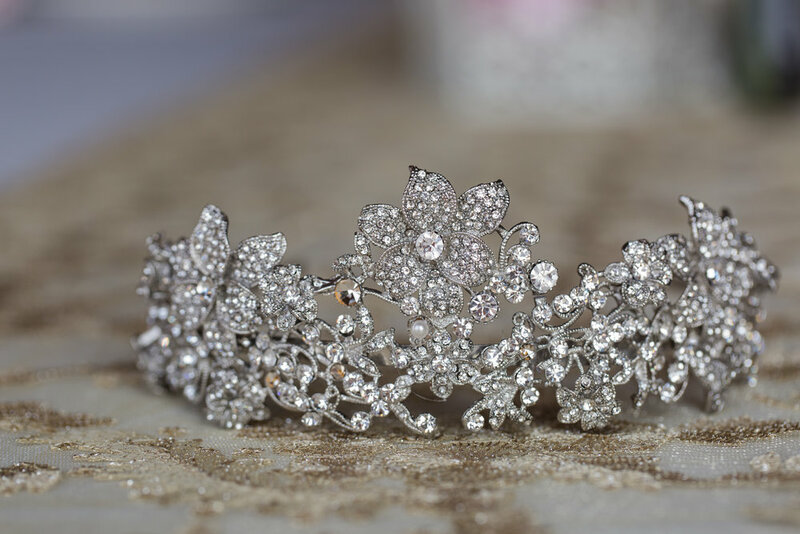 Walt sent Jessica the sweetest wedding day gift and Jessica wore another very special bracelet for her wedding day, a gift from her late grandmother. 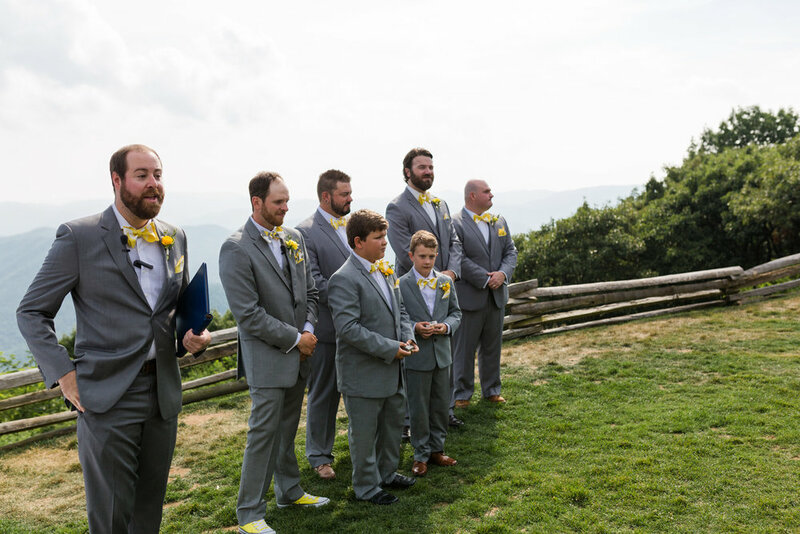 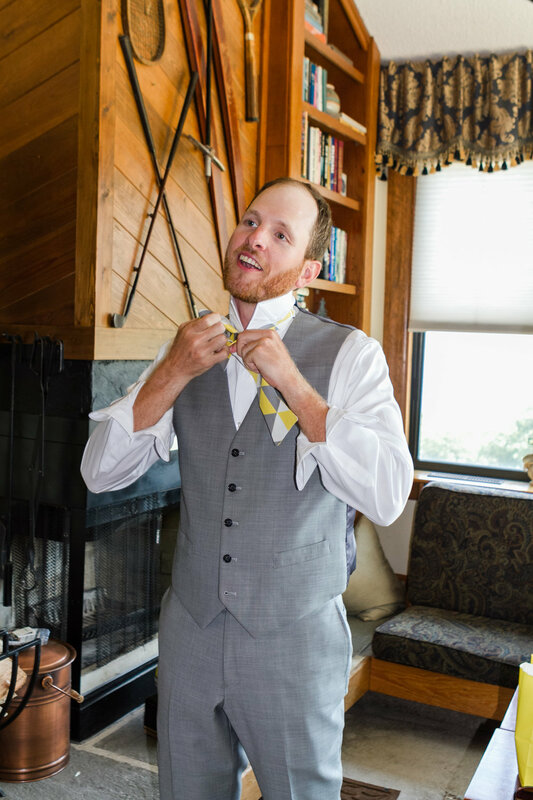 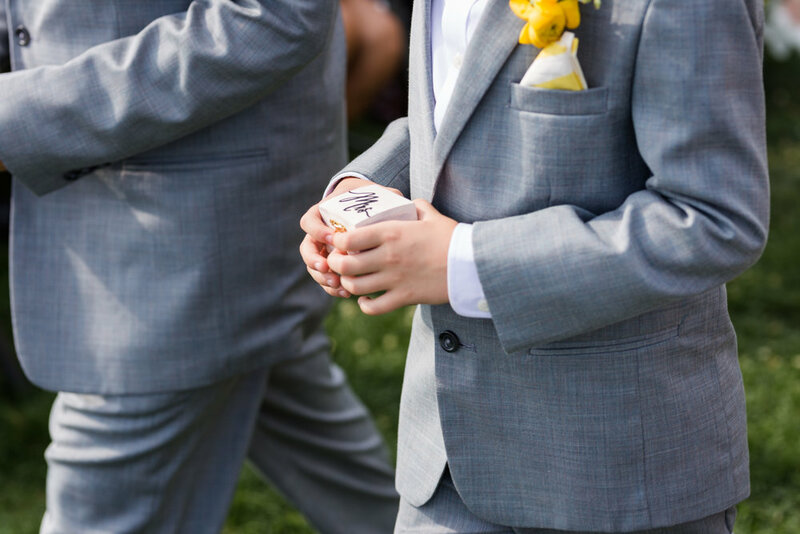 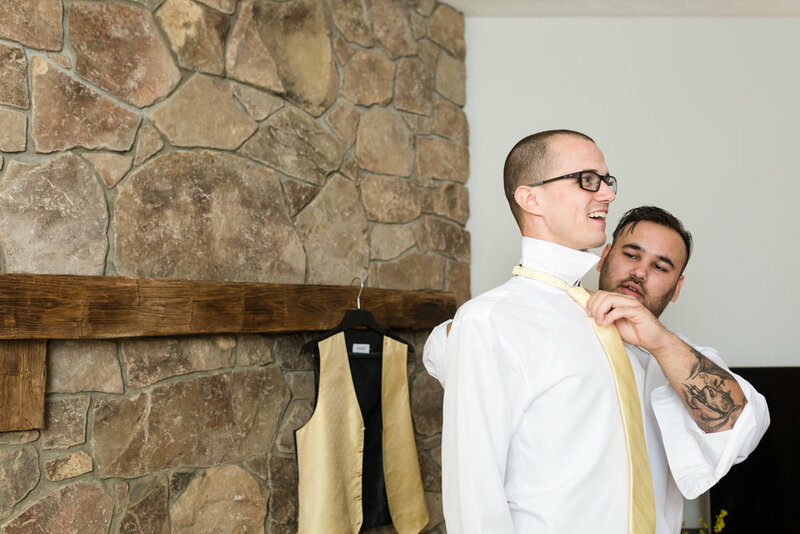 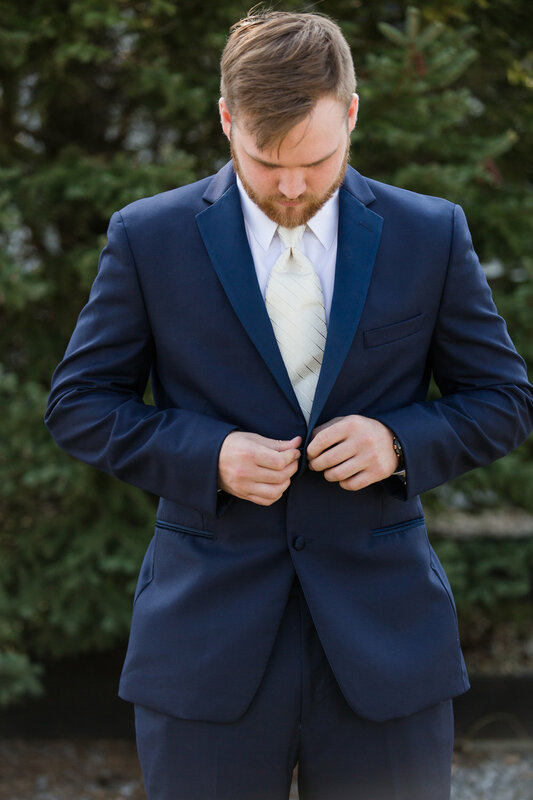 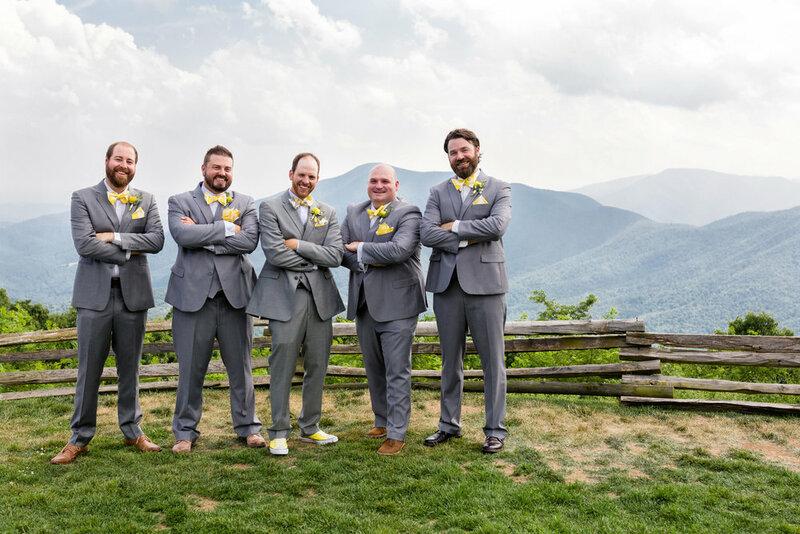 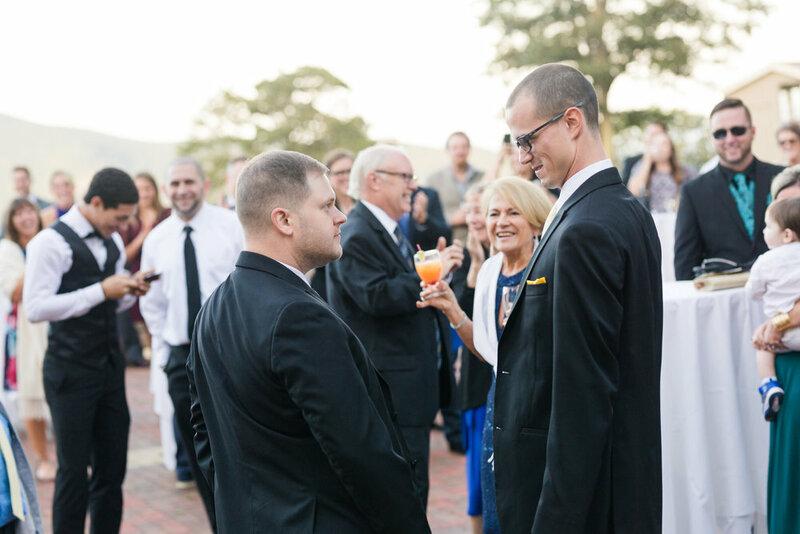 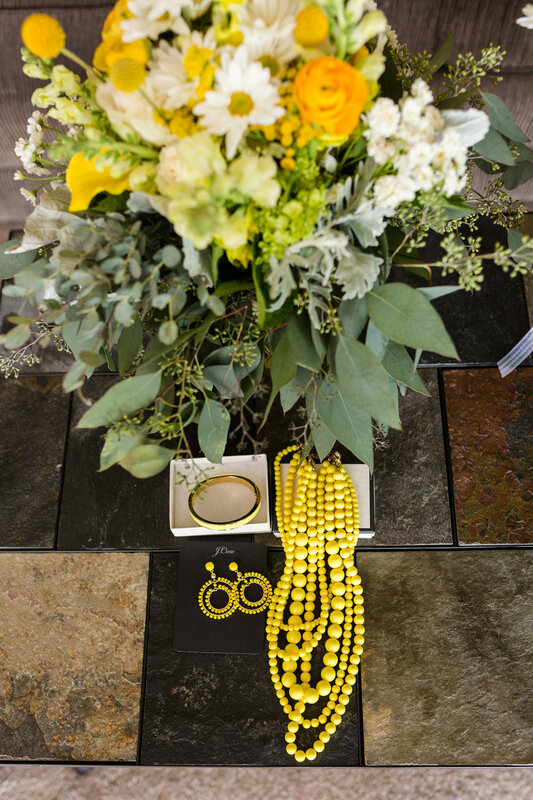 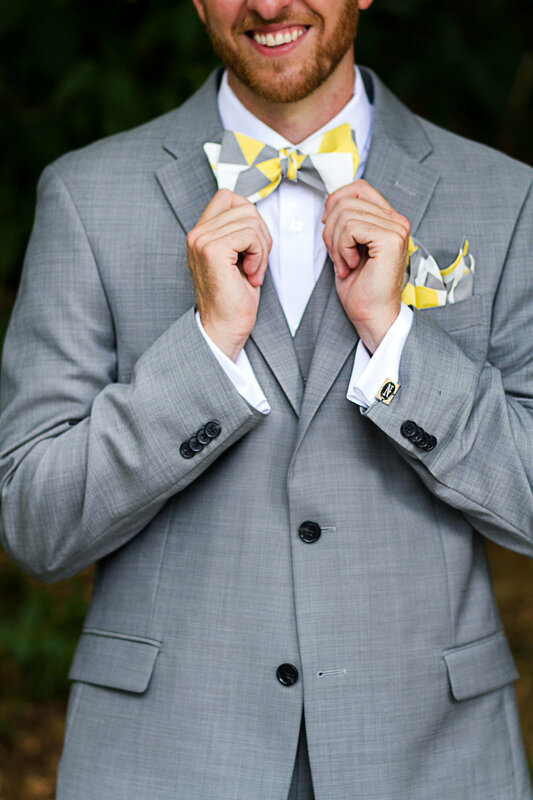 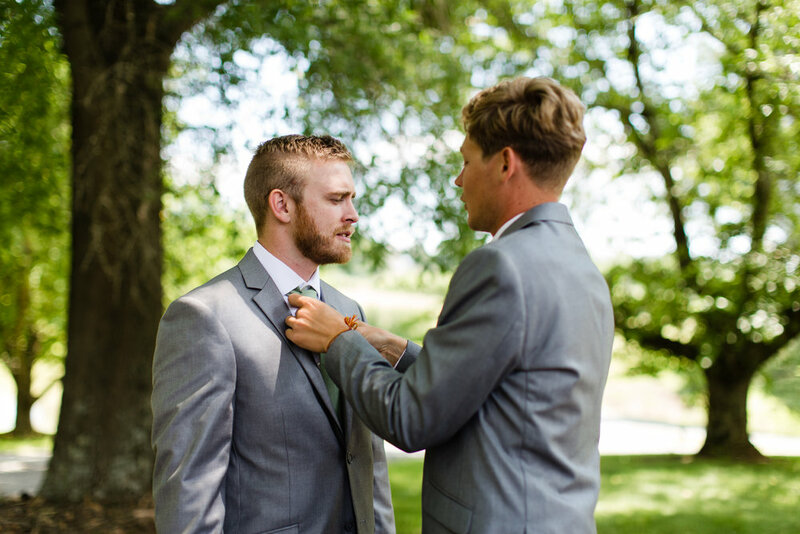 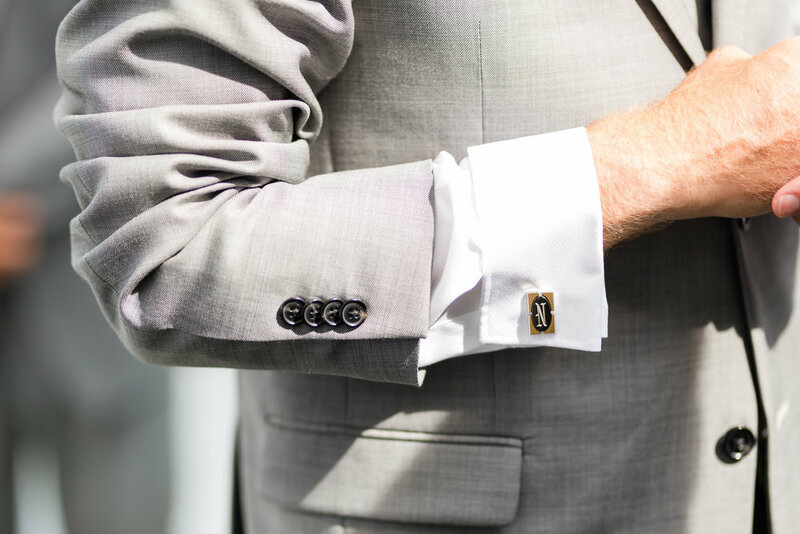 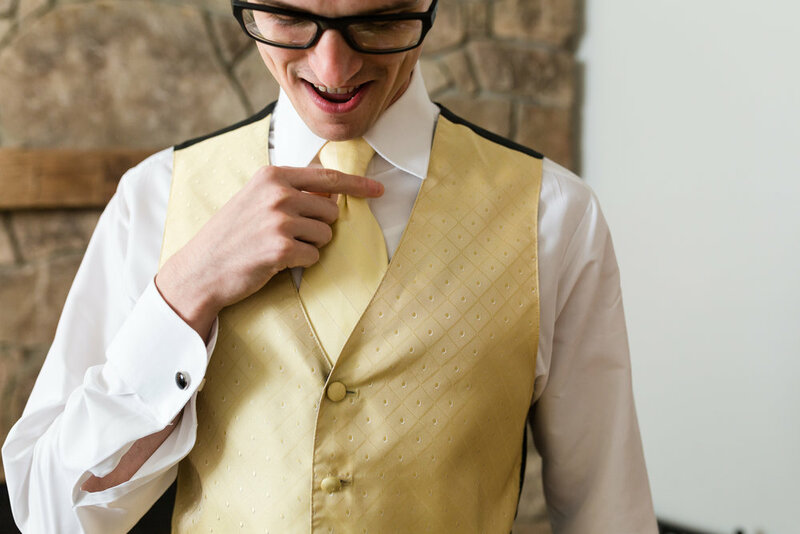 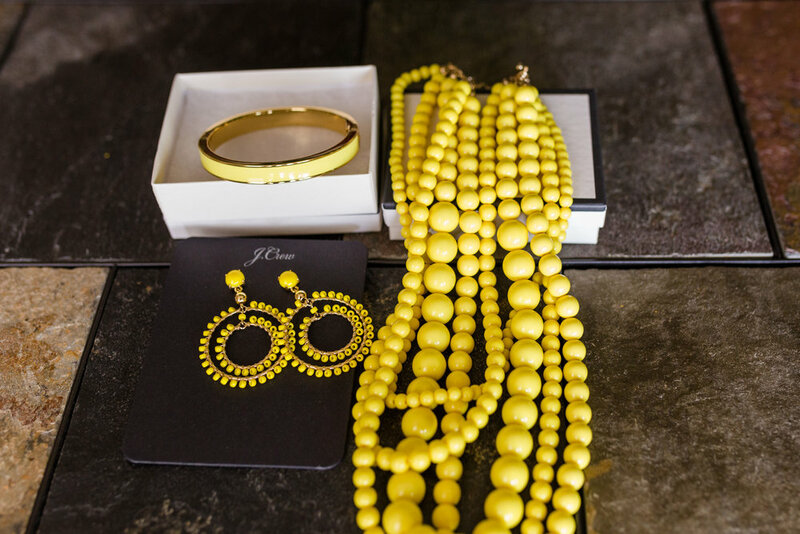 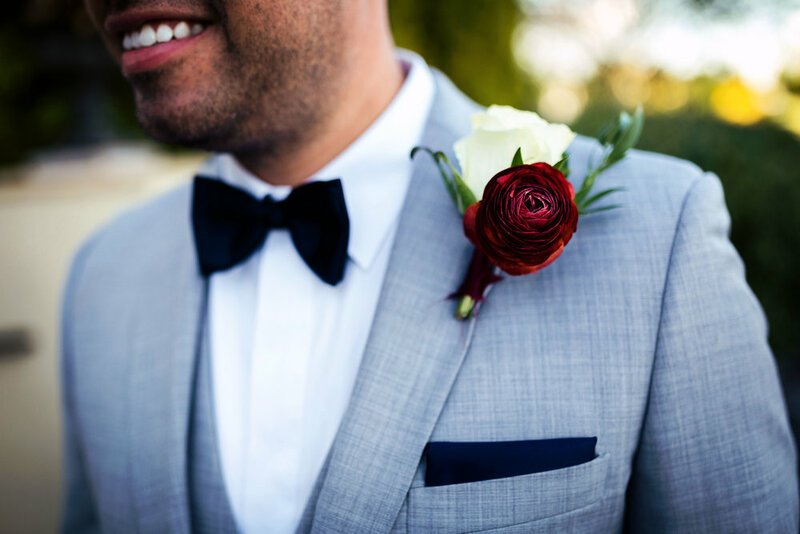 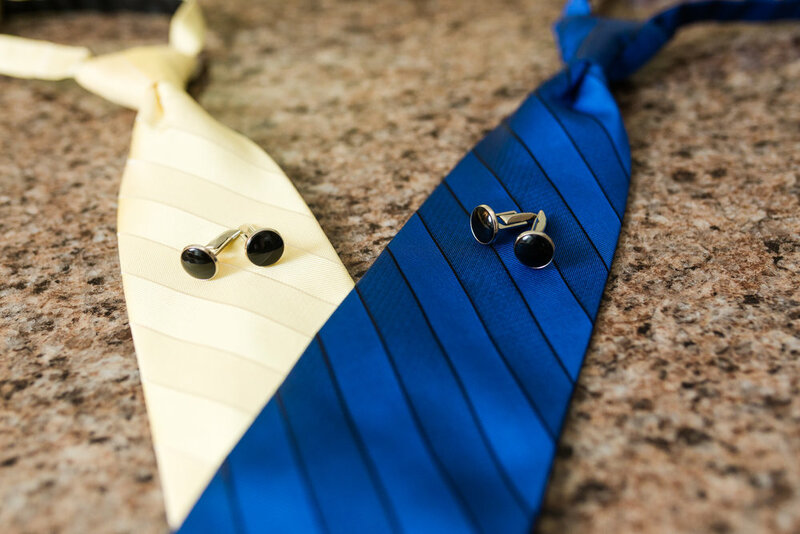 The bridesmaids wore beautiful yellow jewelry to match their gray dresses and the guys looked so amazing in their yellow accented bow ties and pocket squares. 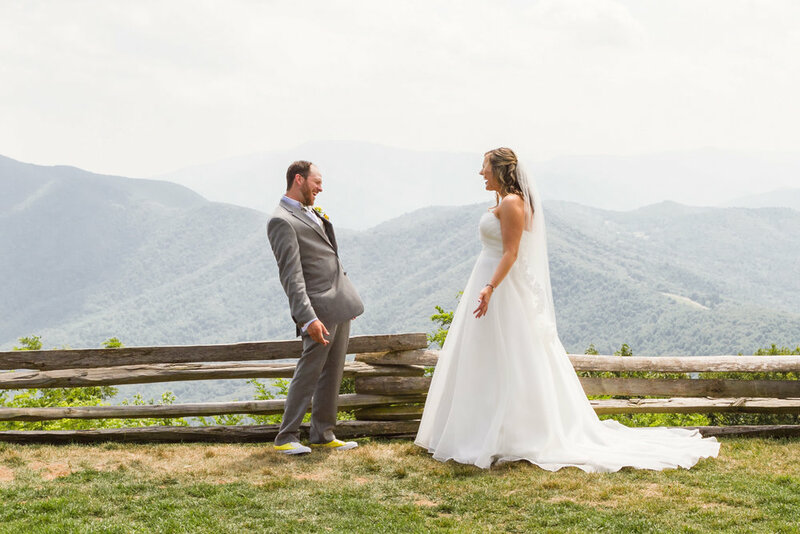 Walt even added some yellow Converse sneakers to his wedding day wardrobe! 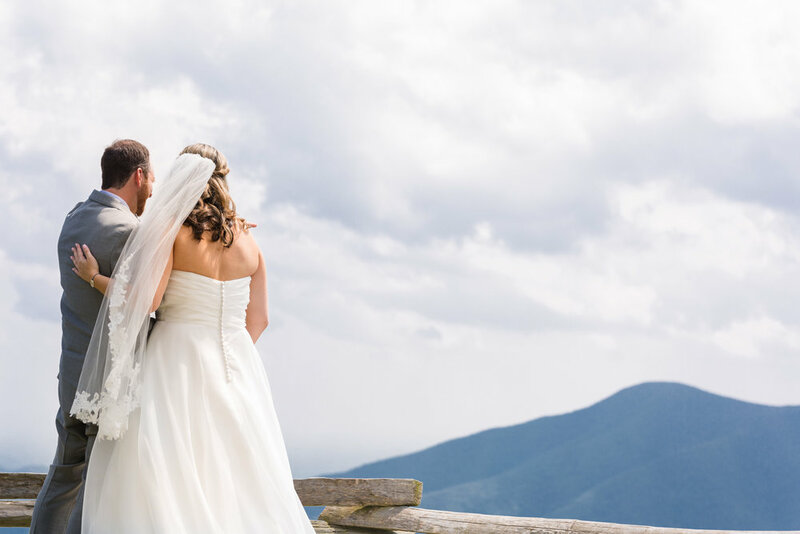 Jessica and Walt had their first look at the highest overlook at Wintergreen. 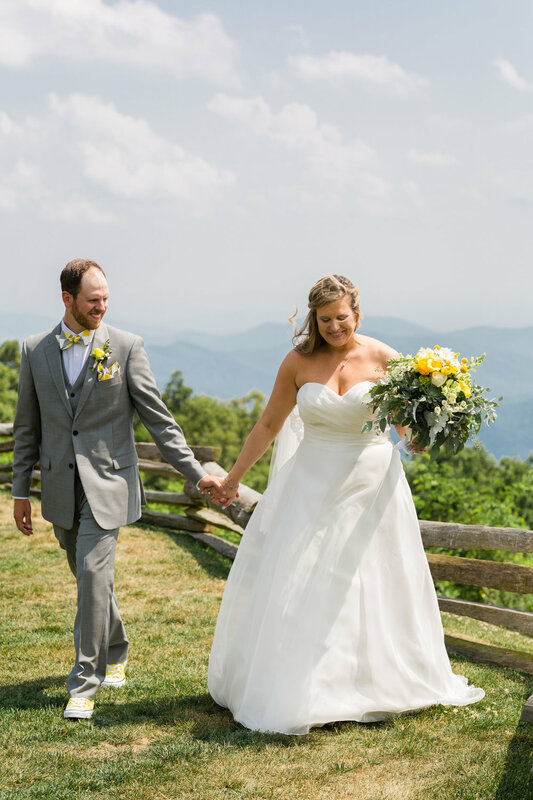 With the mountains just peaking up in the background they had the sweetest first look. 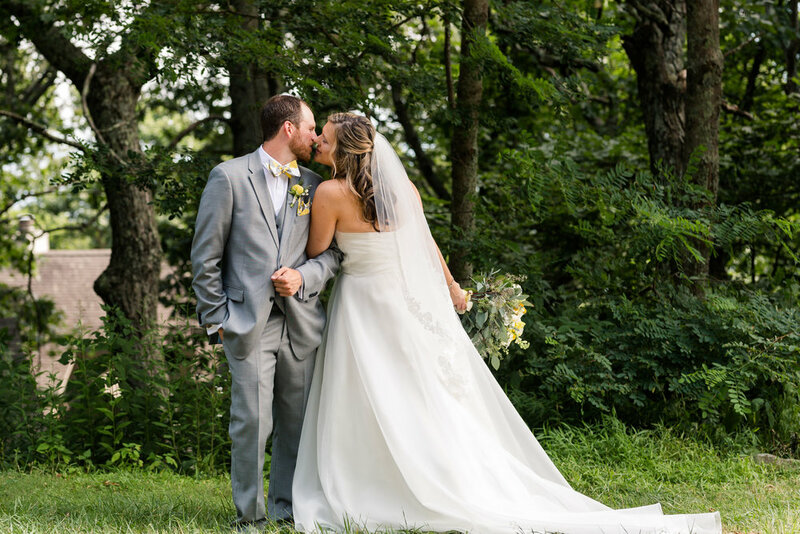 They laughed, kissed, talked, and shared a few sweet private moments before saying "I do". 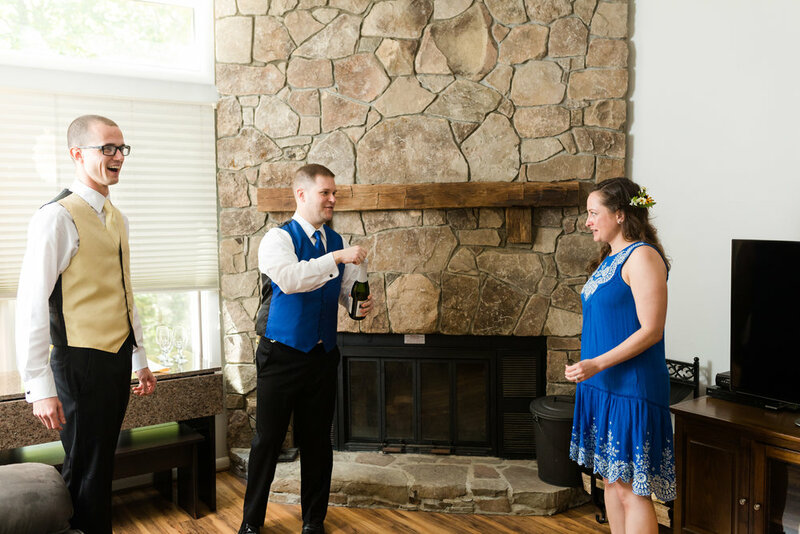 Jessica and Walt chose to do all their portraits before the ceremony so they could enjoy cocktail hour with their friends and family. 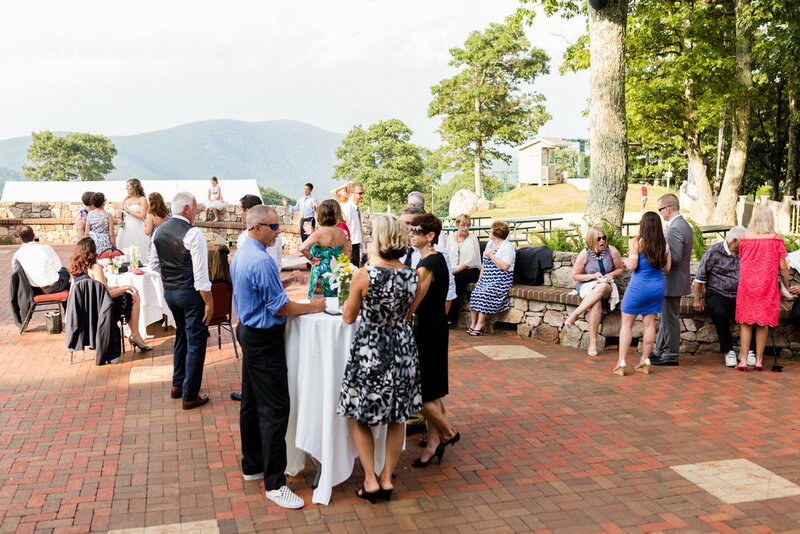 Their cocktail hour was outside on the terrace again overlooking the Blue Ridge Mountains and the ski lifts at Wintergreen. 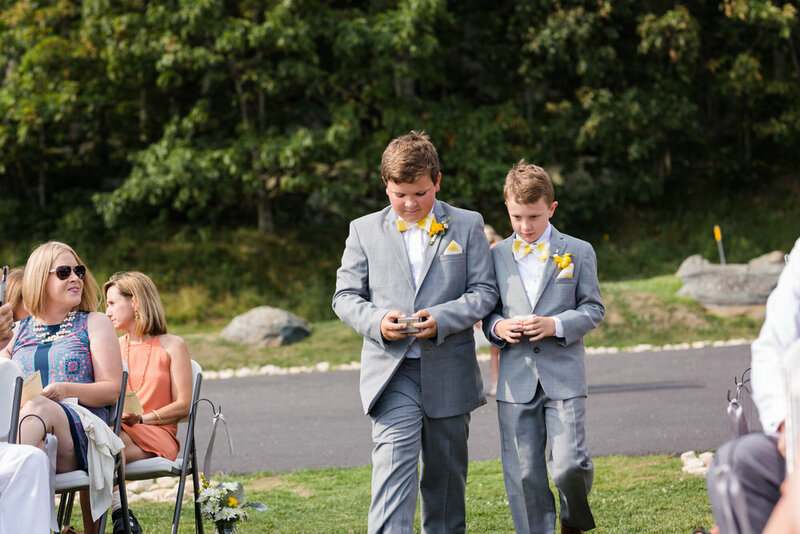 They had games for the kids and adults and some delicious looking appetizers too. 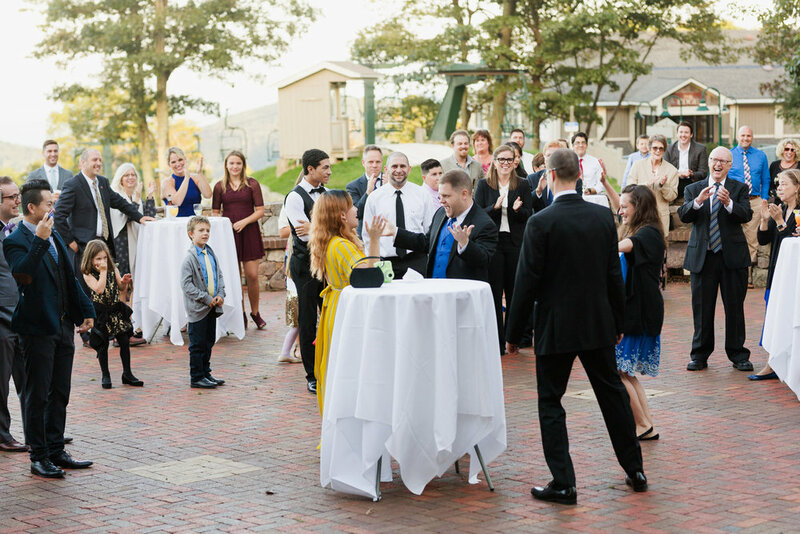 The reception was held indoors at the Skyline Pavillion. 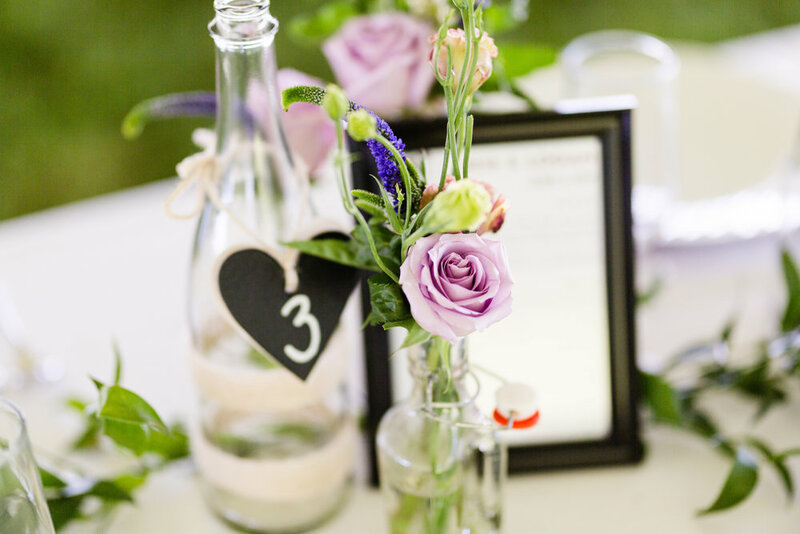 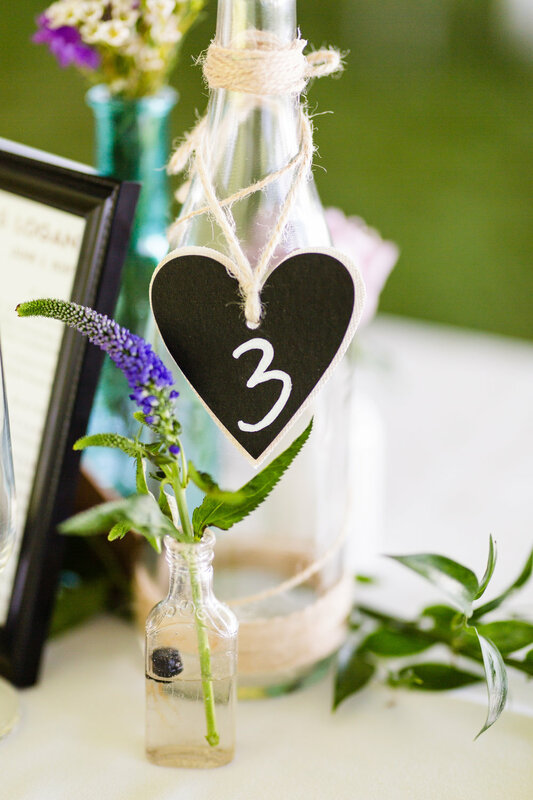 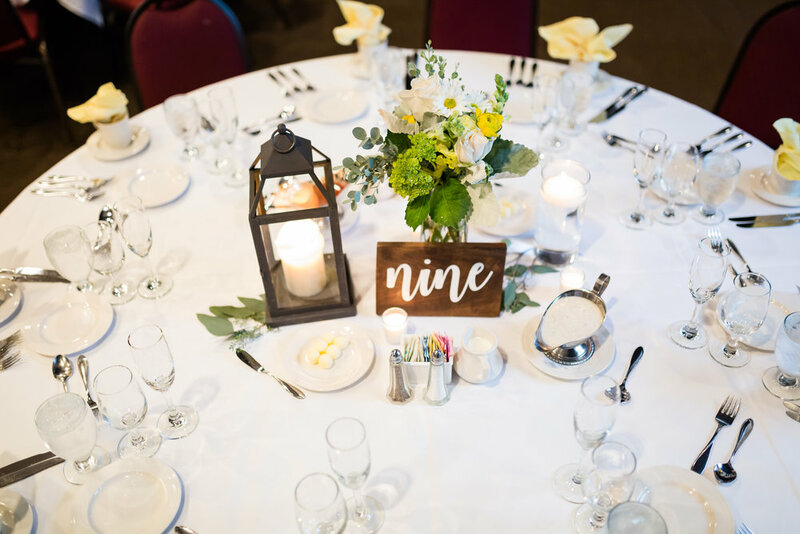 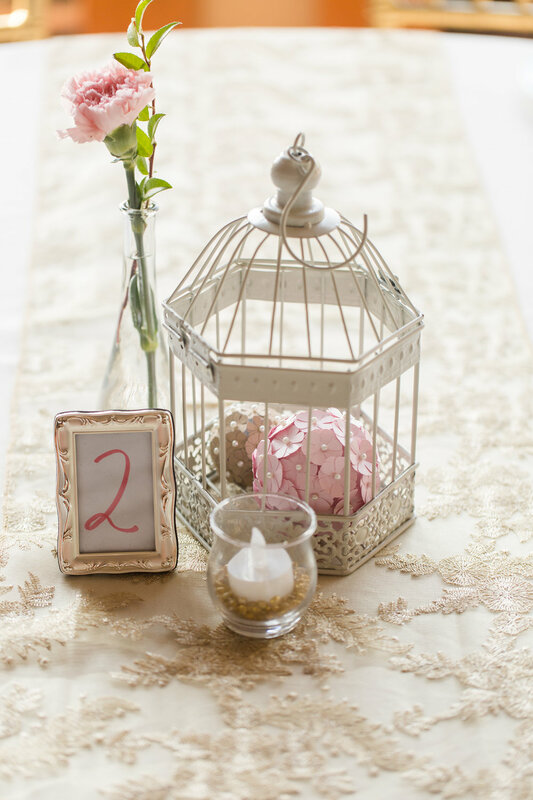 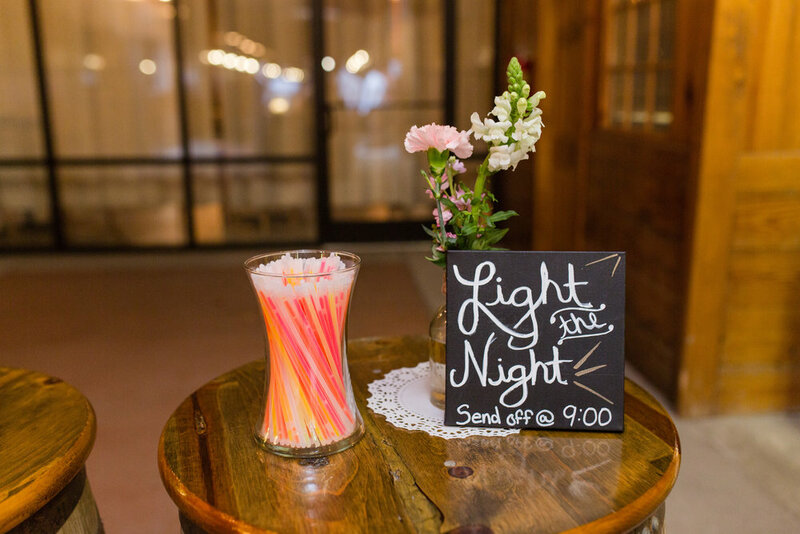 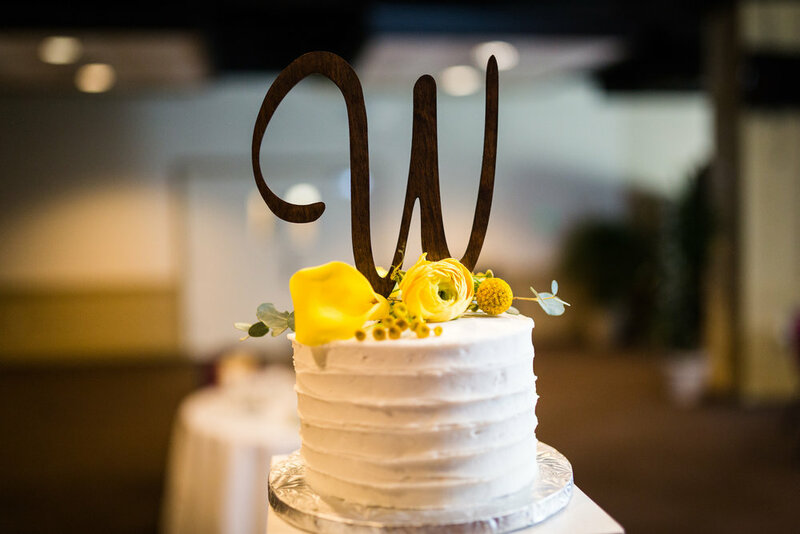 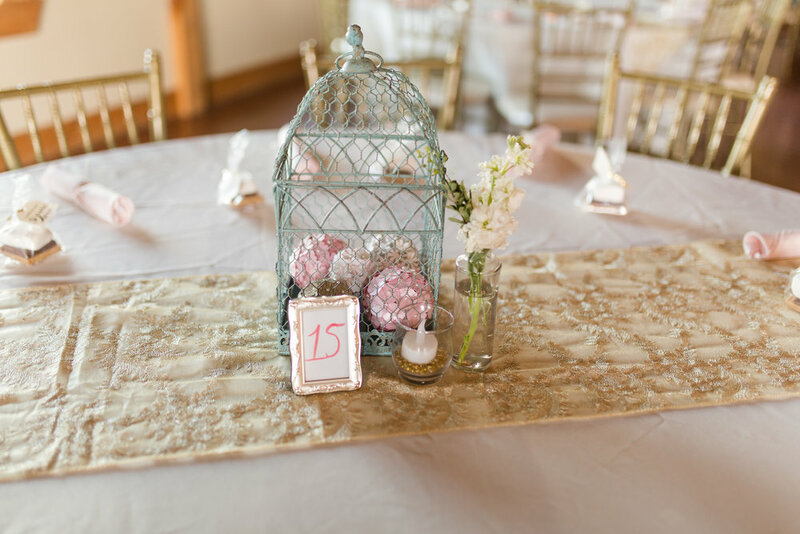 The tables were decorated with beautiful yellow flowers, lanterns, and wooden table numbers. 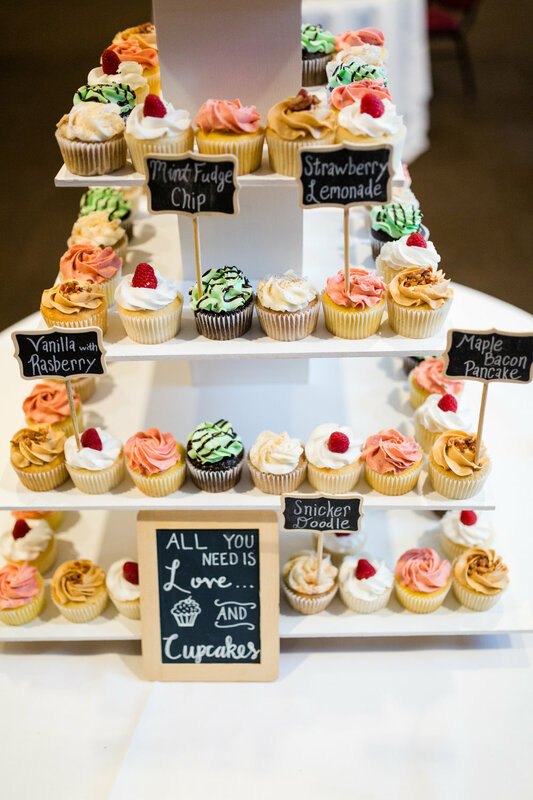 There was a cupcake table filled with a variety of flavors, including chocolate bacon cupcakes! 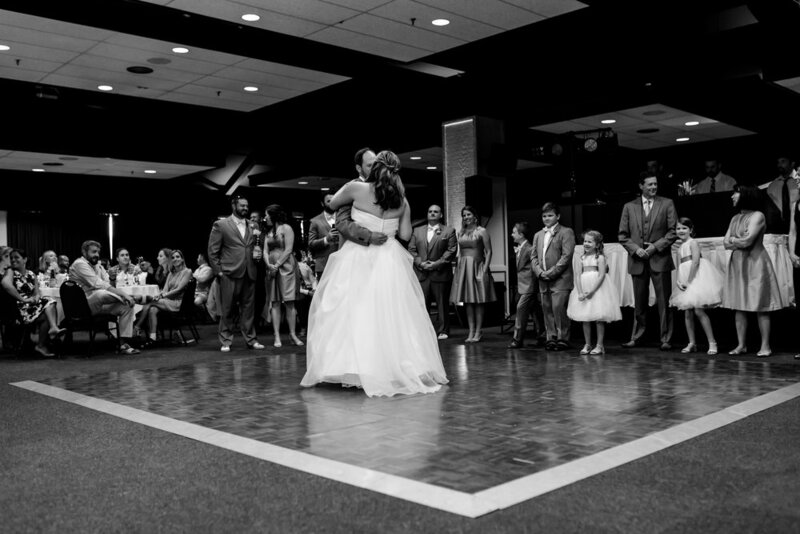 The room had a large dance floor which was filled with glow sticks late in the night and a lot of dancing! 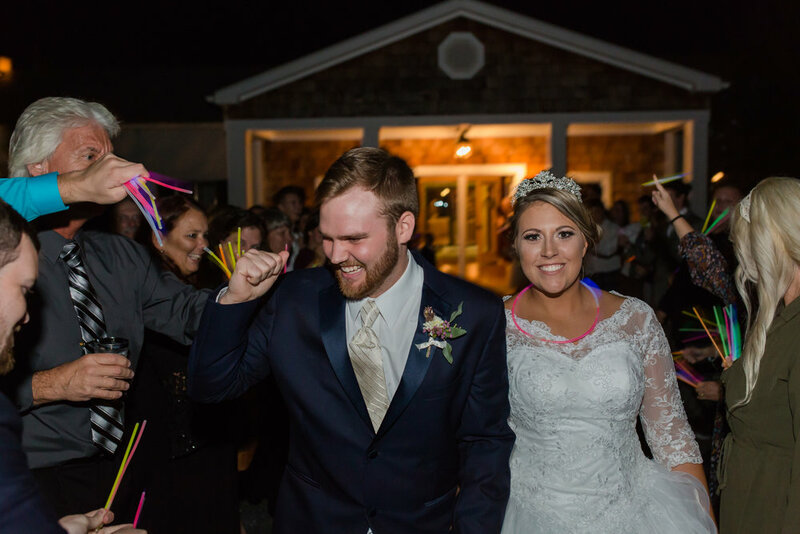 The entire night was full of energy and laughter and ended with a sparkler exit that almost didn't happen due to a few sprinkles! 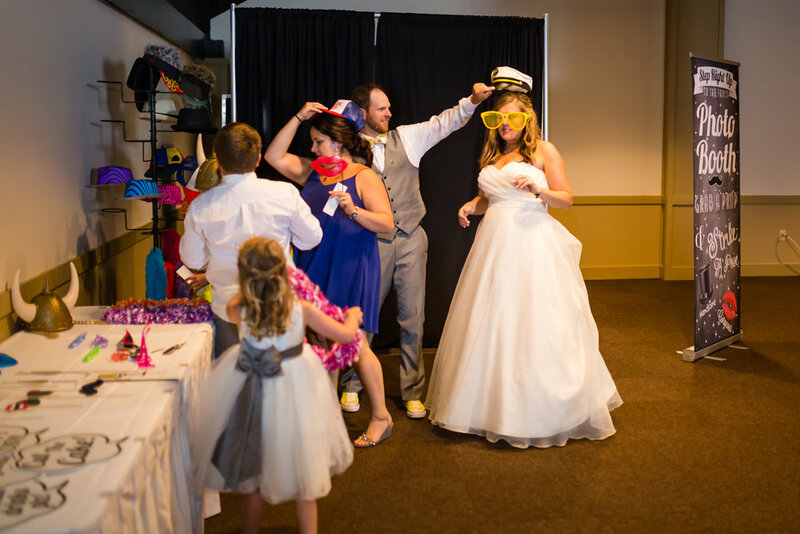 The guests were then invited to an after hours party which I'm sure just became more fun as the night went on. 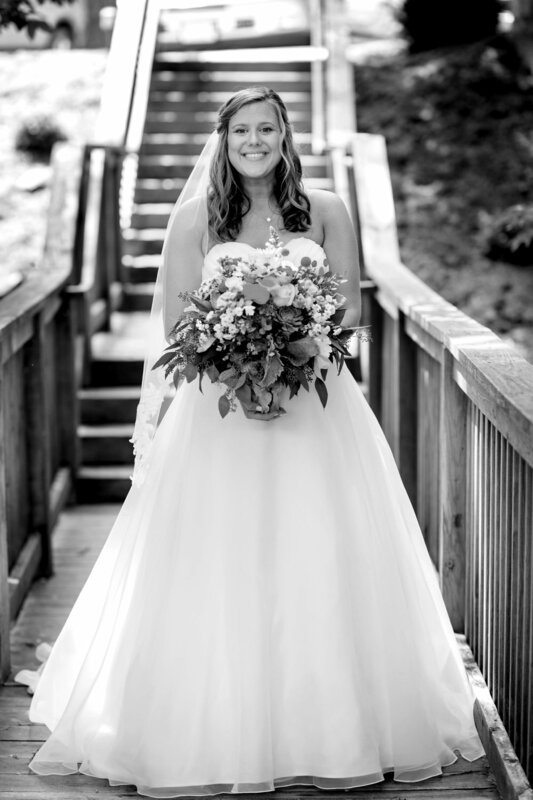 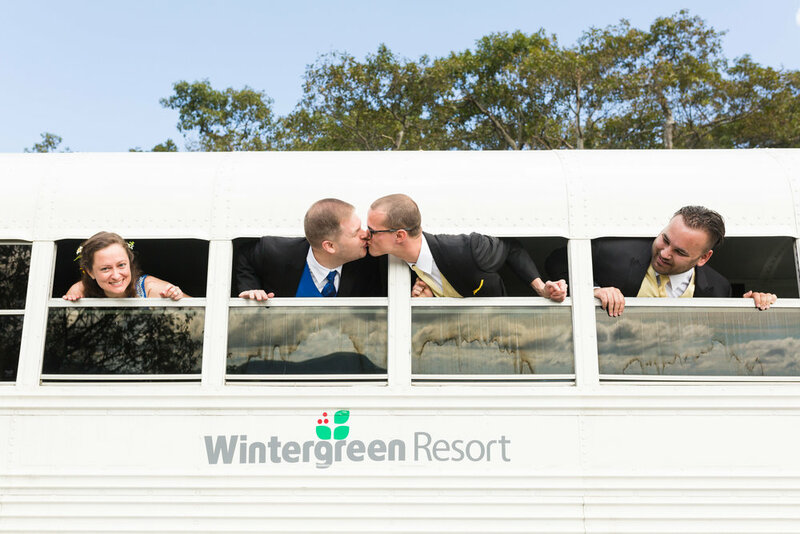 I'm so excited to be doing a few more weddings at Wintergreen this year. 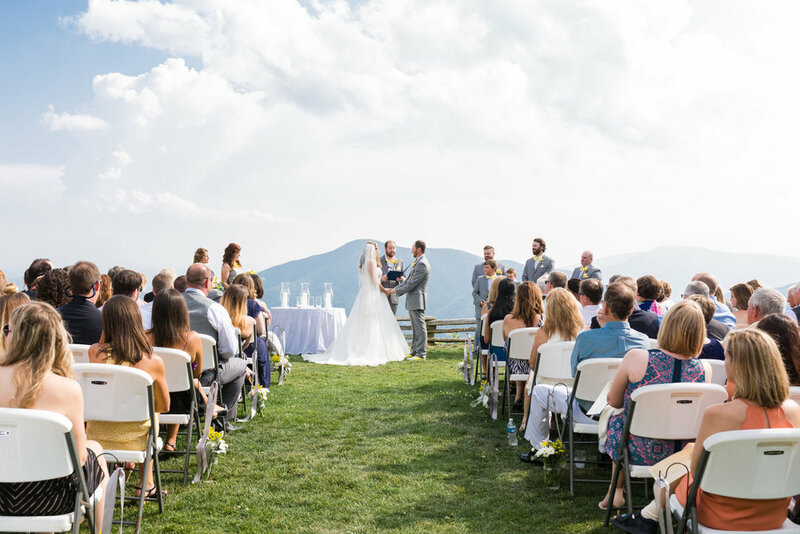 Mountain weddings are unique in so many ways and they have a scenery that cannot be matched. 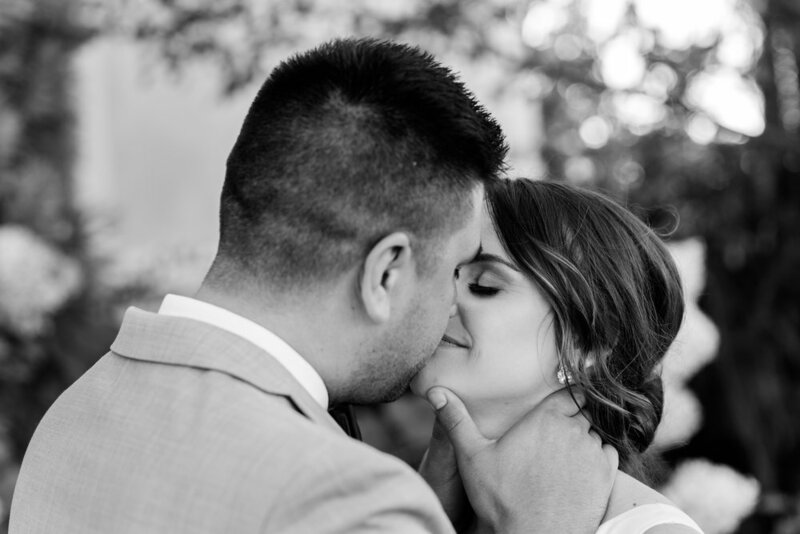 I hope you all enjoy these images as much as I enjoyed taking them!! 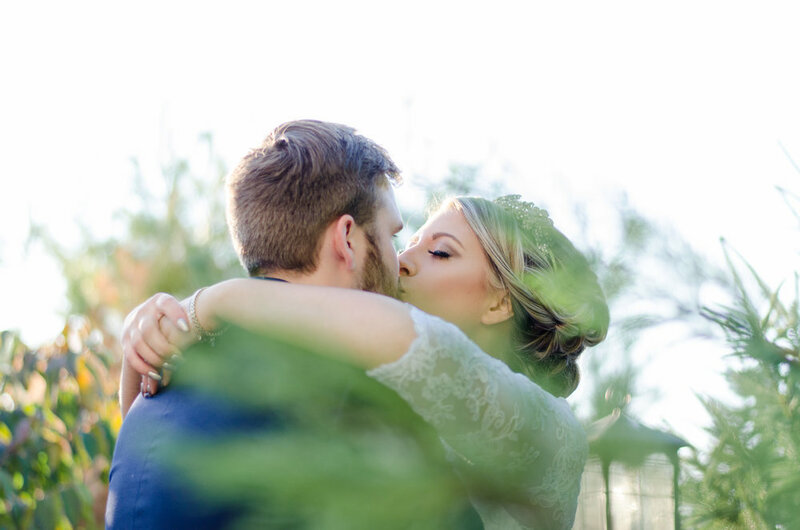 I first met Megan and Zack for their engagement session in the late spring. 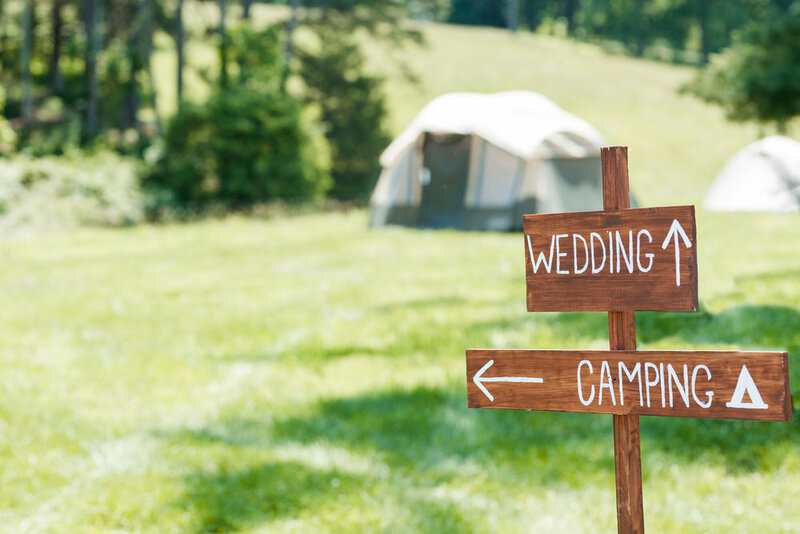 We ventured out into the middle of nowhere to an empty summer camp which was so worth the drive. 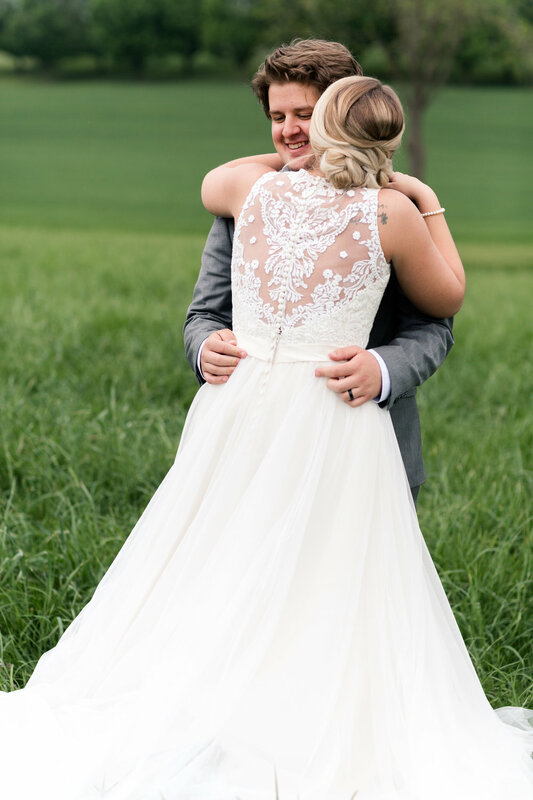 Their engagement session was so much fun and the images were amazing. 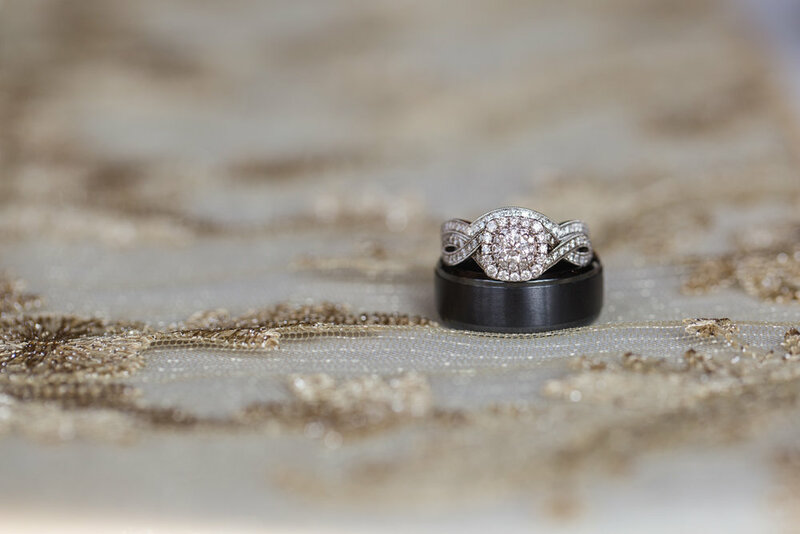 You can check out this feature or my blog post to see their engagement session. 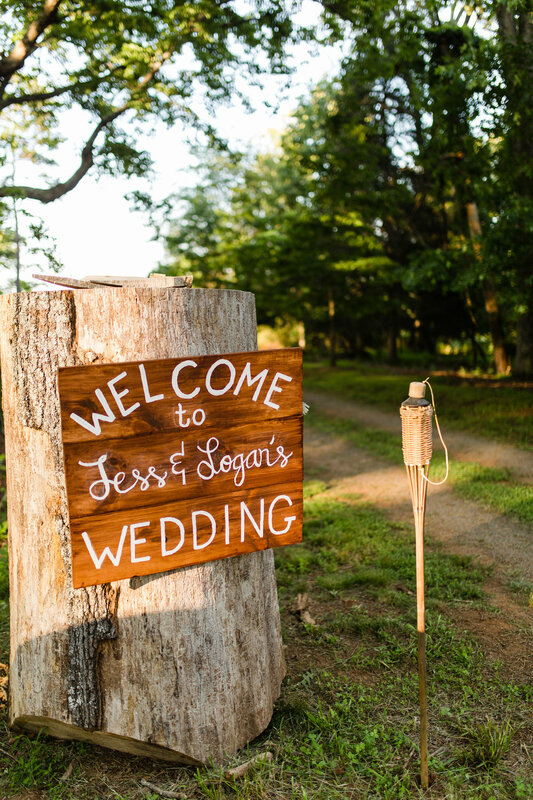 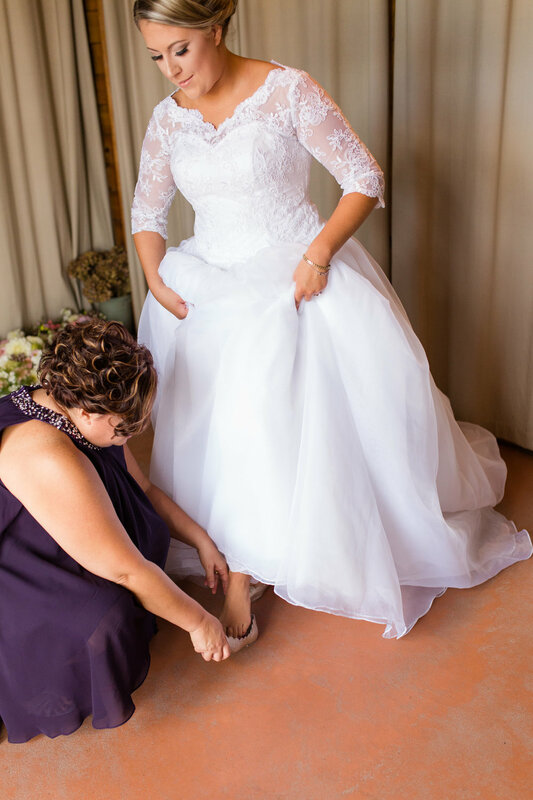 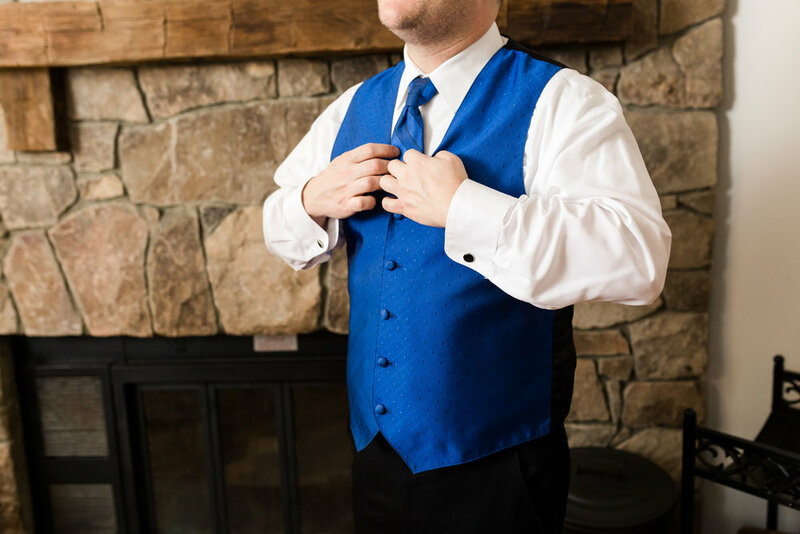 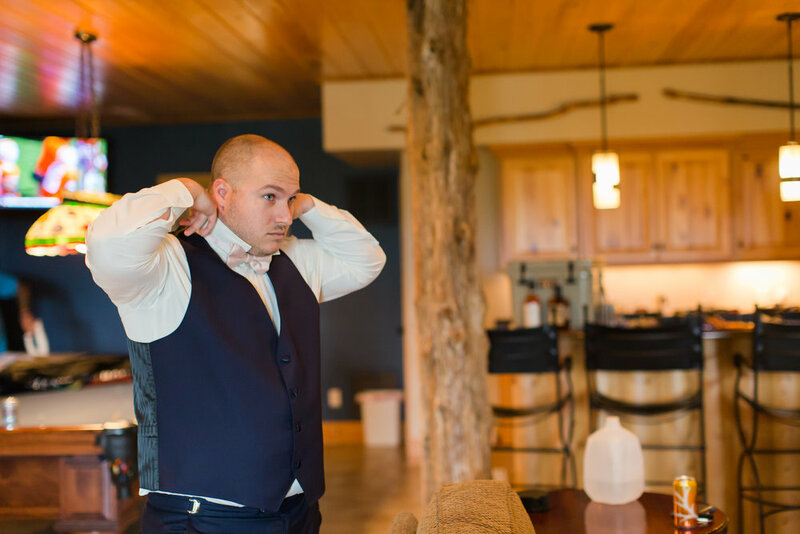 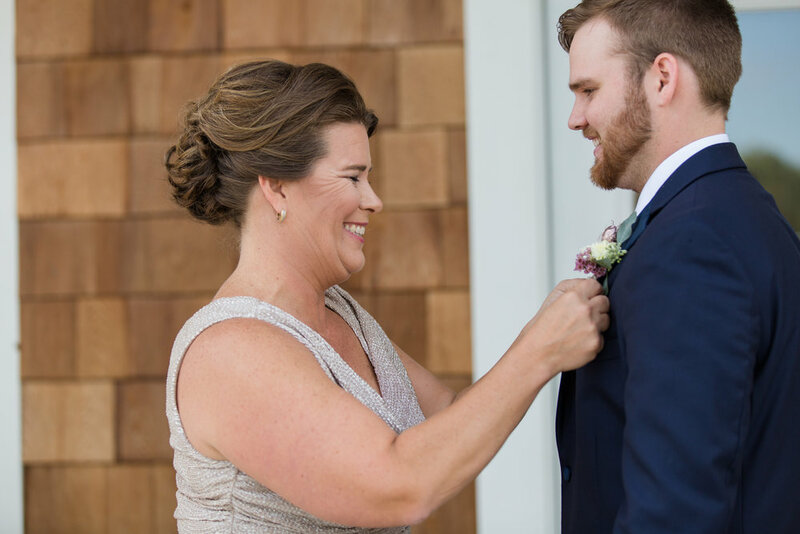 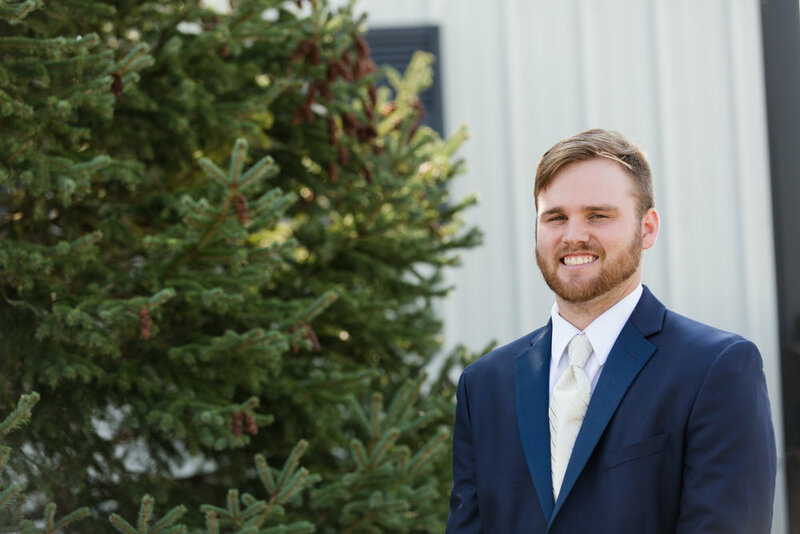 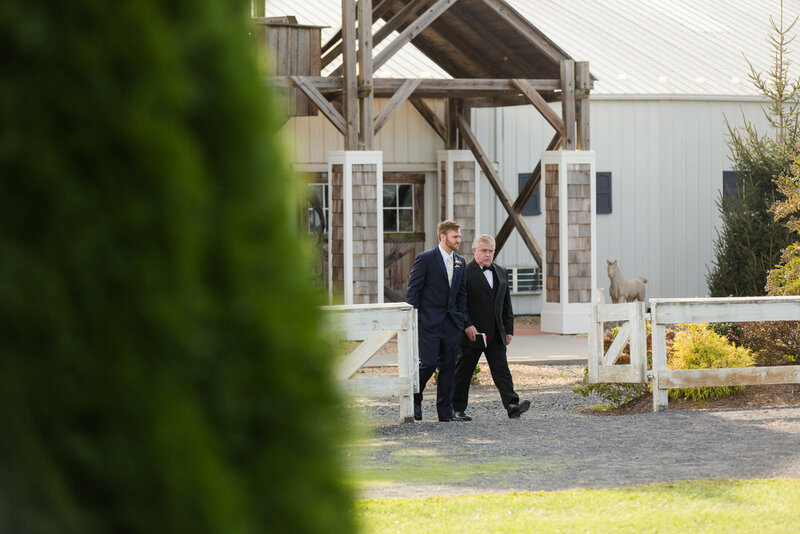 I was so excited for Megan and Zack's wedding because it was my first of two weddings I have scheduled at Hermitage Hill Farm and Stables. 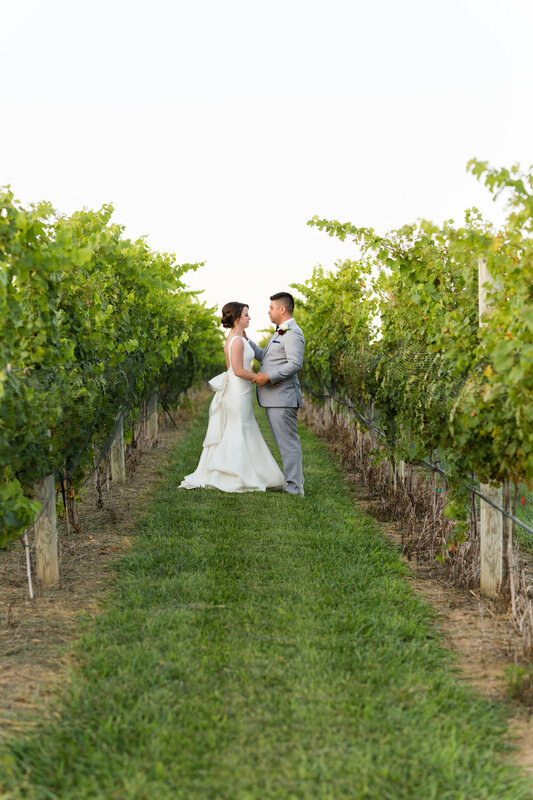 I've heard so many wonderful things about this new venue and couldn't wait to shoot there. 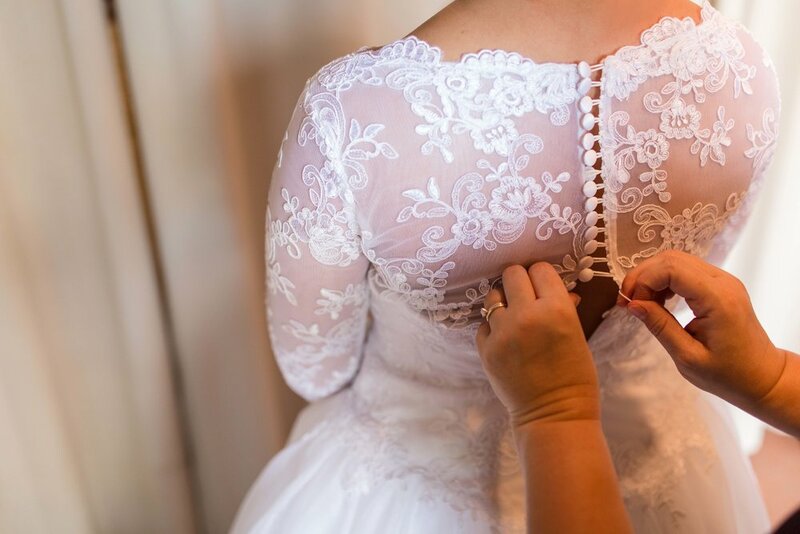 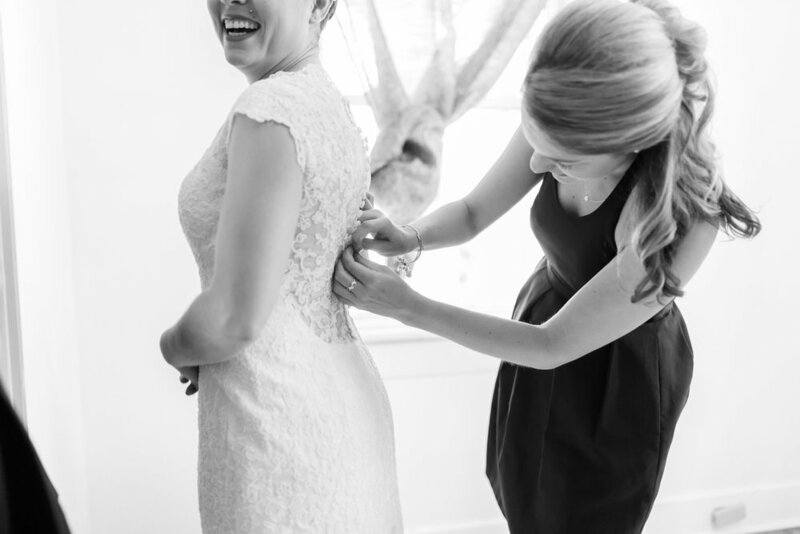 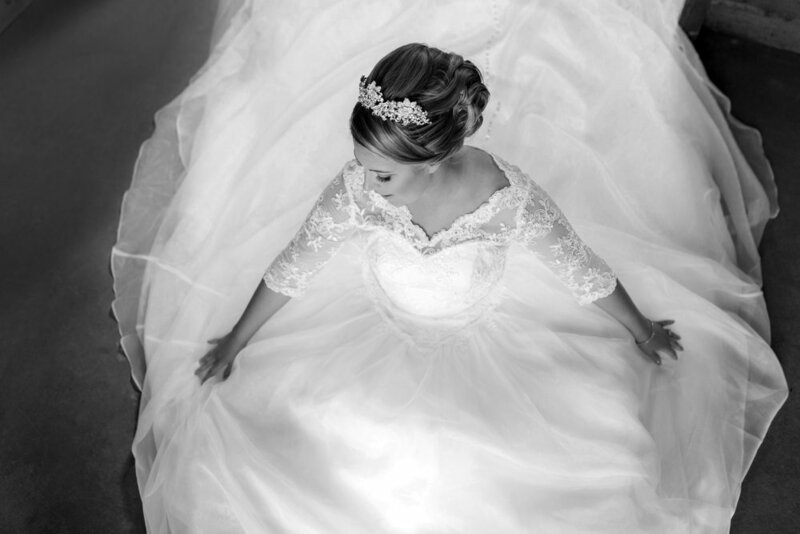 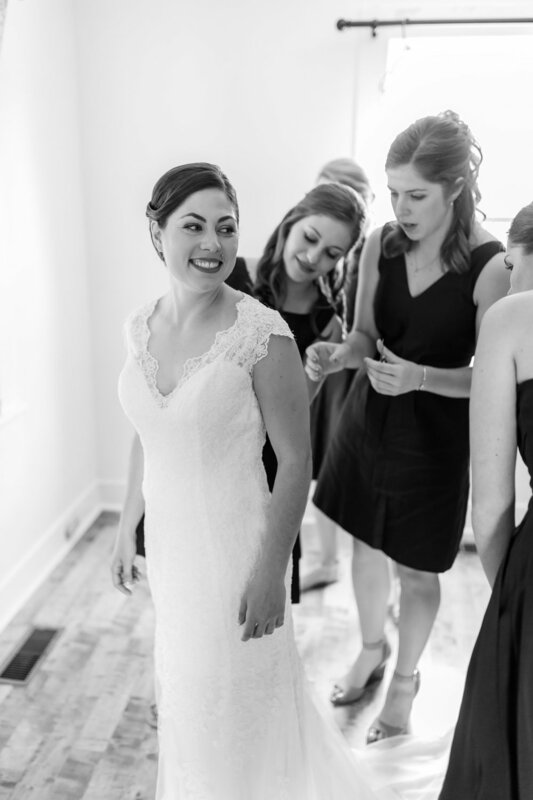 I also knew that Megan's wedding gown which was custom made by White Dress by Greta Kay was going to be gorgeous. 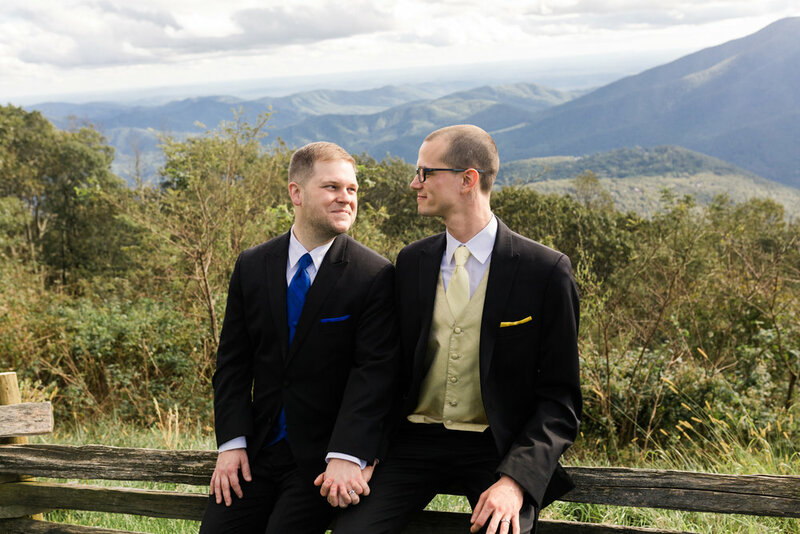 The weather was so perfect for their wedding day, it was a warm and sunny October afternoon. 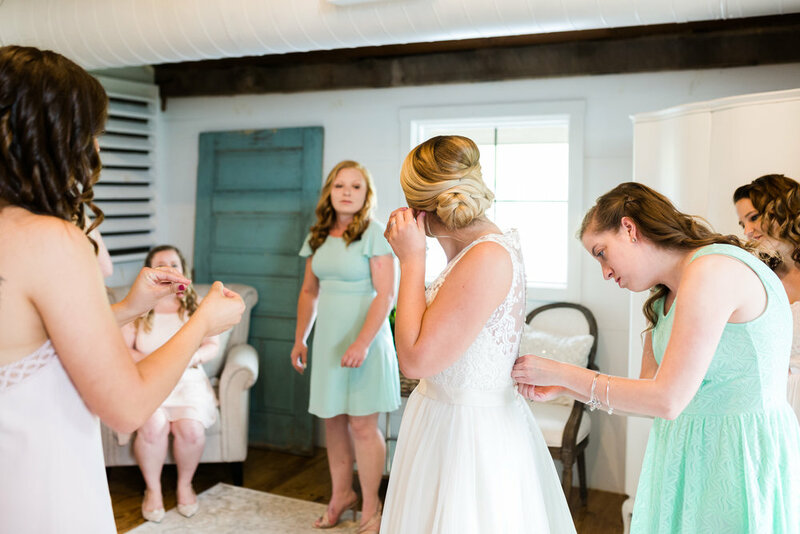 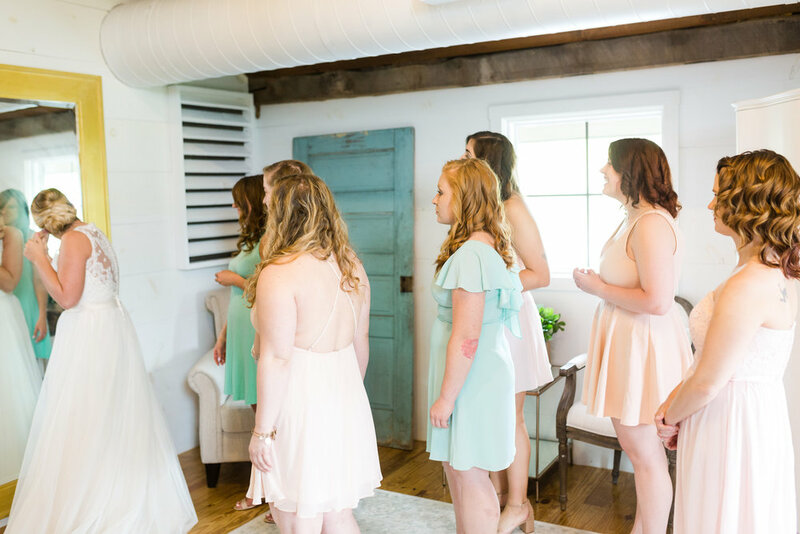 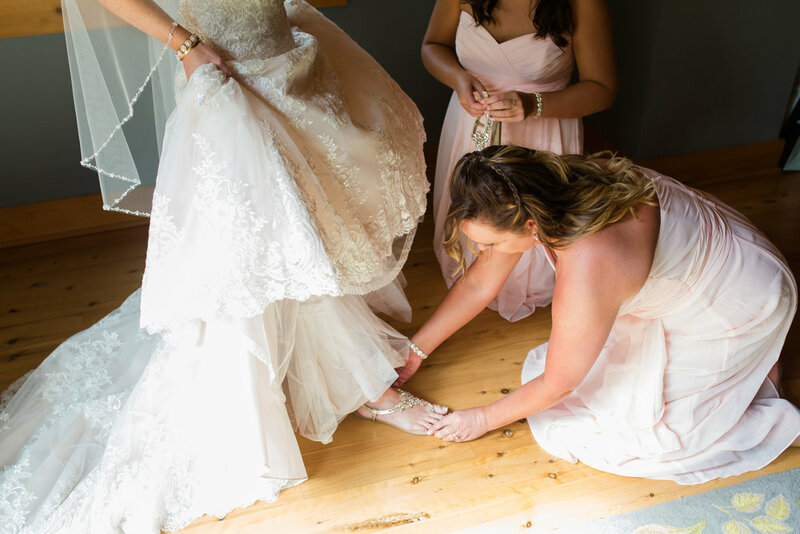 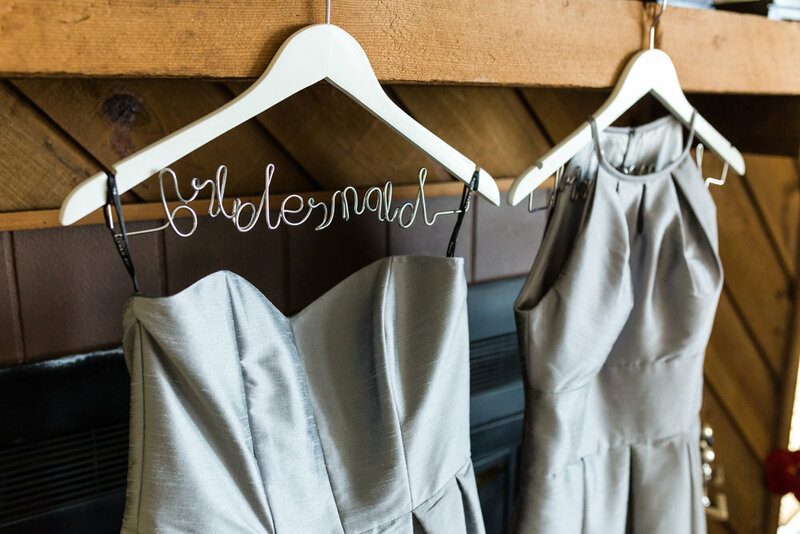 The girls were getting ready in the bridal suite while the guys were hanging out in Hermitage Hill's brewery, Stable Craft. 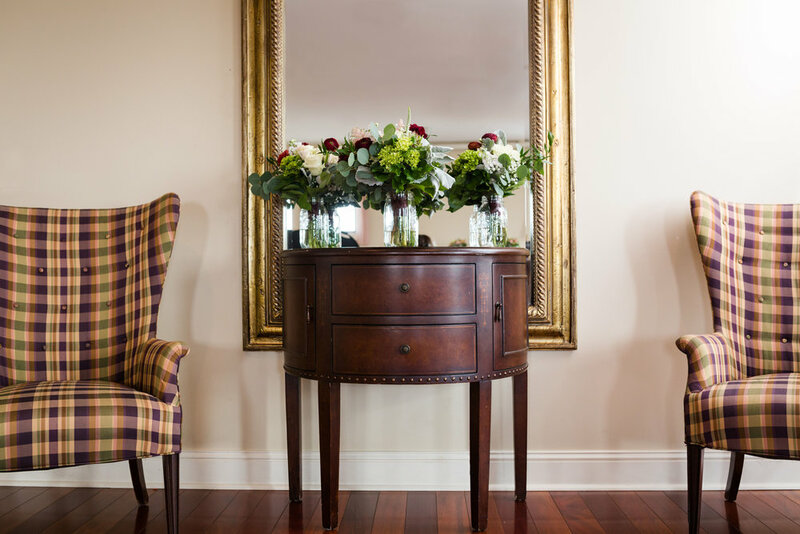 I love the main reception room at Hermitage Hill. 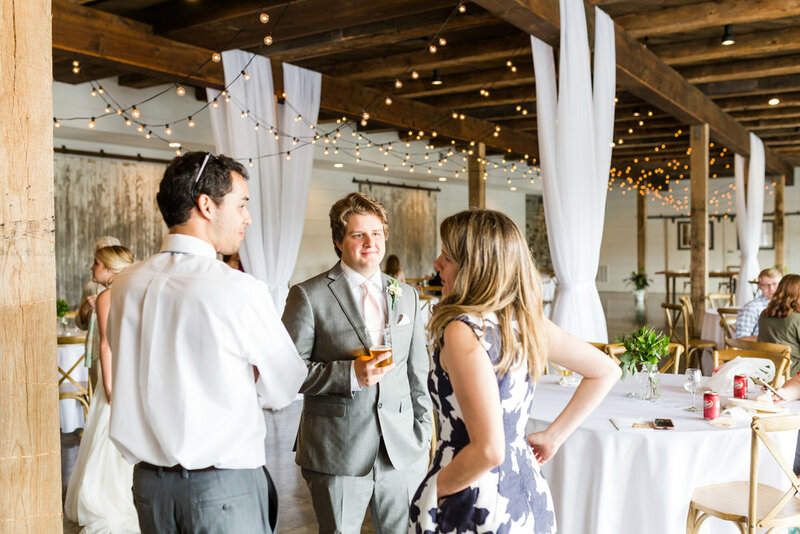 There is so much natural light and lots of warmth from the wood decor. 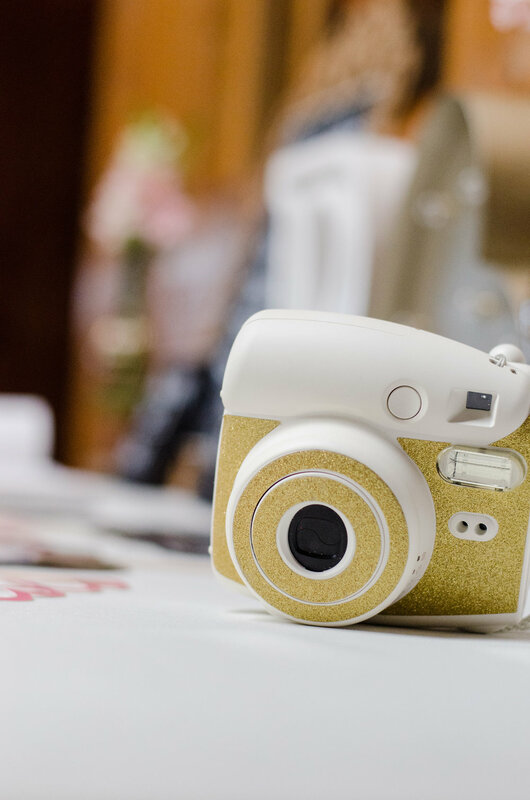 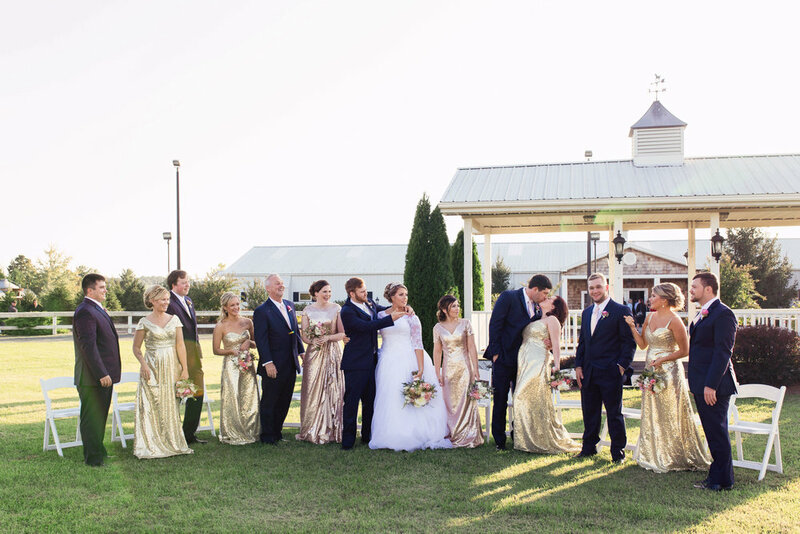 Megan chose a simple yet elegant decorations of gold and rose throughout the room. 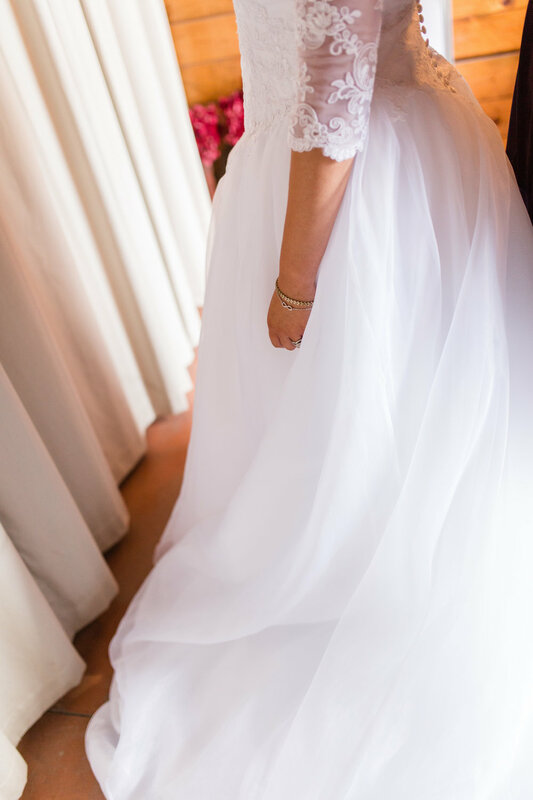 Megan's dress was in fact amazing. 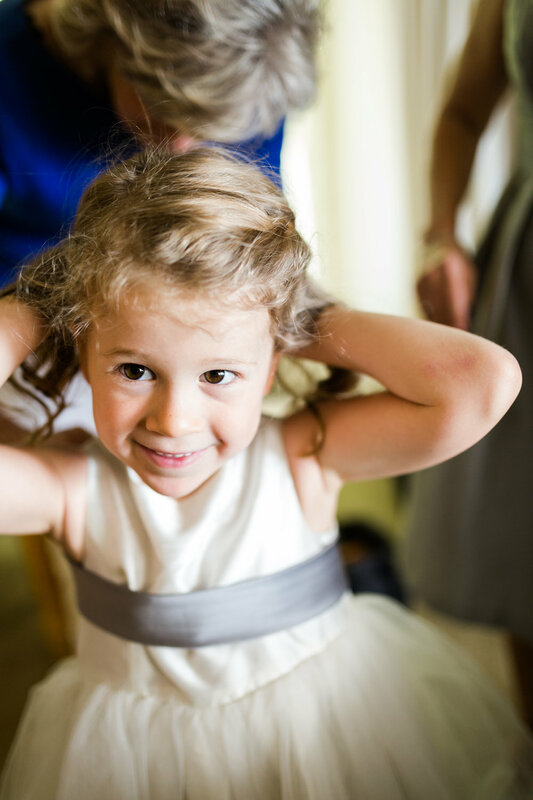 She told me she wanted to look like a princess and that's exactly what she looked liked in her custom gown and headpiece. 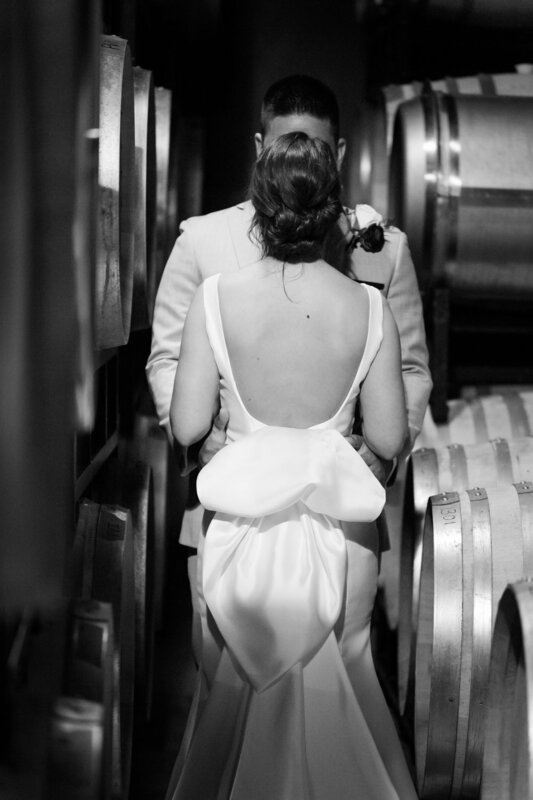 This dress had so many layers and buttons the whole way down the train. 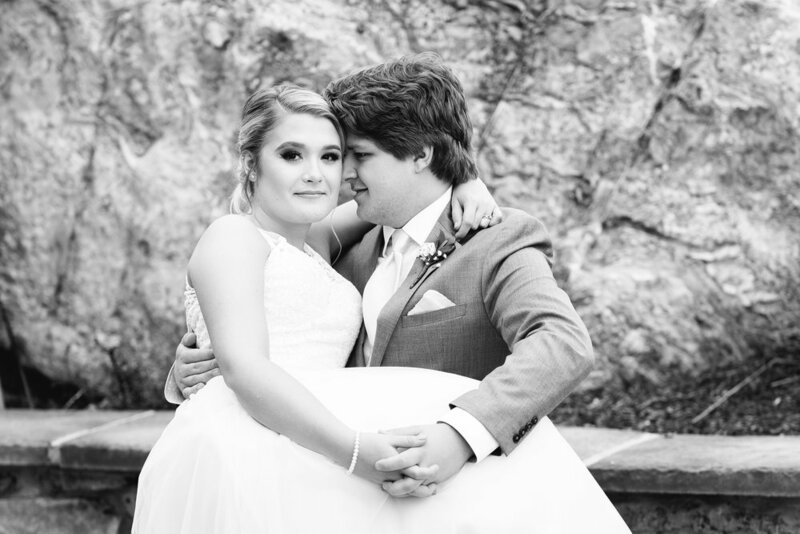 It was so much fun to photograph. 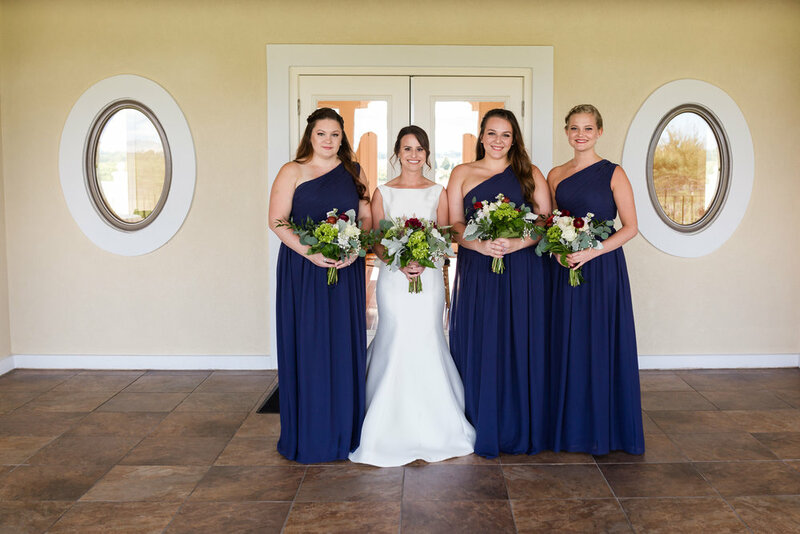 The bridesmaid's dresses, also custom made by White Dress by Greta Kay were equally as stunning. 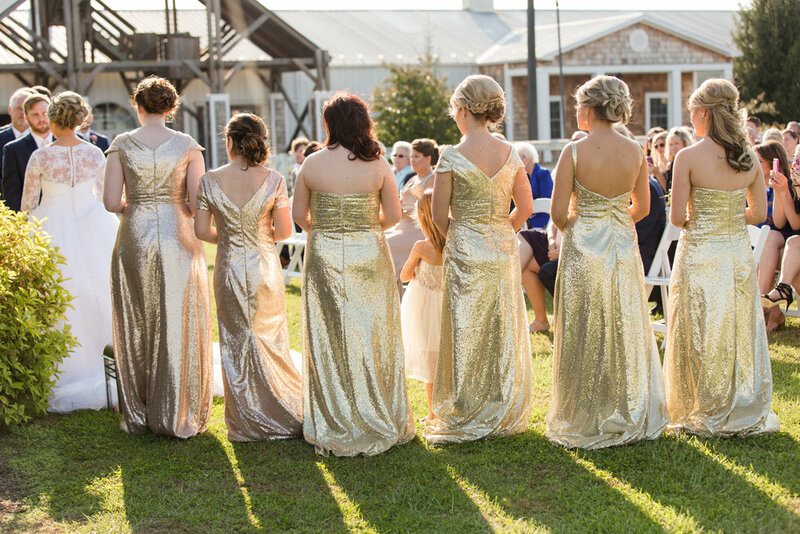 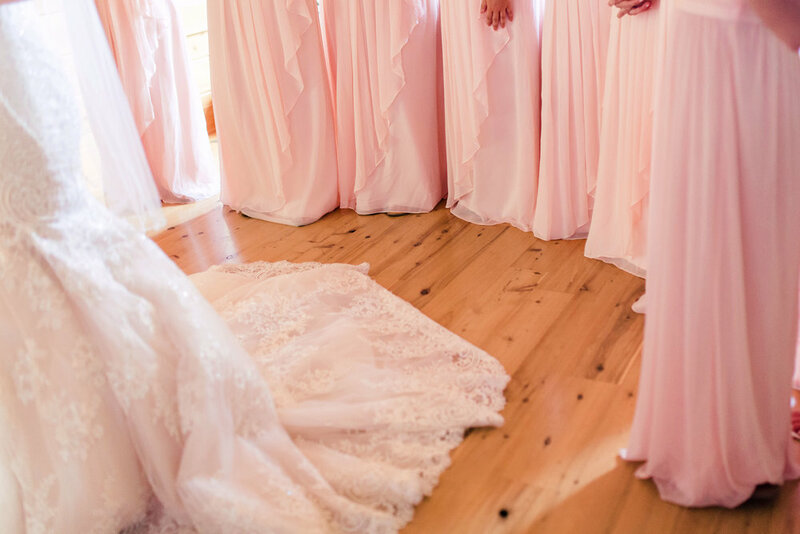 They sparkled in the sunlight and fit each bridesmaid so perfectly. 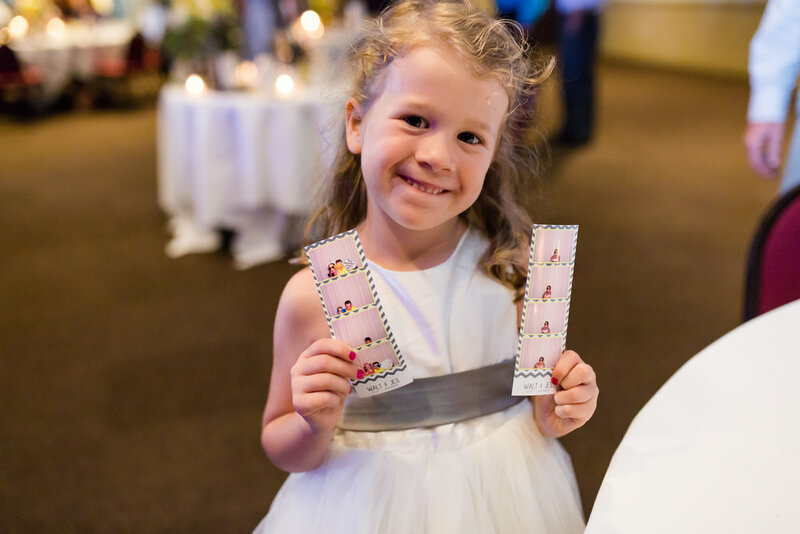 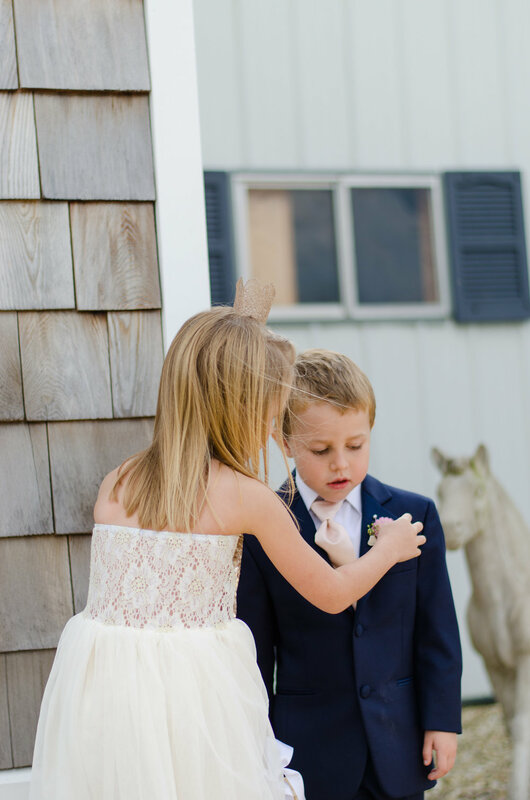 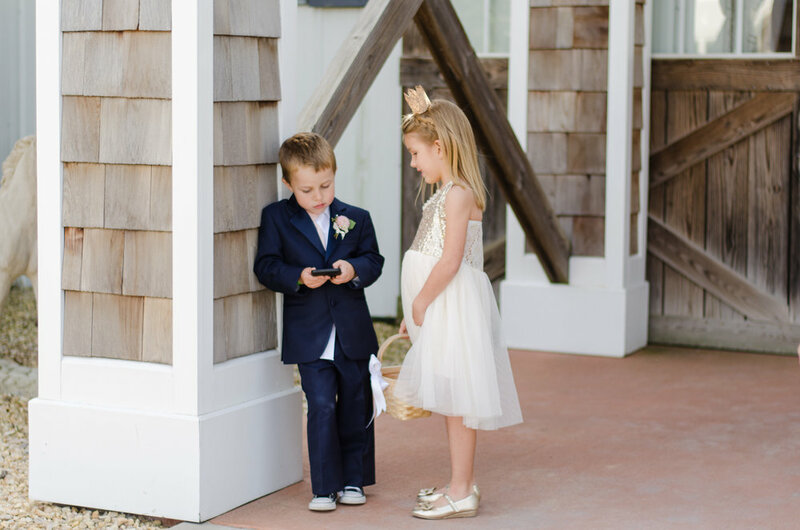 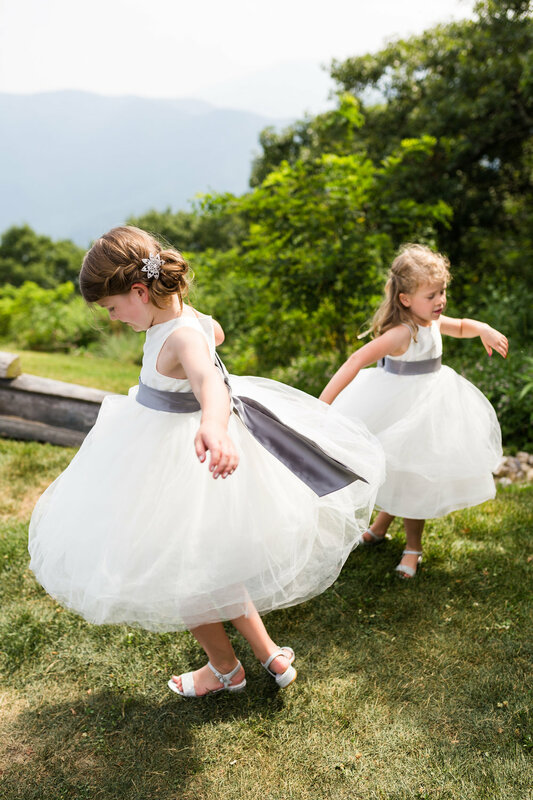 They even found matching flower girl dresses online, and these flower girls were so precious! 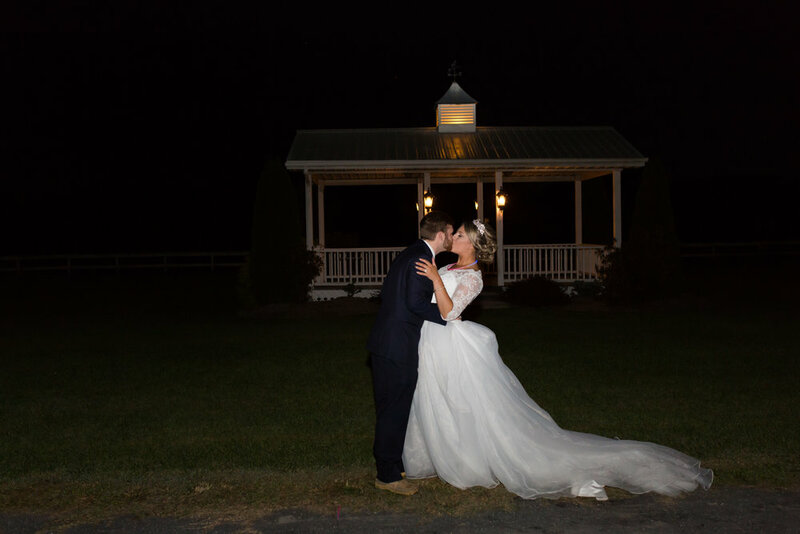 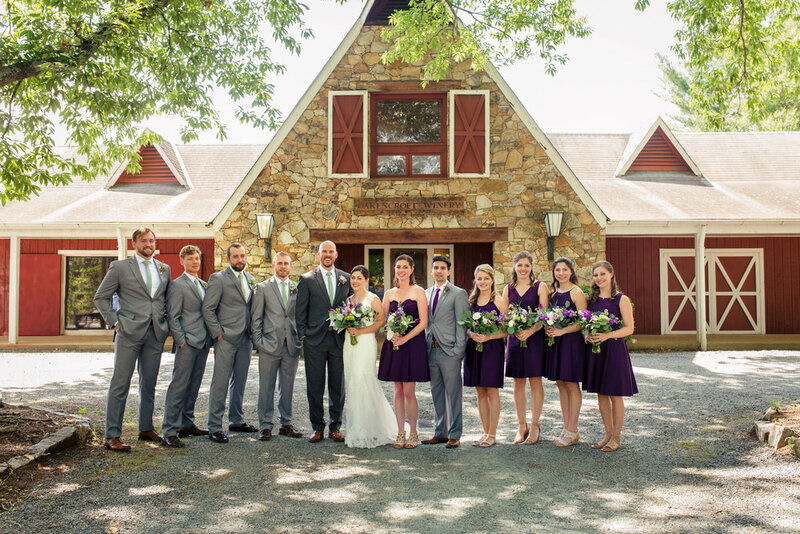 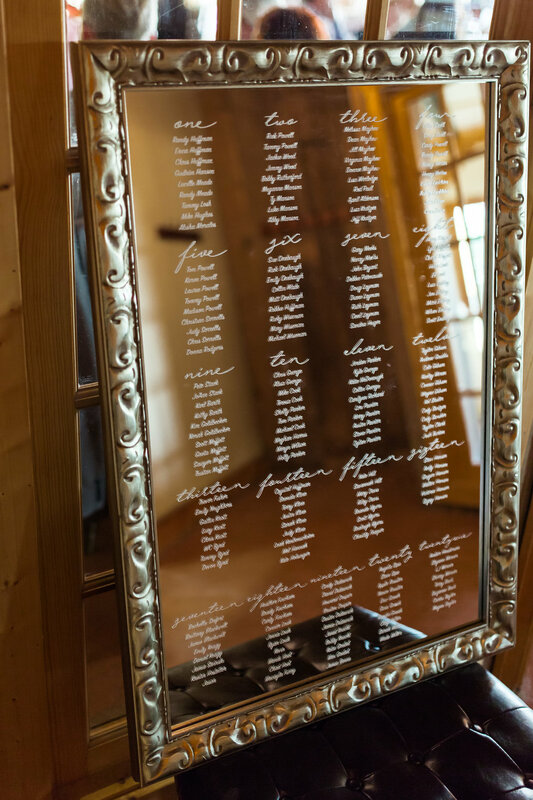 Their ceremony was held outside in the horse rink of Hermitage Hill Farm and Stables. 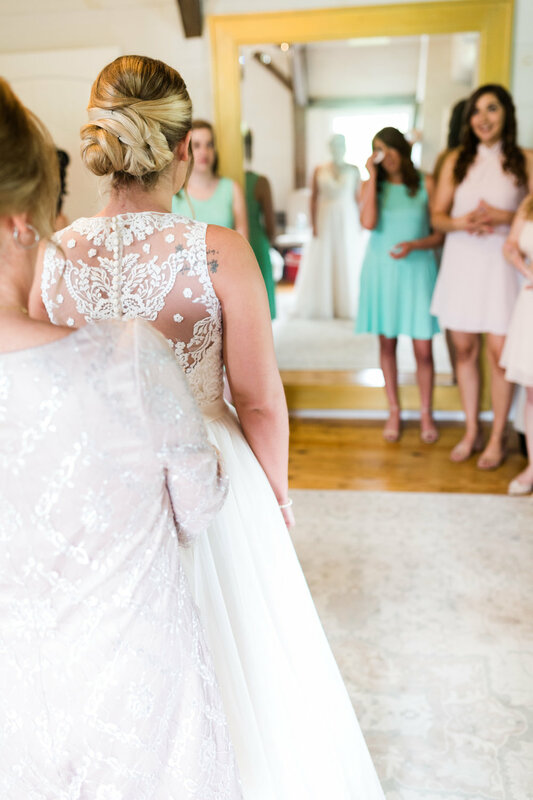 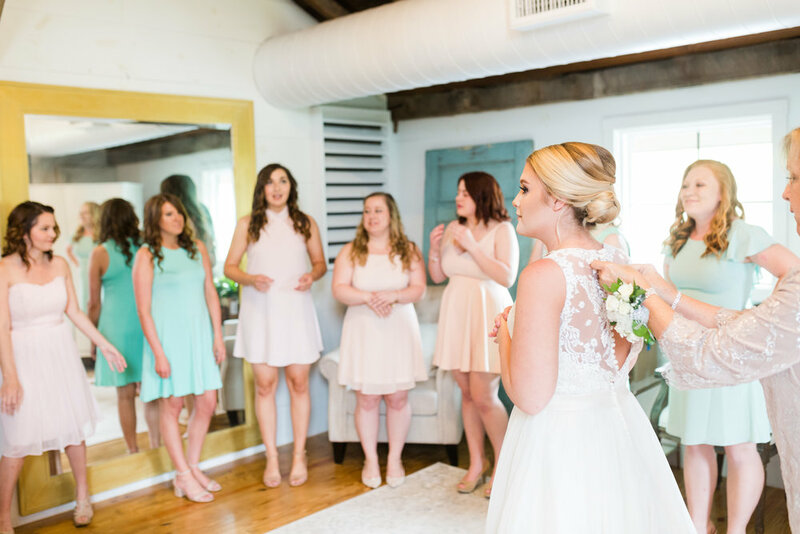 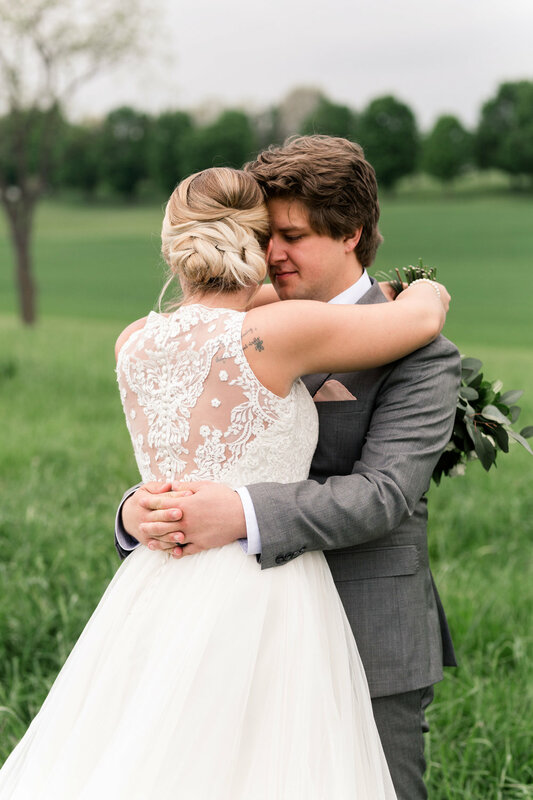 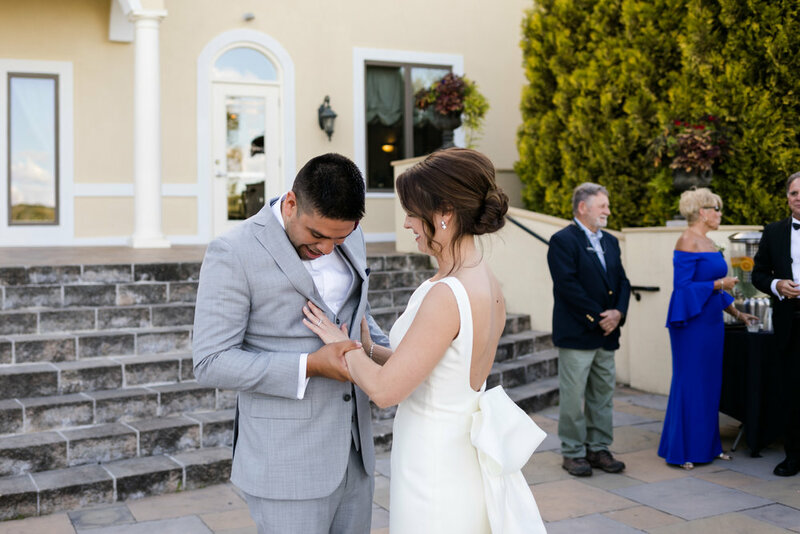 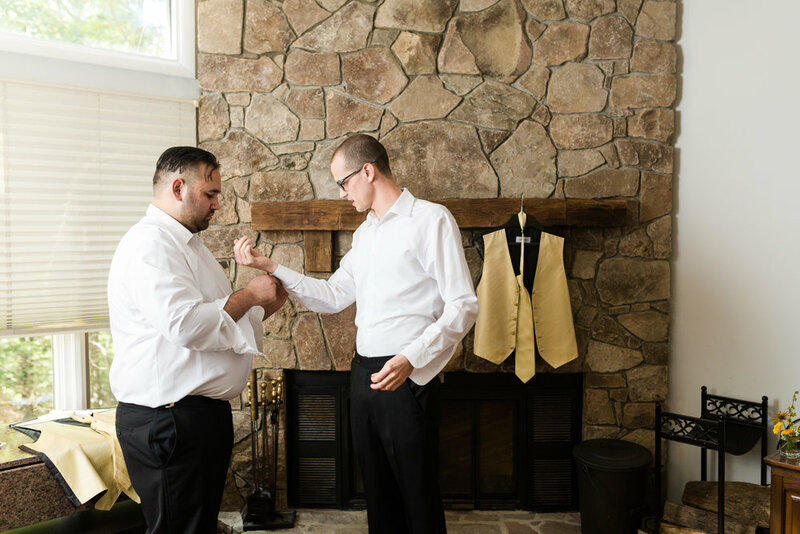 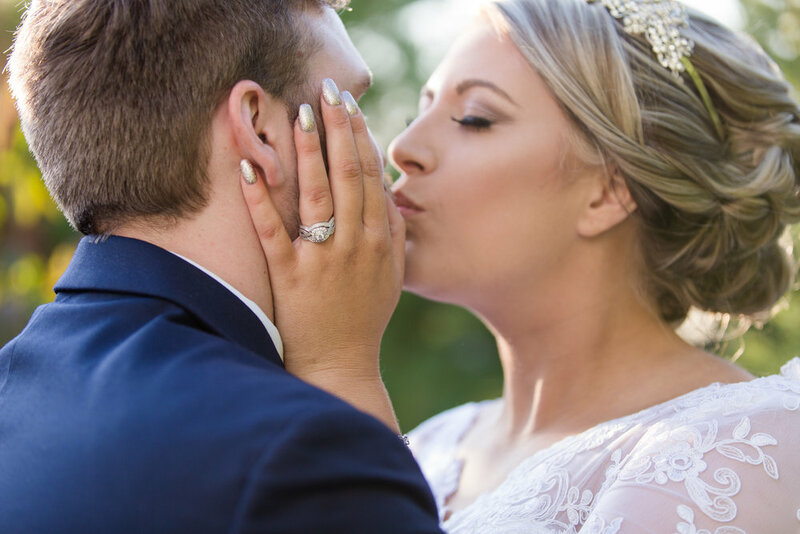 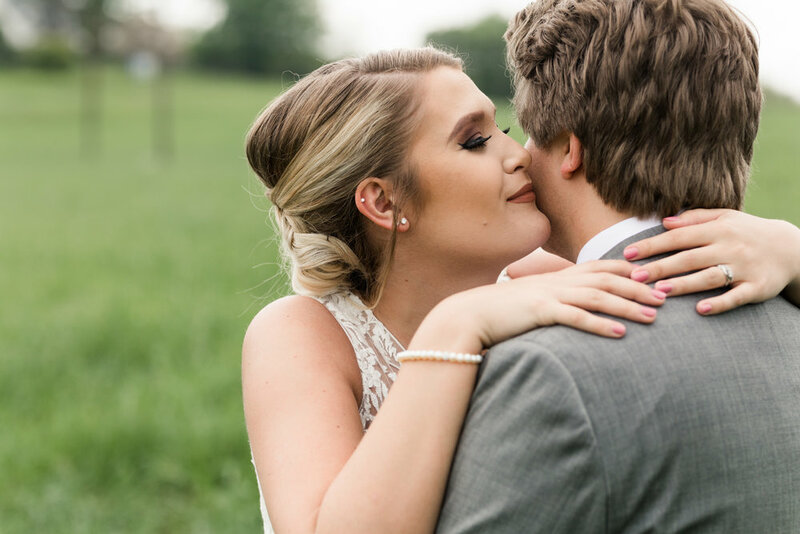 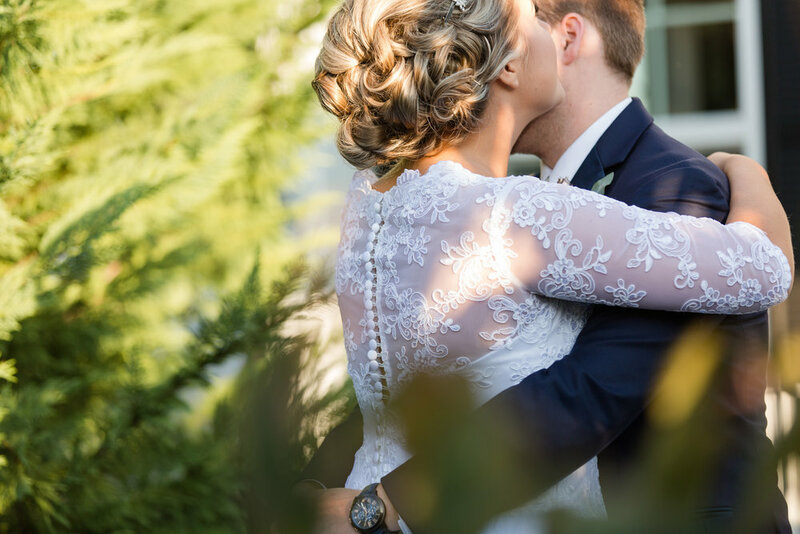 Megan and Zack did not do a first look before their ceremony, and it was so special as they saw each other for the first time. 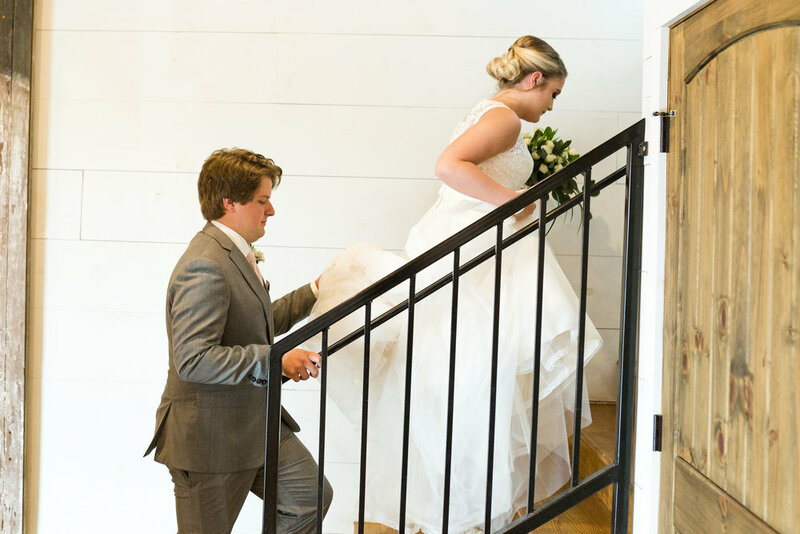 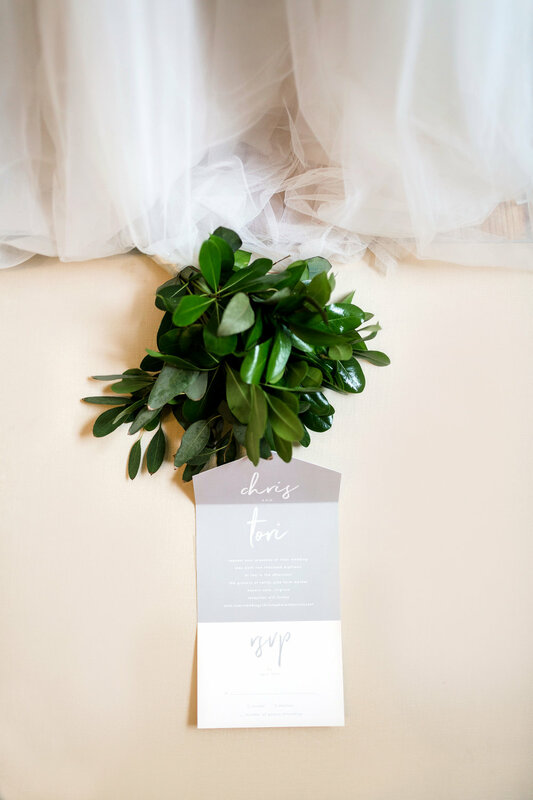 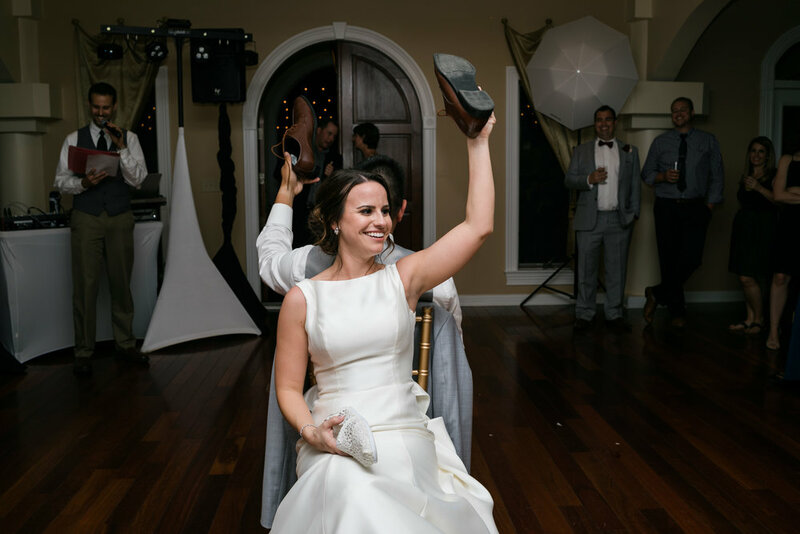 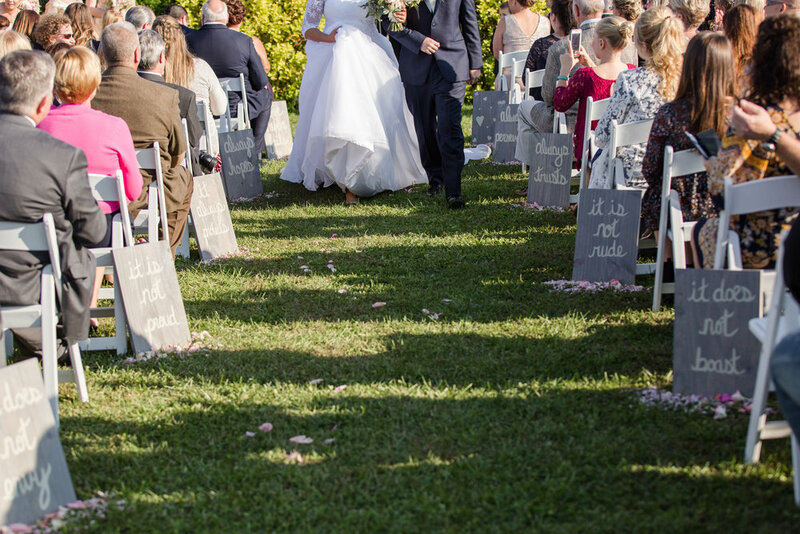 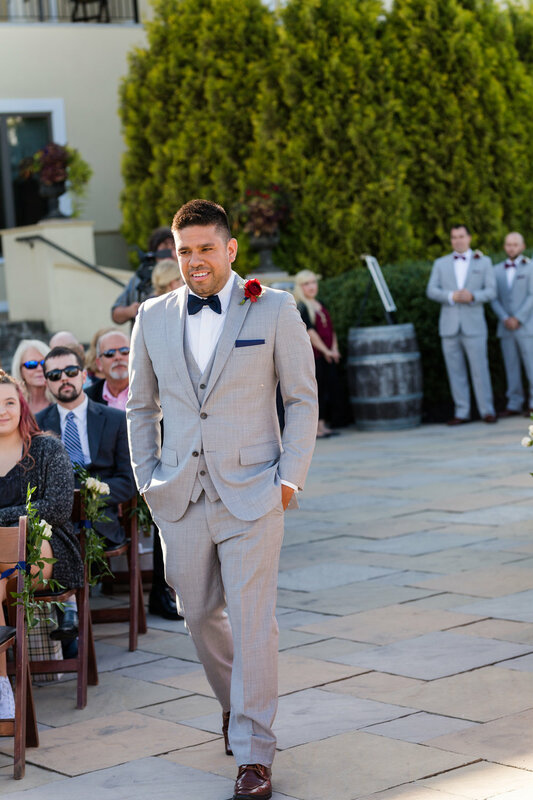 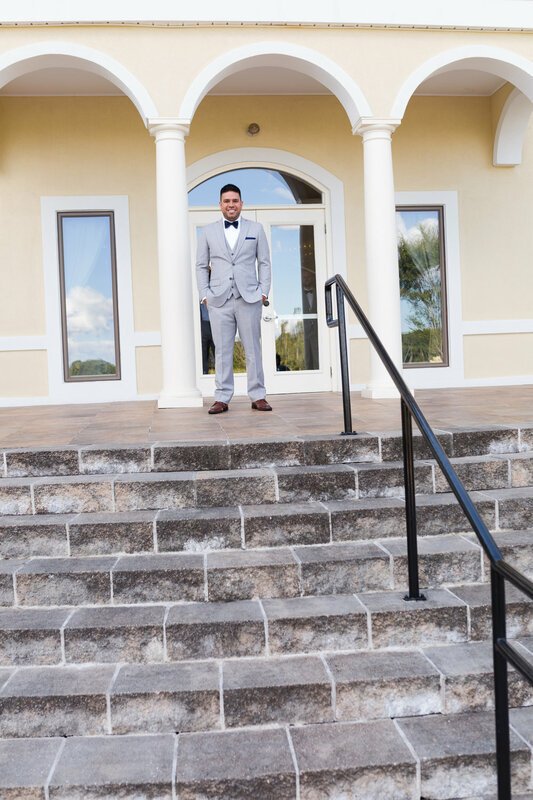 With handwritten wooden signs and rose petals lining the aisle, Megan looked beautiful walking to meet her future husband. 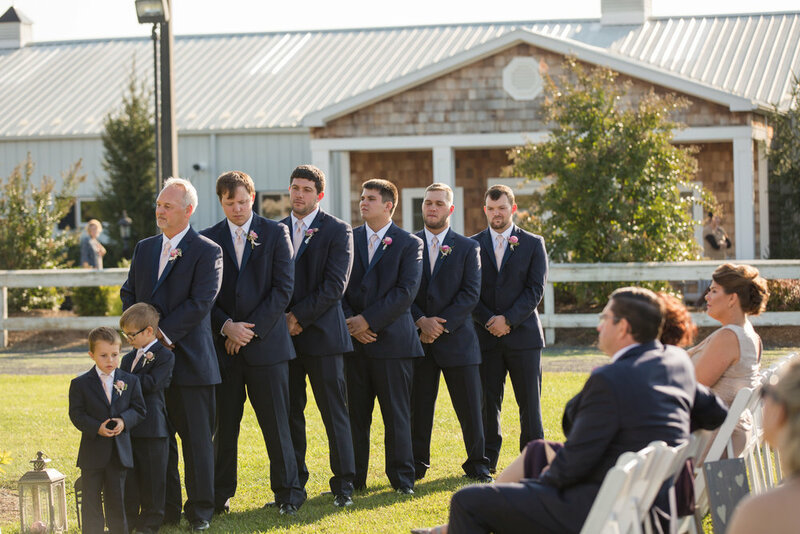 The flower girls and ring bearers did a great job walking down the aisle too. 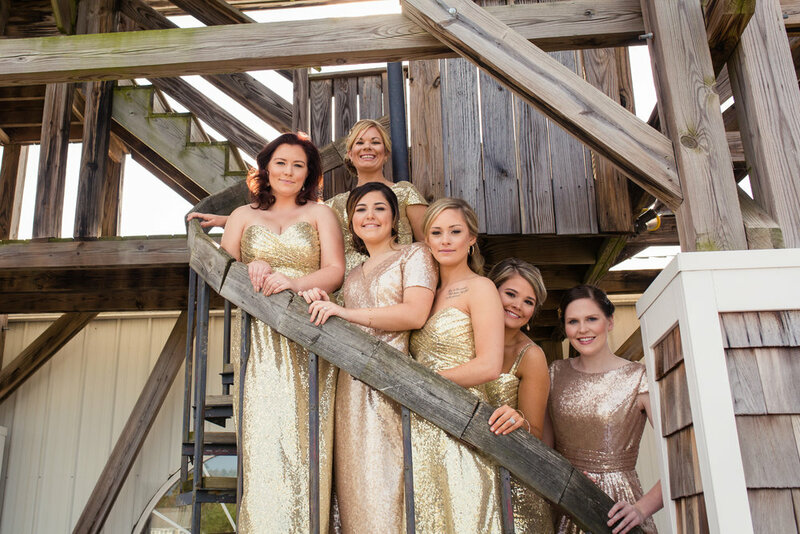 The sun glistened against the rose and gold sequin dresses. 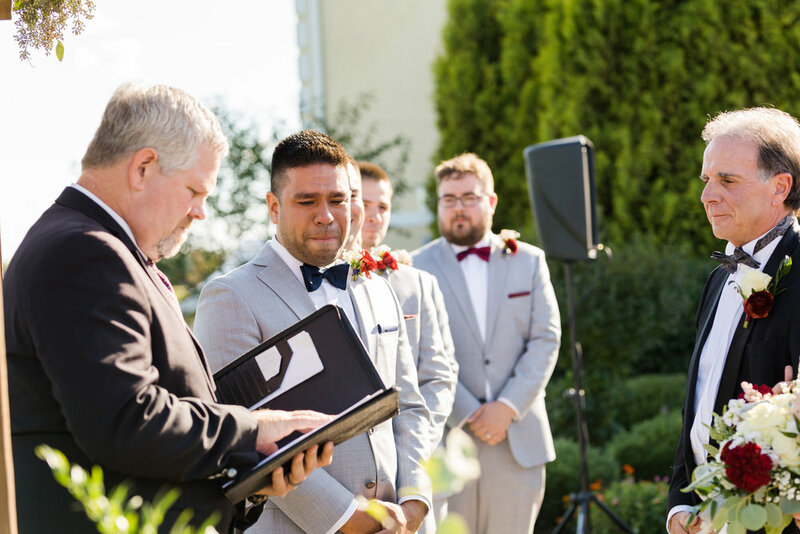 It was the perfect outdoor ceremony. 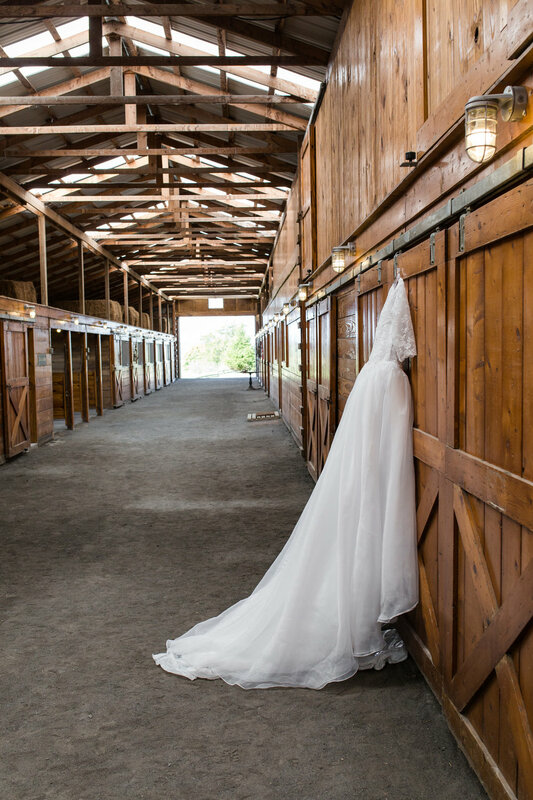 The reception decor inside Hermitage Hill Farm and Stables was perfect for Megan's fairy tale wedding. 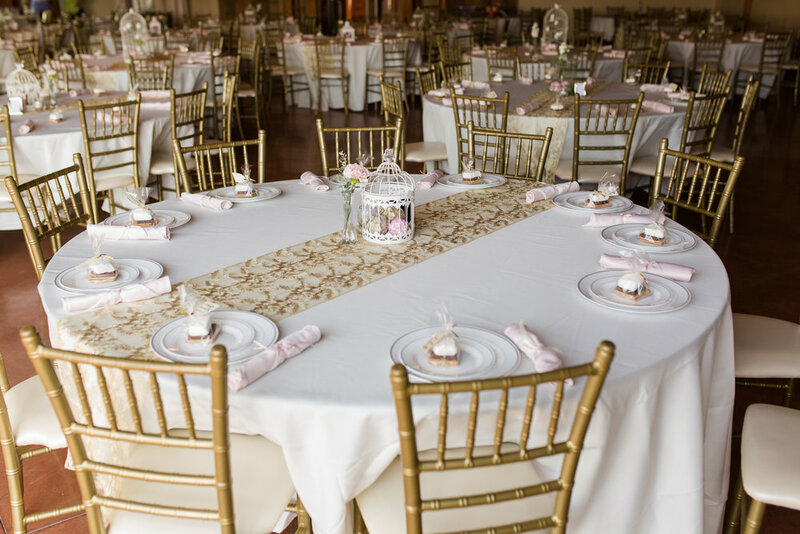 The gold chairs and table runners with her rose accents were delicate and beautiful. 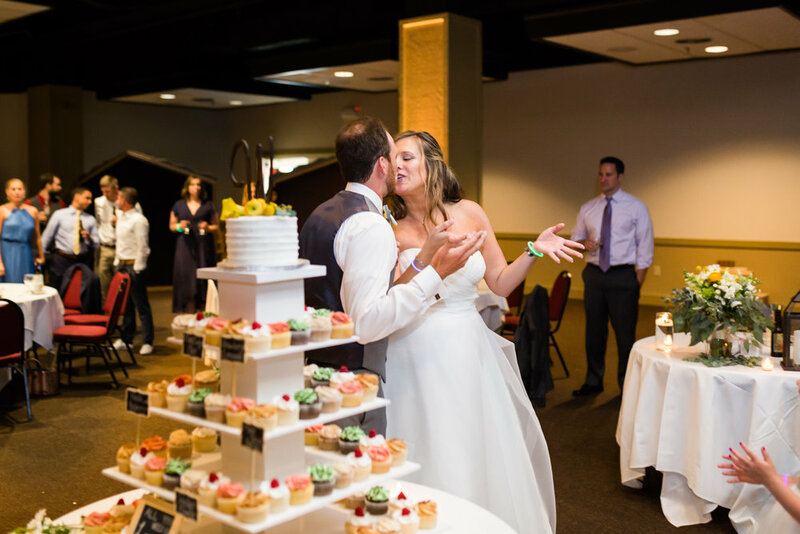 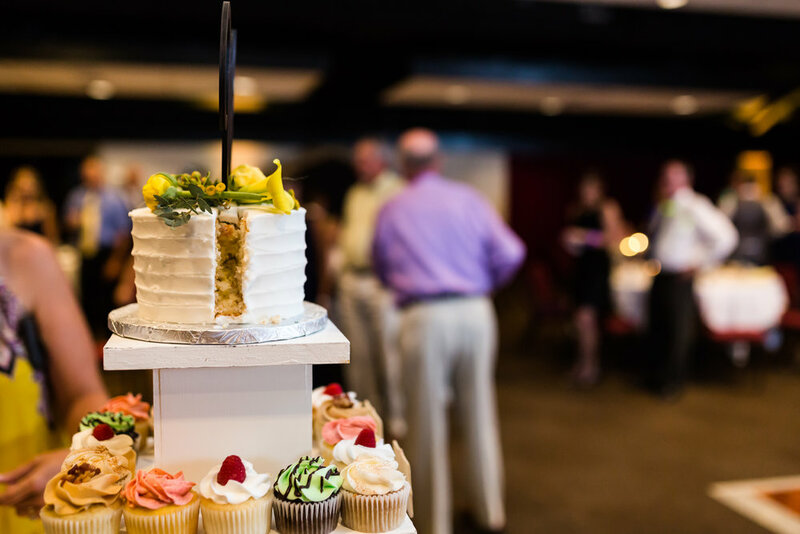 There was a large dance floor, a buffet of delicious BBQ, and a table stacked with cupcakes with a cheesecake on top! 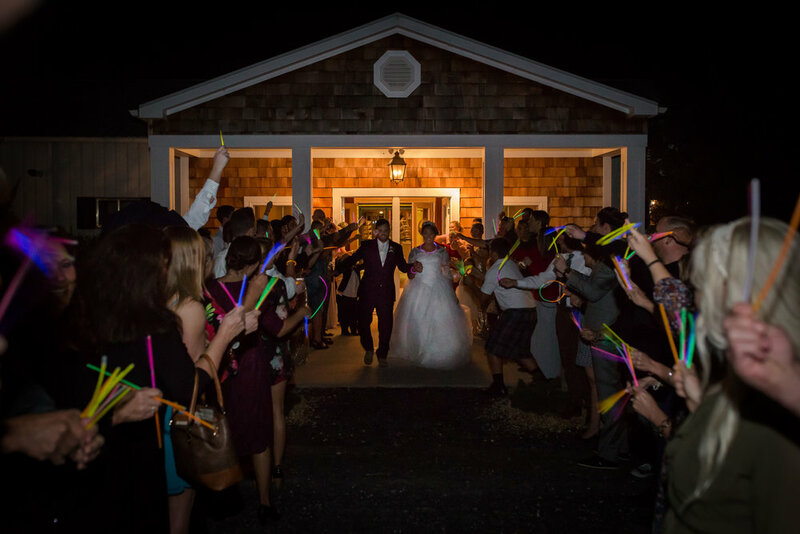 There was a lot of dancing and the couple made an exit lined with glow sticks to end the night. 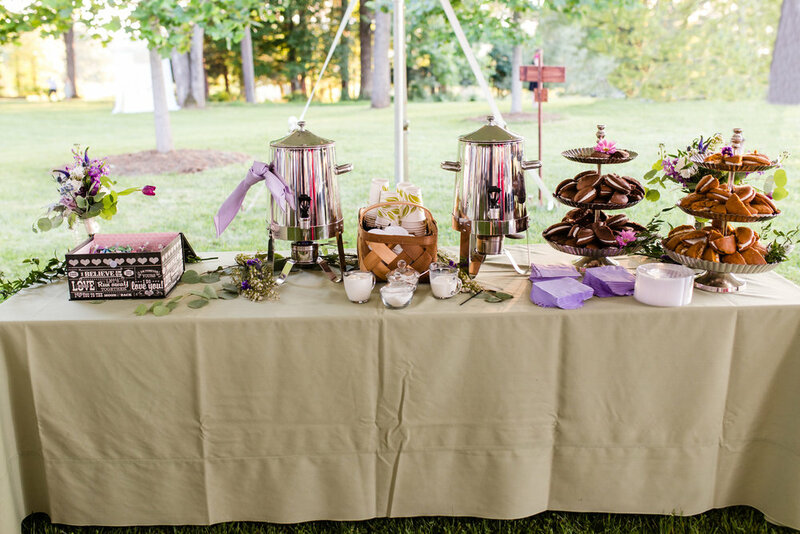 Sit back with a cup of coffee because this blog post has a lot of images!! 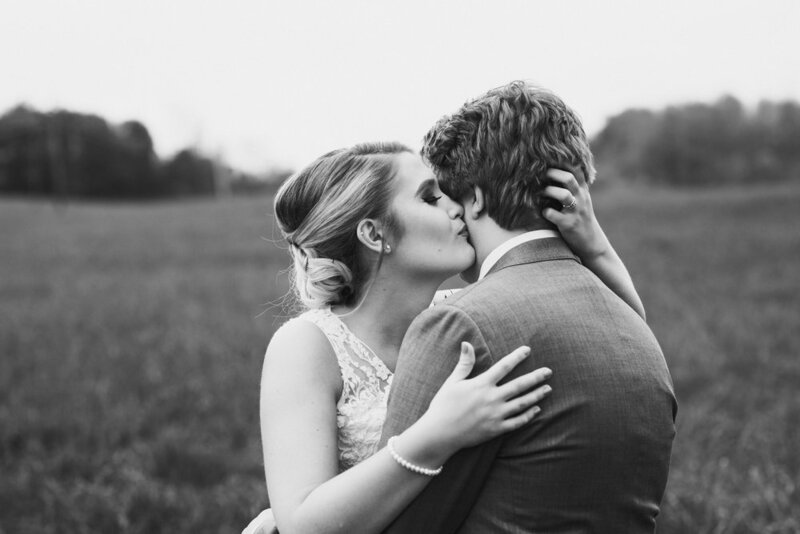 I first met Mandy and Matt for their fall engagement session. 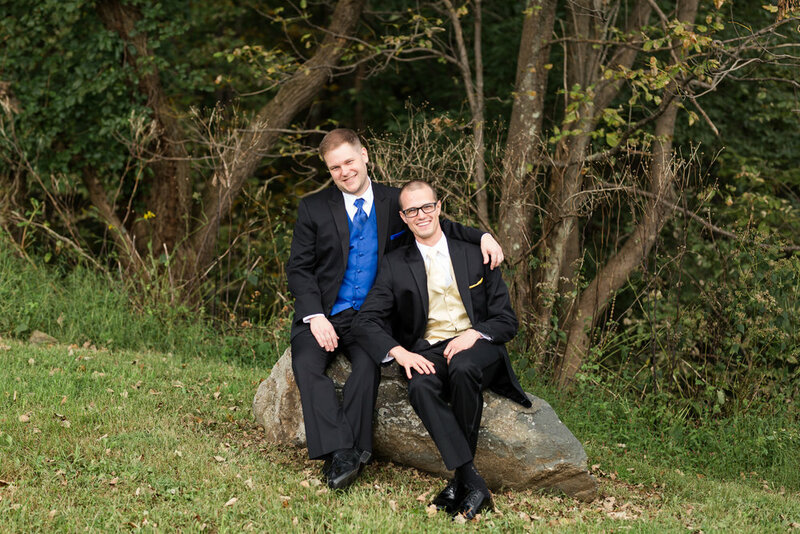 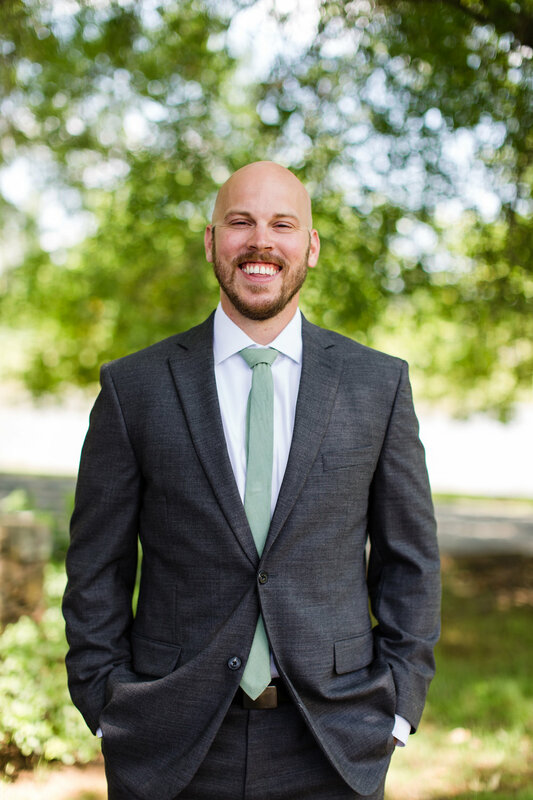 Matt was deployed overseas and came home just as the leaves had changed for fall and their session was so beautiful. 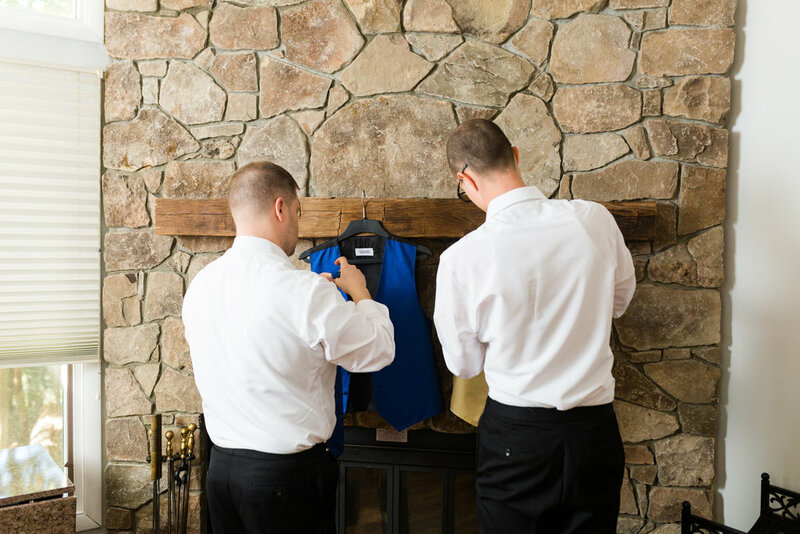 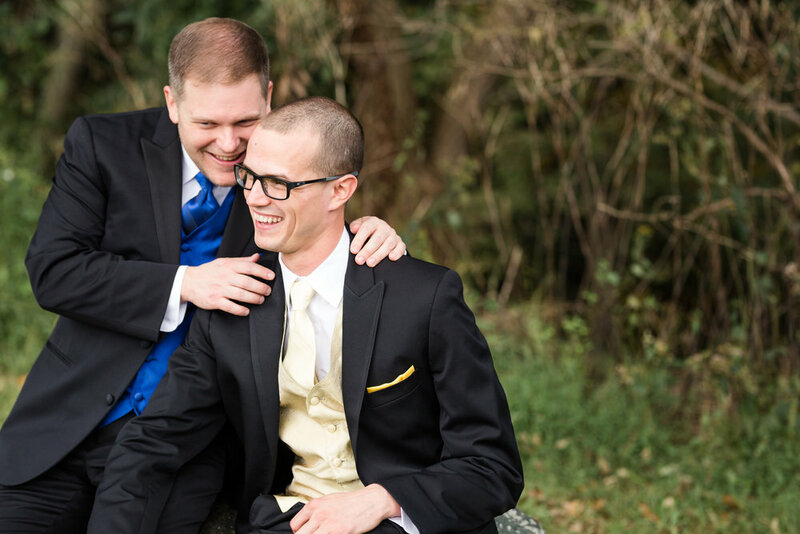 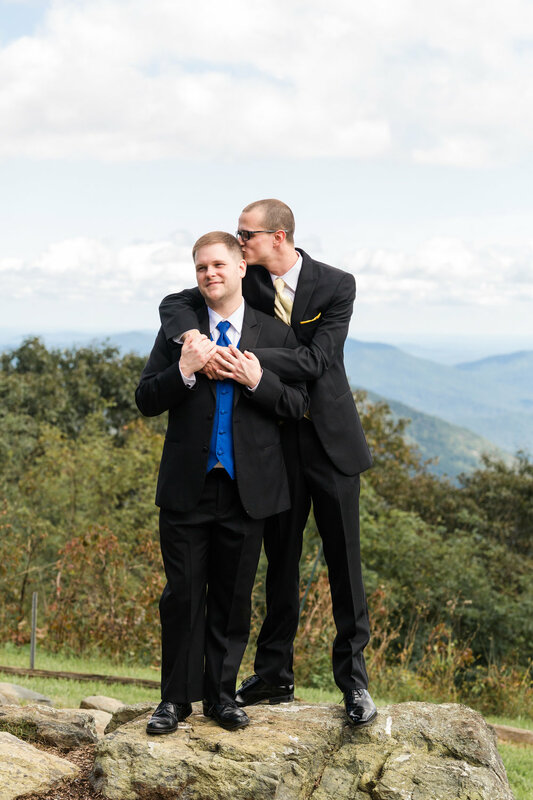 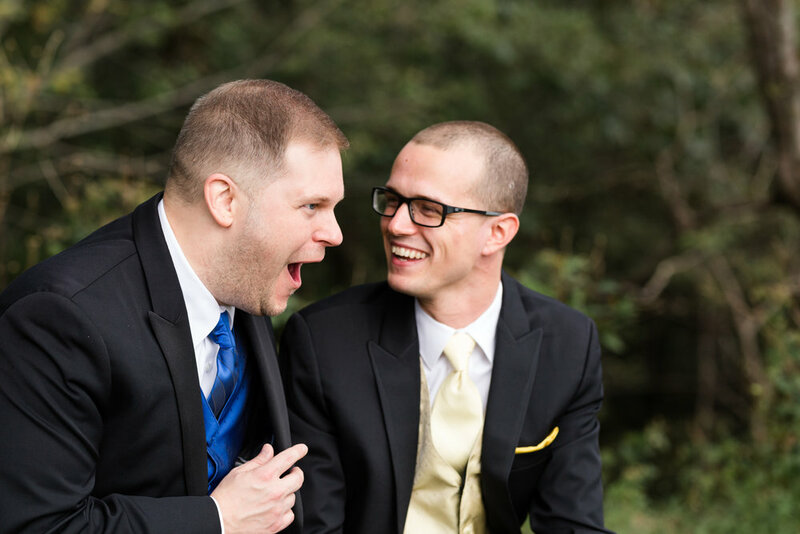 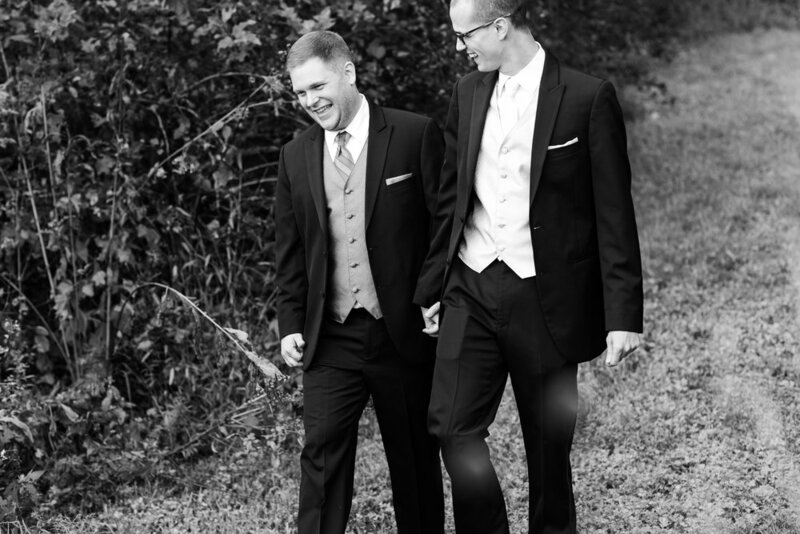 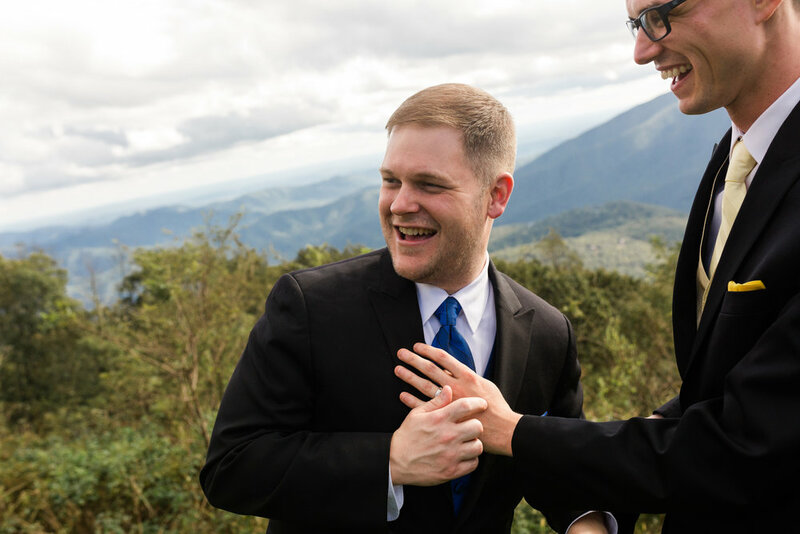 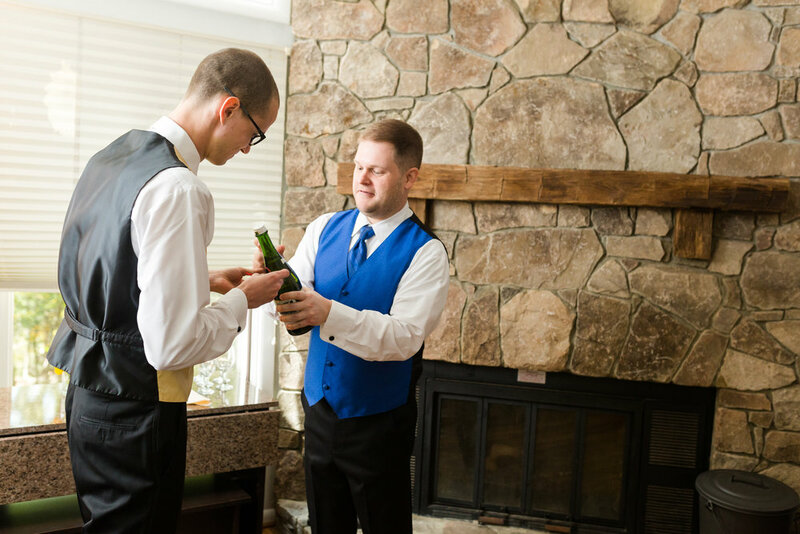 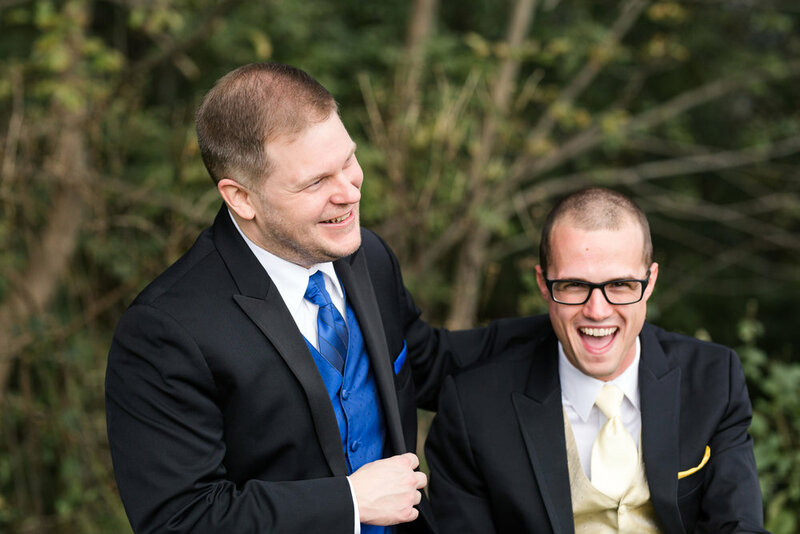 They continued to plan their wedding while Matt was overseas and with the help of family. 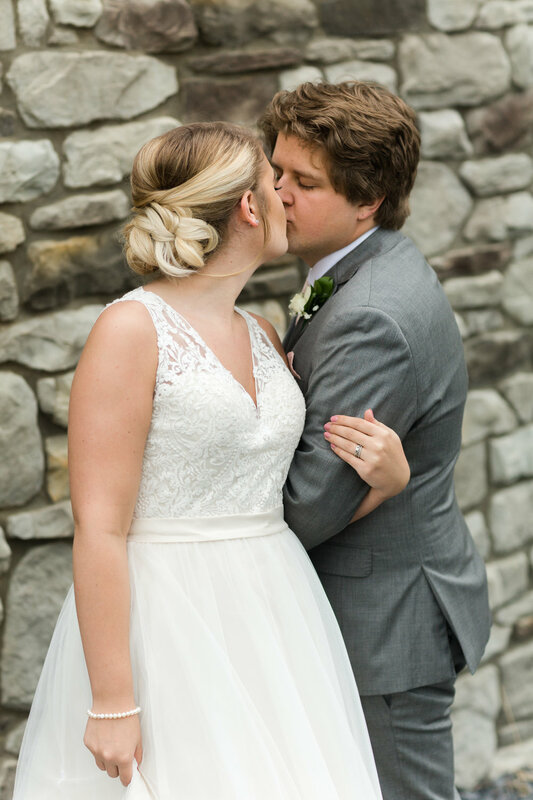 I was so excited when they asked me to be their wedding photographer because I knew it was going to be a beautiful wedding! 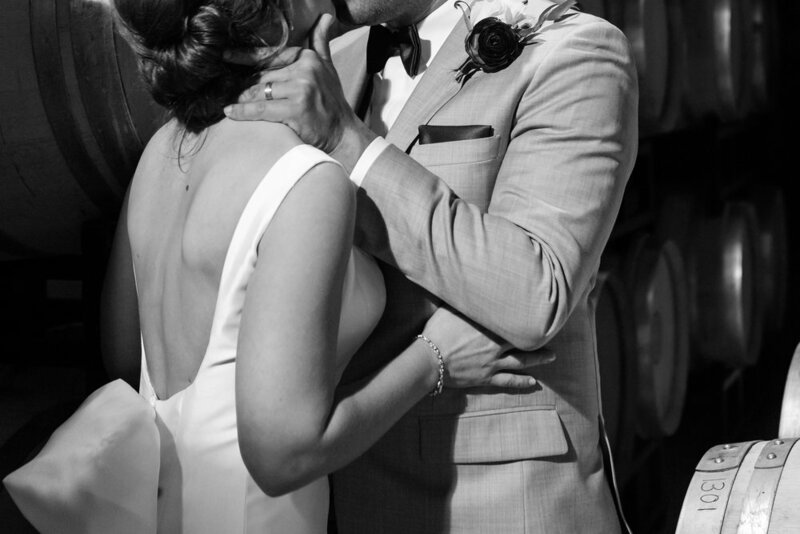 What I didn't know at the time was how emotional these two were. 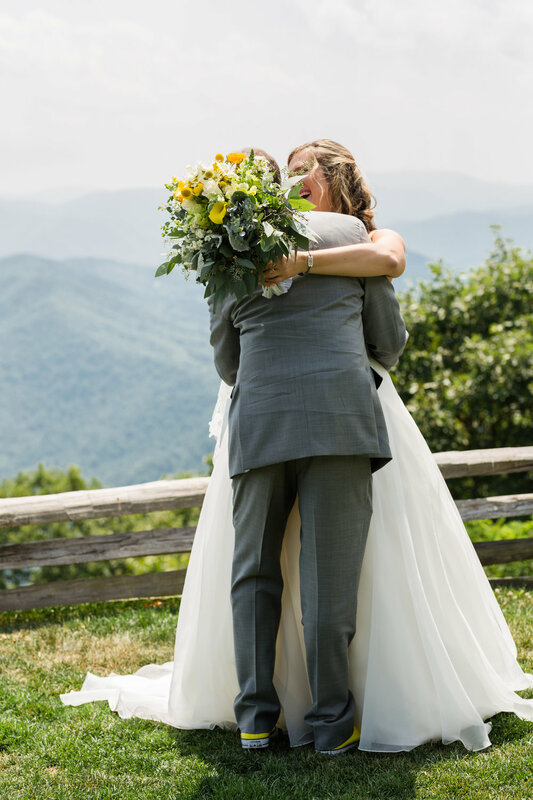 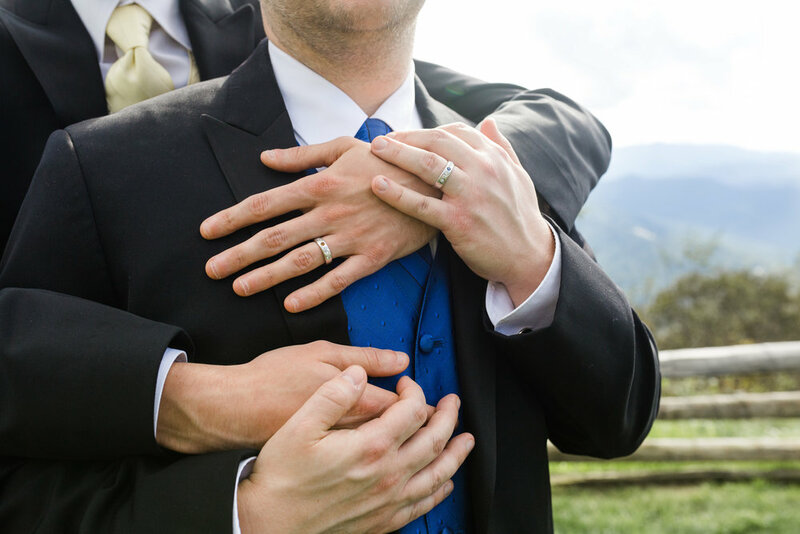 I cannot help but tearing up when couples express their love so openly with their friends and family, and I teared up more than once on this day too. 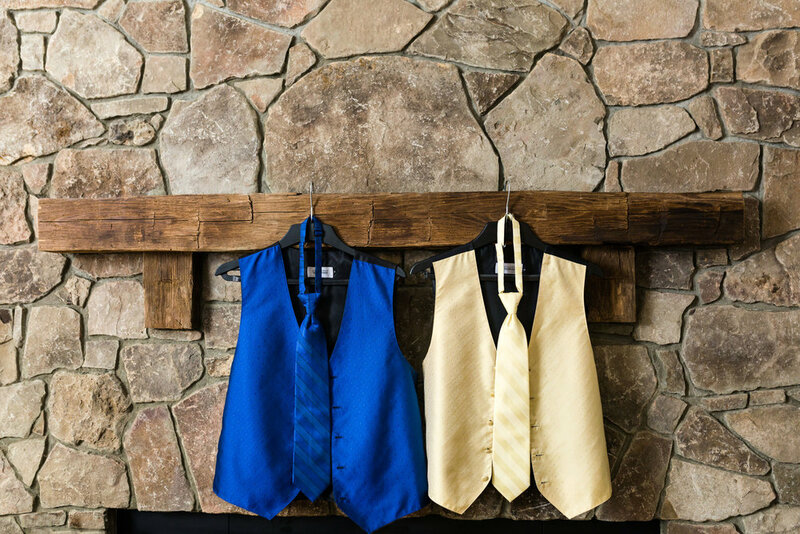 The wedding party set up at the Crimora Mine Retreat to get ready for the day. 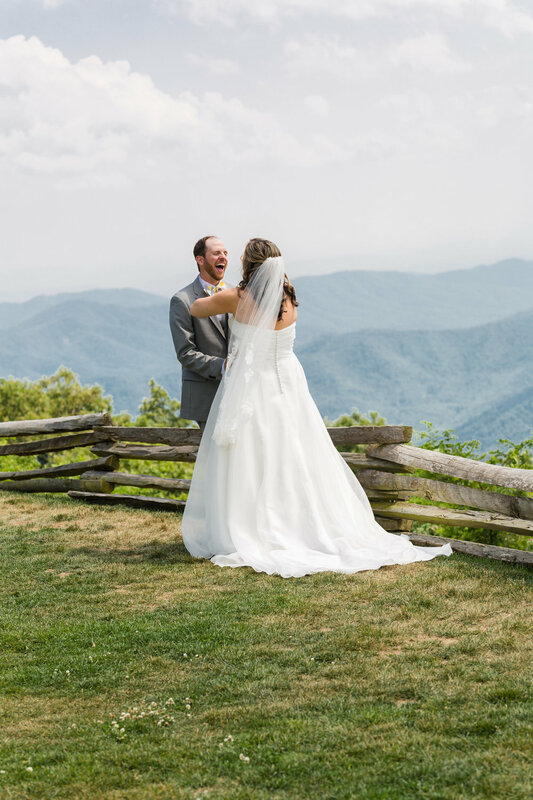 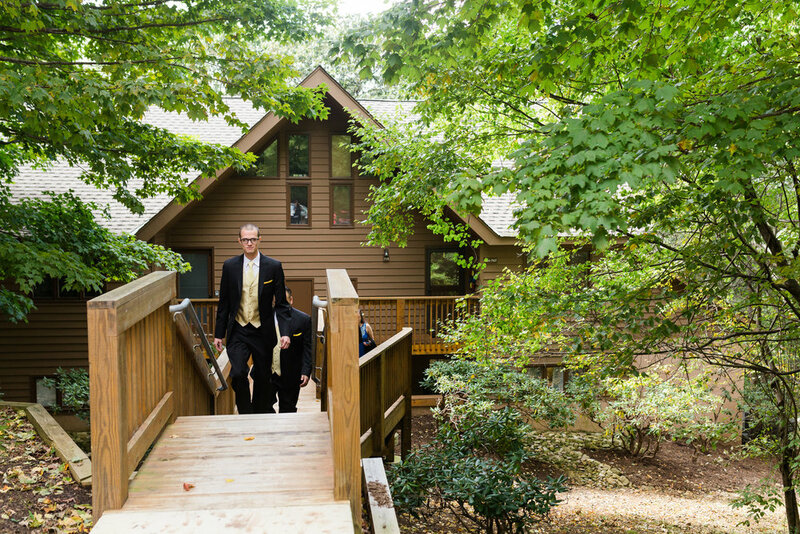 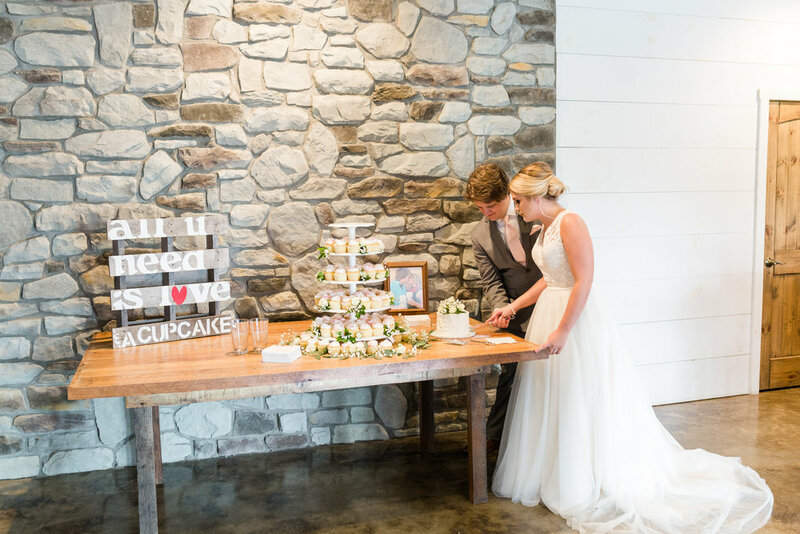 This log cabin was the perfect background for this mountain loving couple! 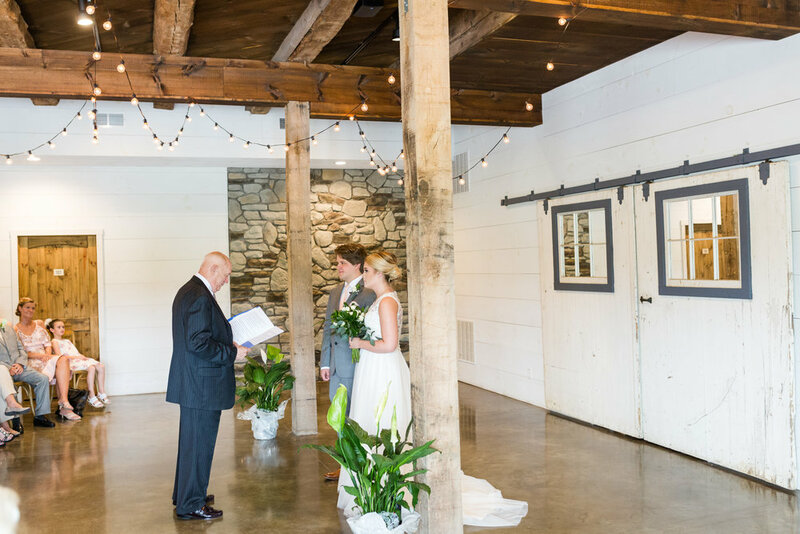 The natural light poured in from all the windows and it was such a cheerful space to be in. 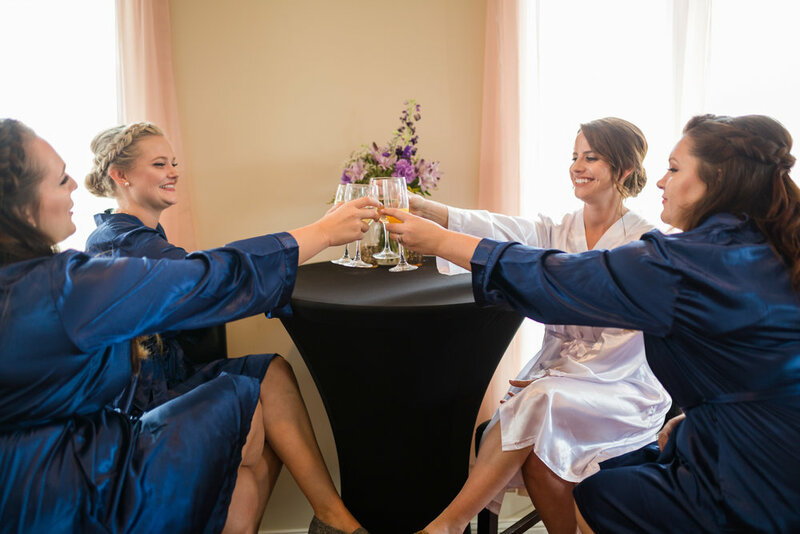 The girls had a blast getting ready in their matching floral robes. 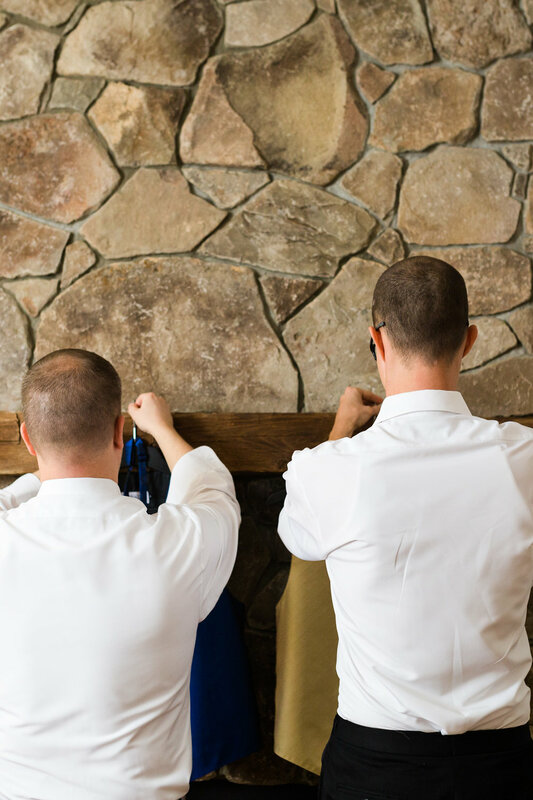 The guys were downstairs doing a little more relaxing and shared some fun gifts for the groomsmen. 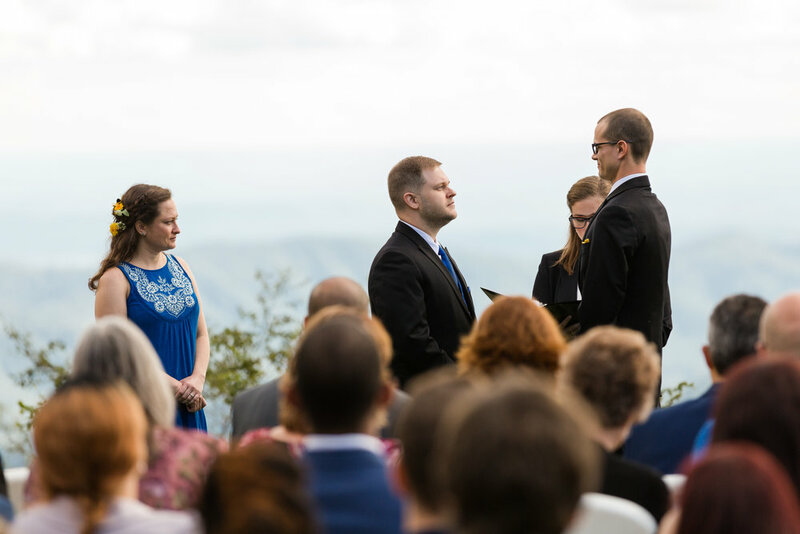 Mandy and Matt chose not to see each other before the ceremony but did meet to exchange letters and say a prayer together before becoming husband and wife. 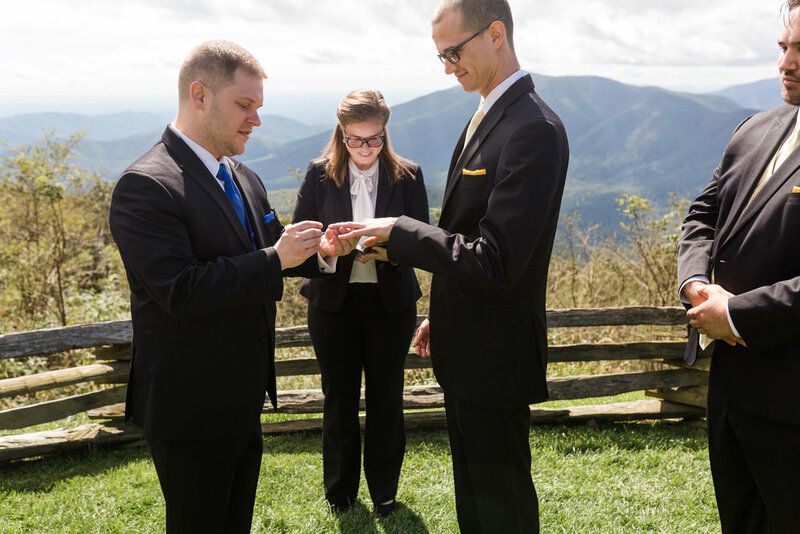 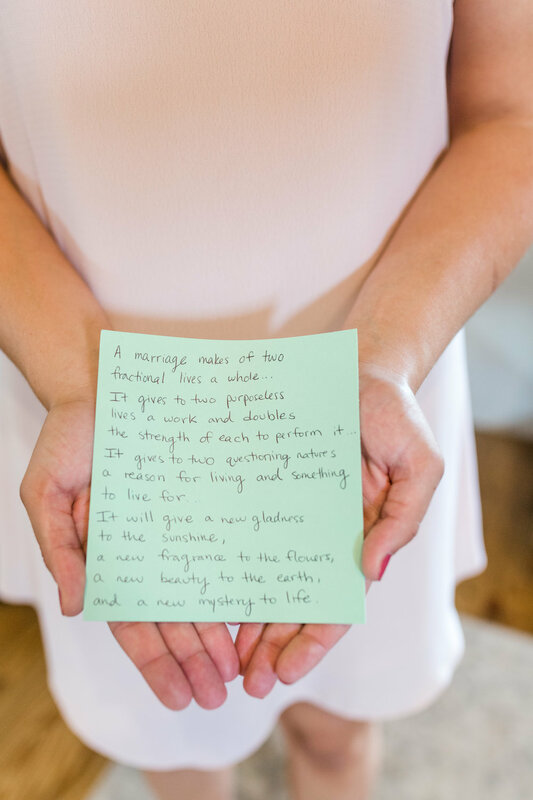 The read their letters and headed to Barren Ridge to say I do. 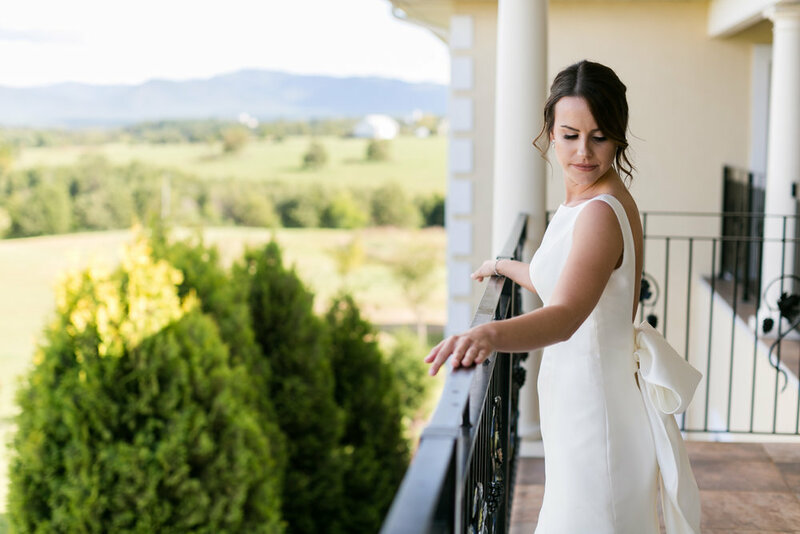 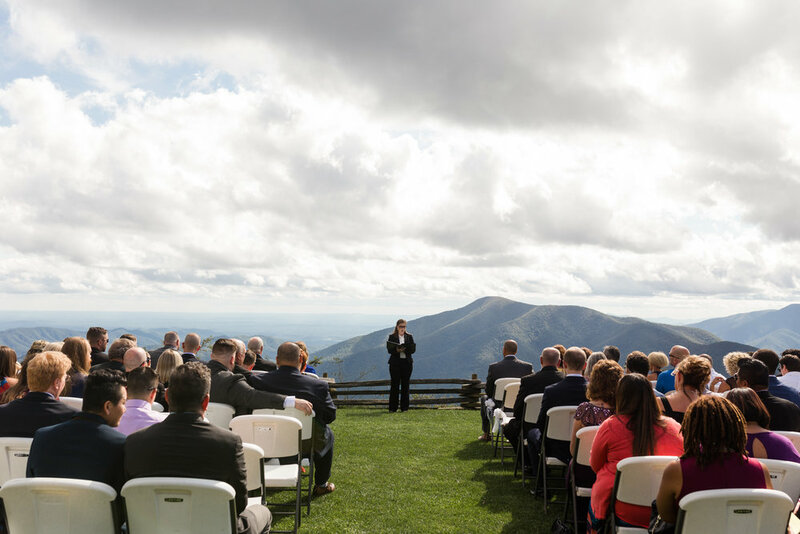 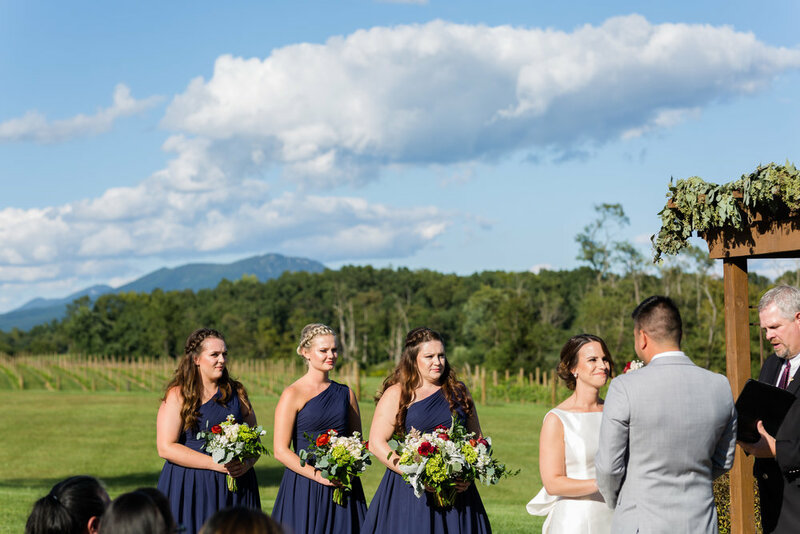 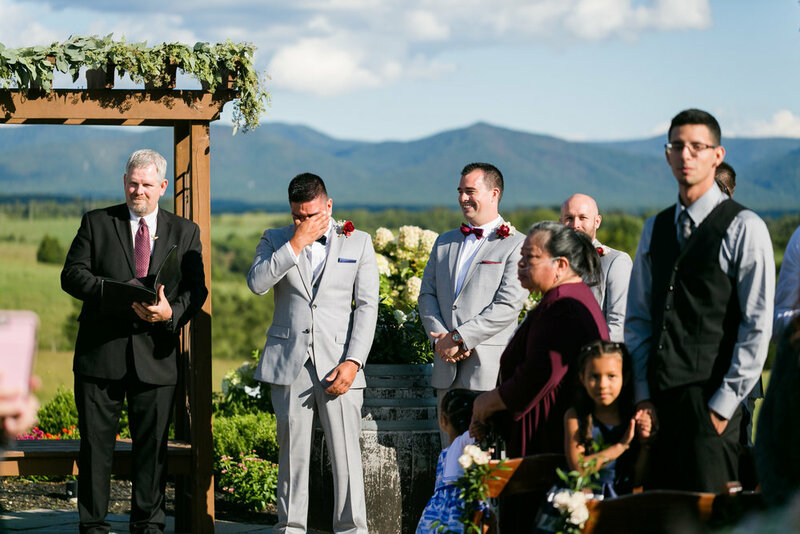 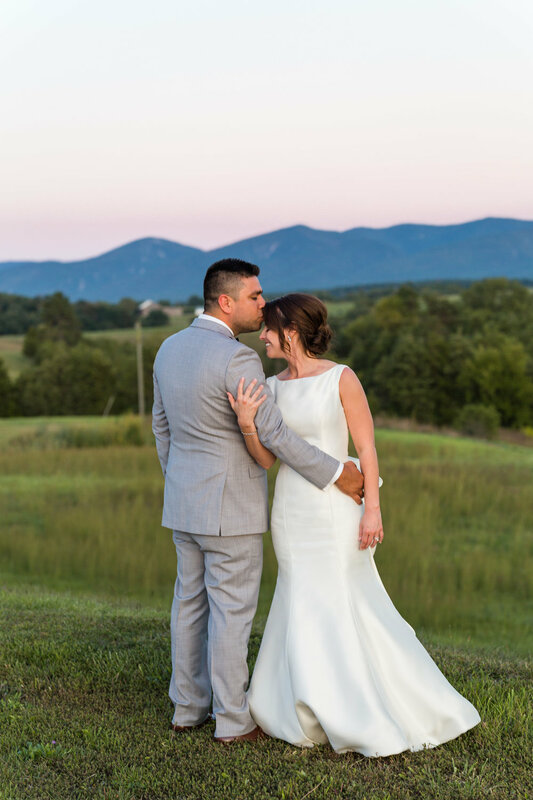 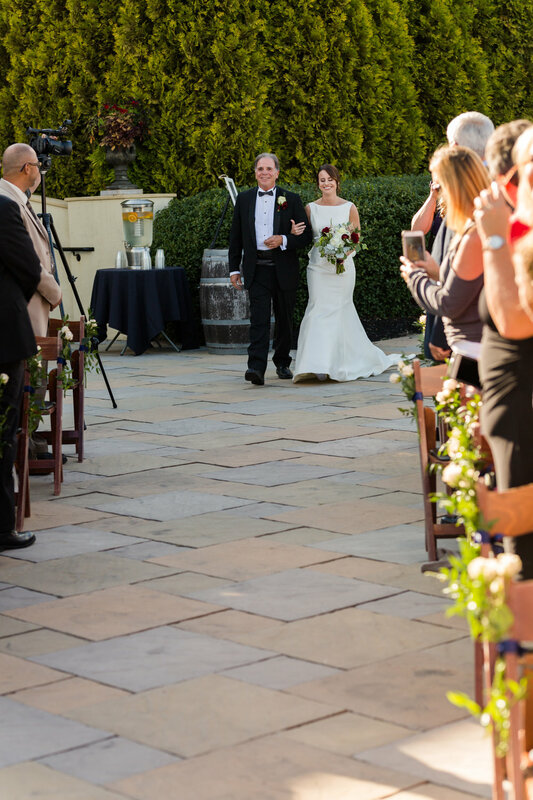 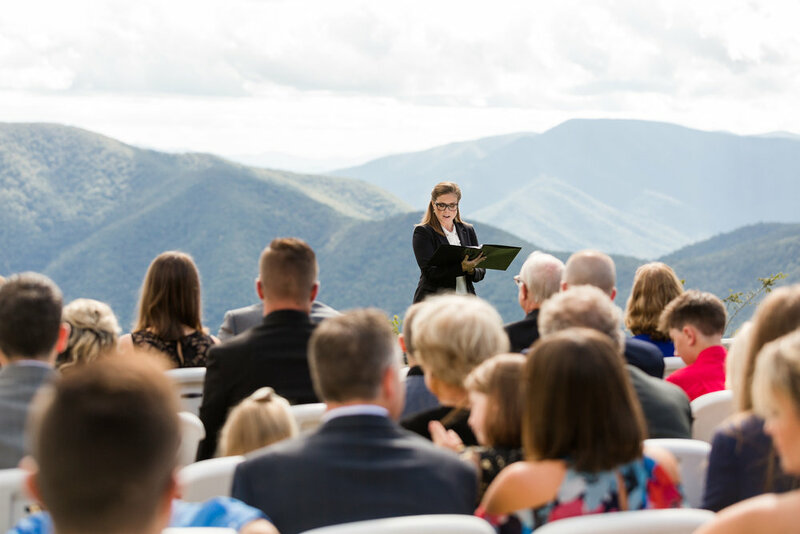 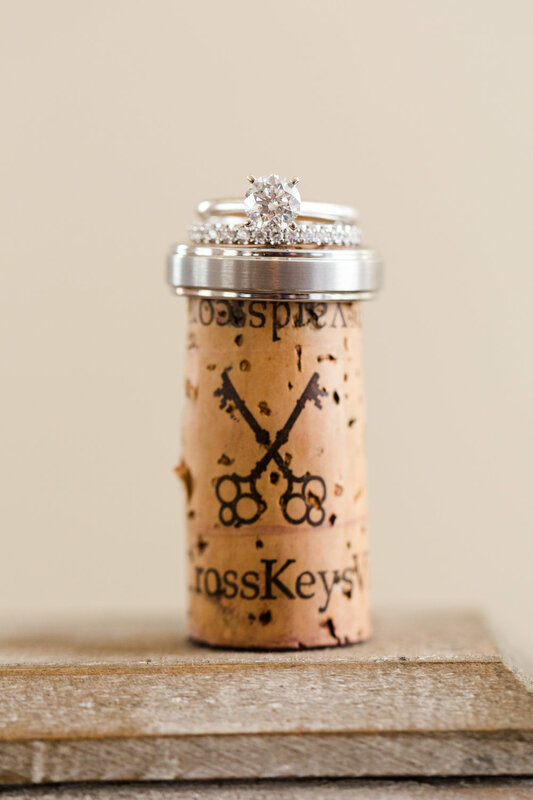 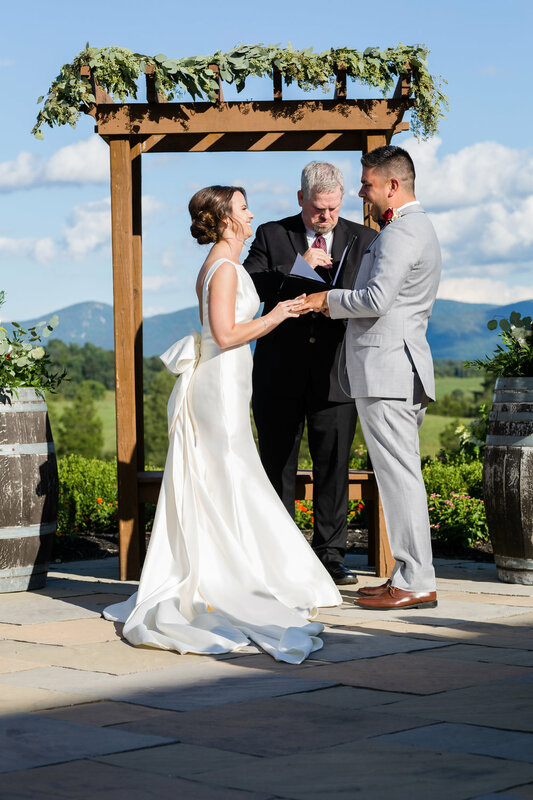 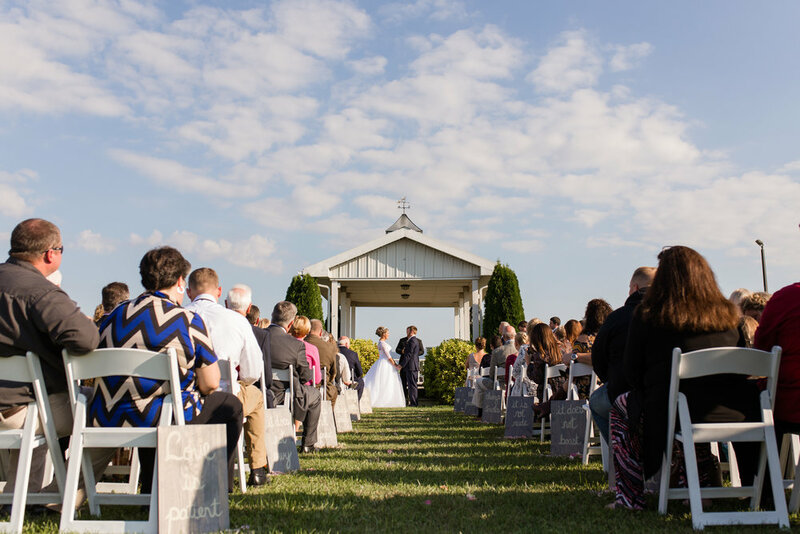 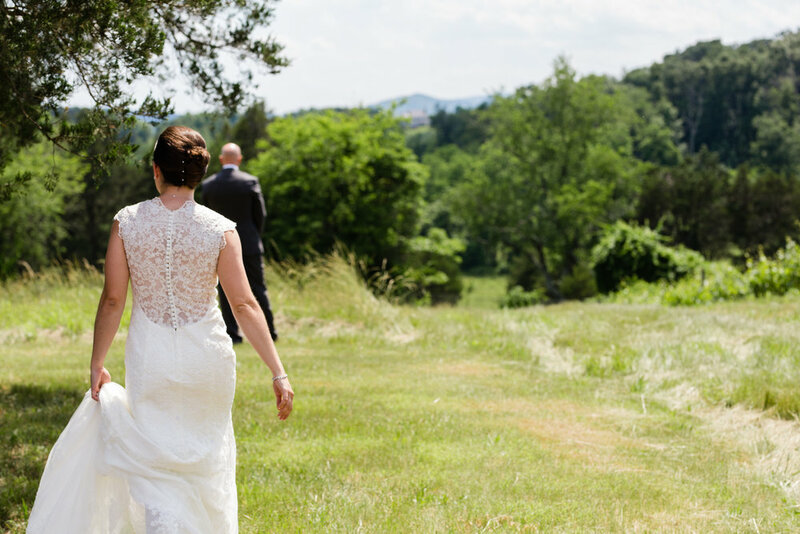 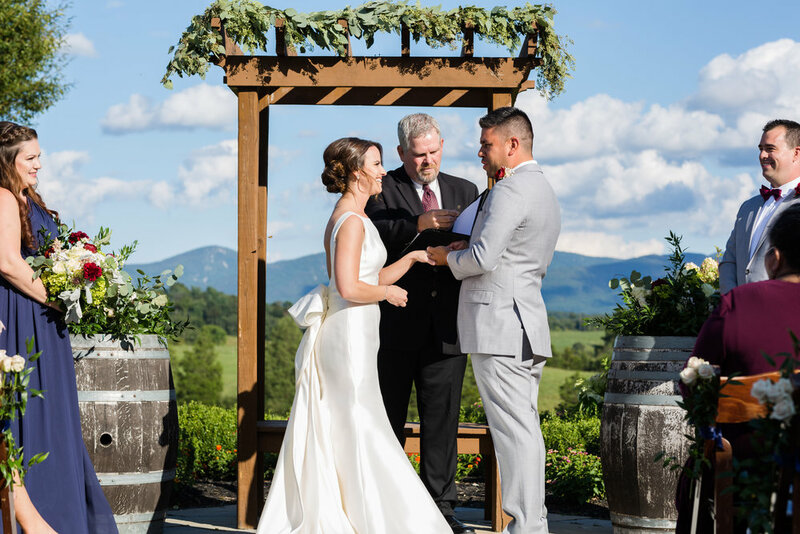 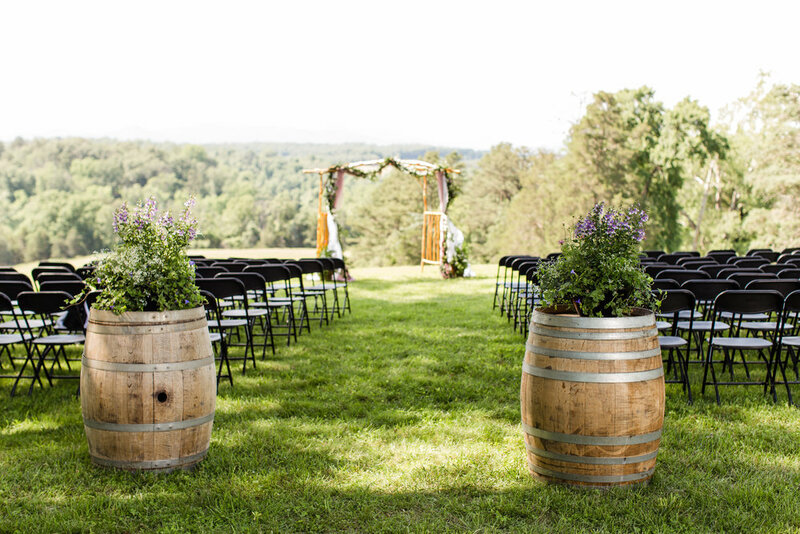 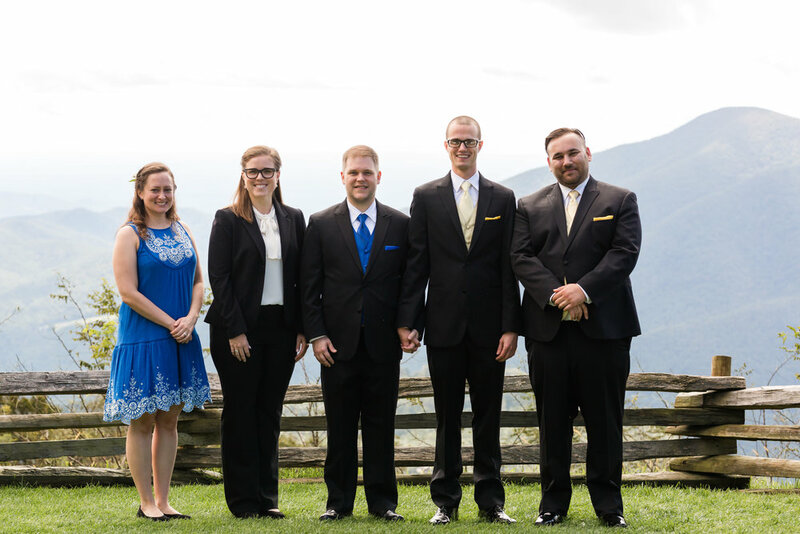 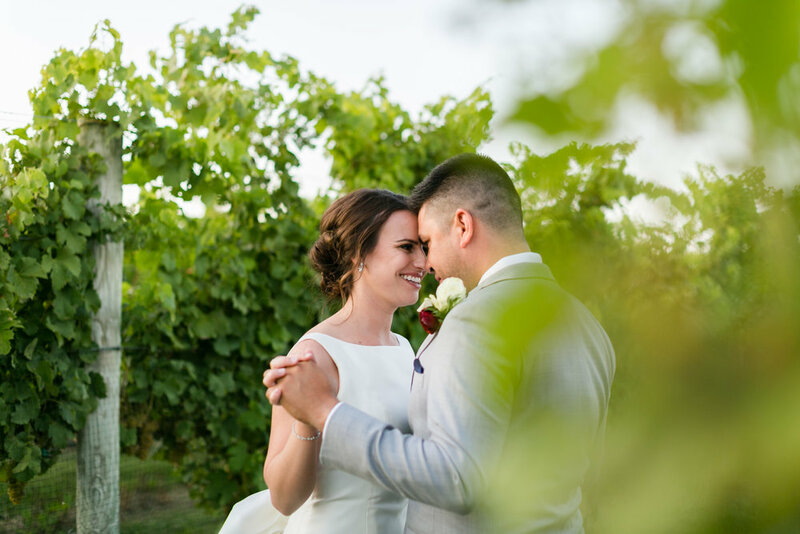 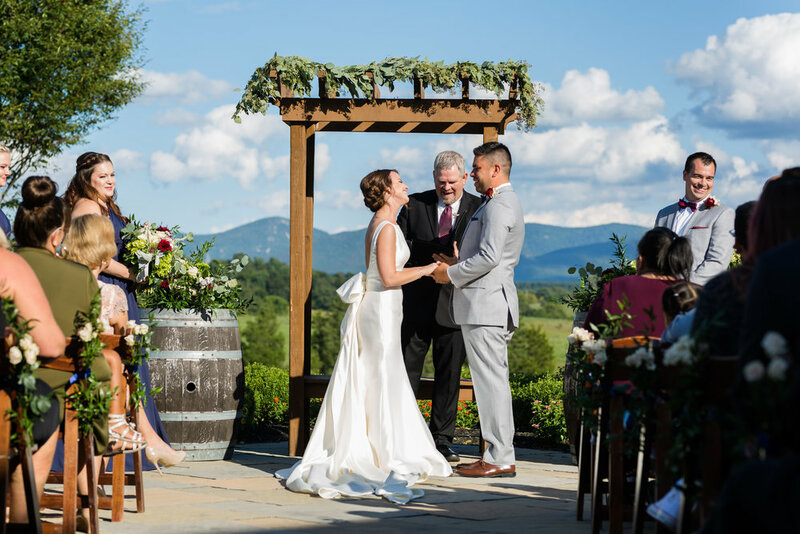 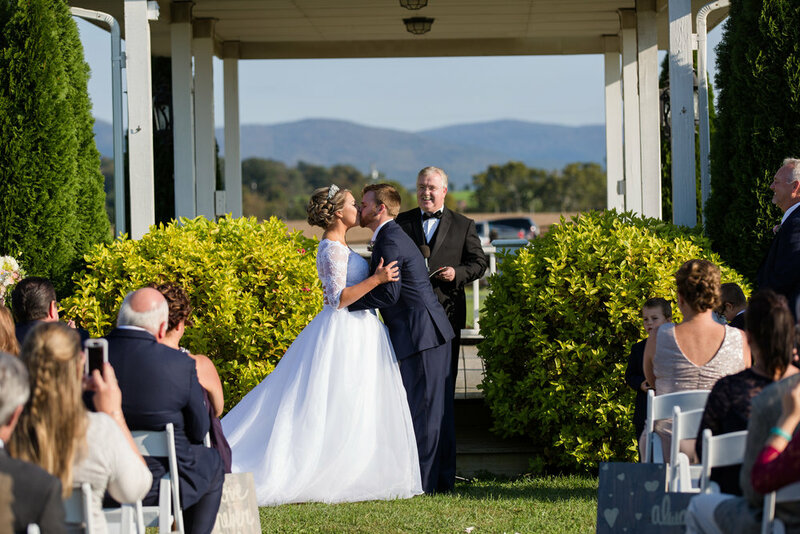 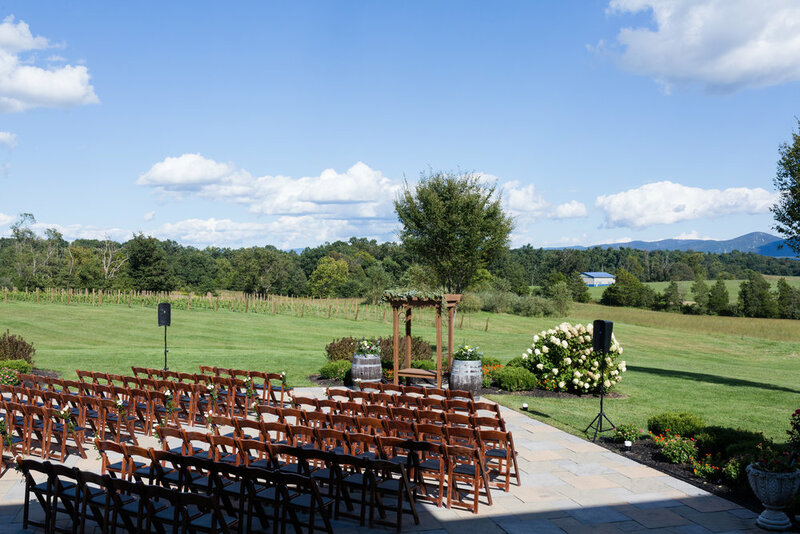 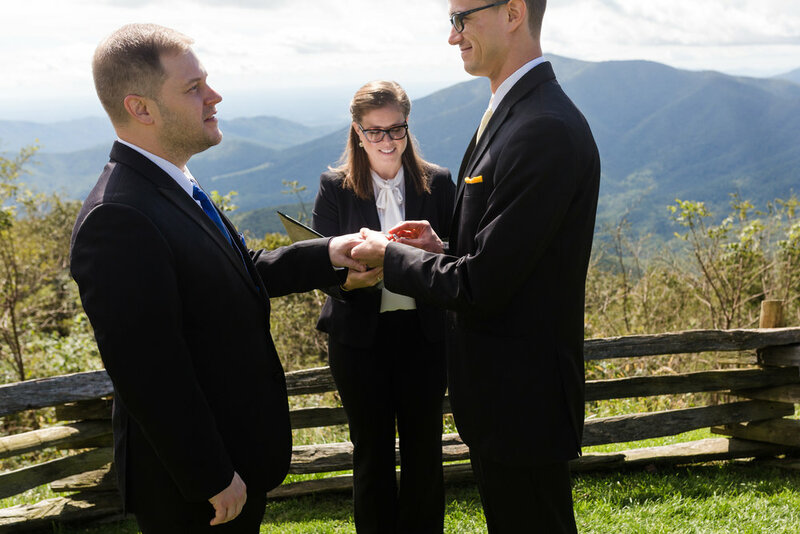 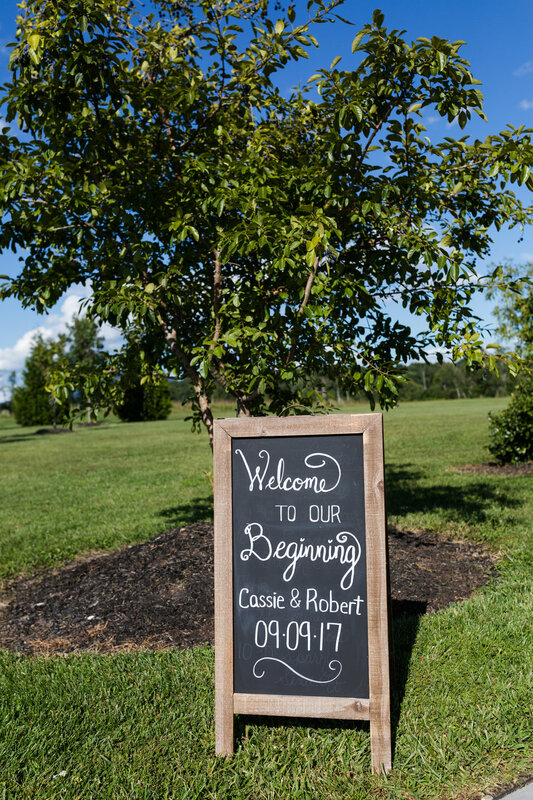 The ceremony was held in the vineyards at Barren Ridge with an amazing view of the mountains. 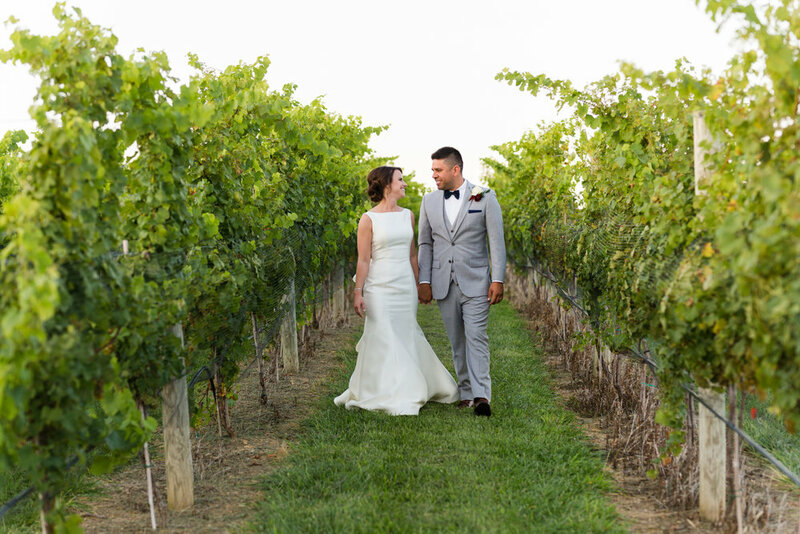 Mandy was driven through the vineyards in style by her father in a Ford model A. 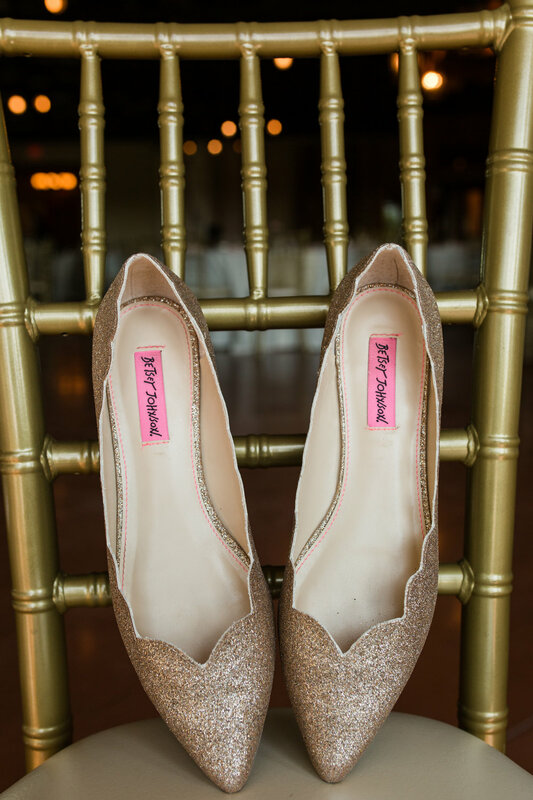 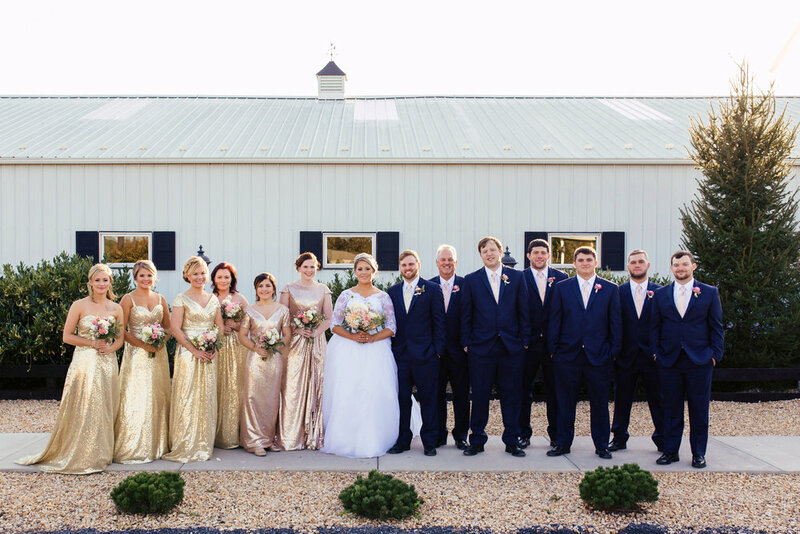 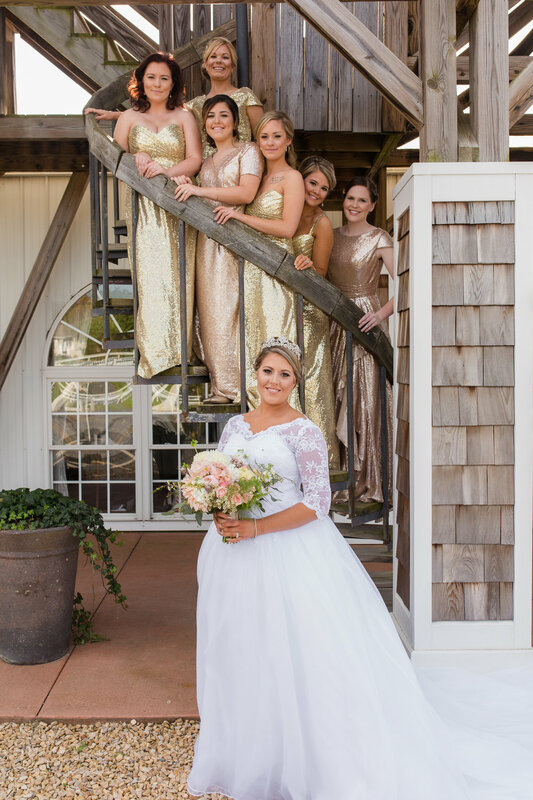 The reception was held indoors and was decorated in navy and gold, the perfect accents to the blush dresses worn by the bridal party. 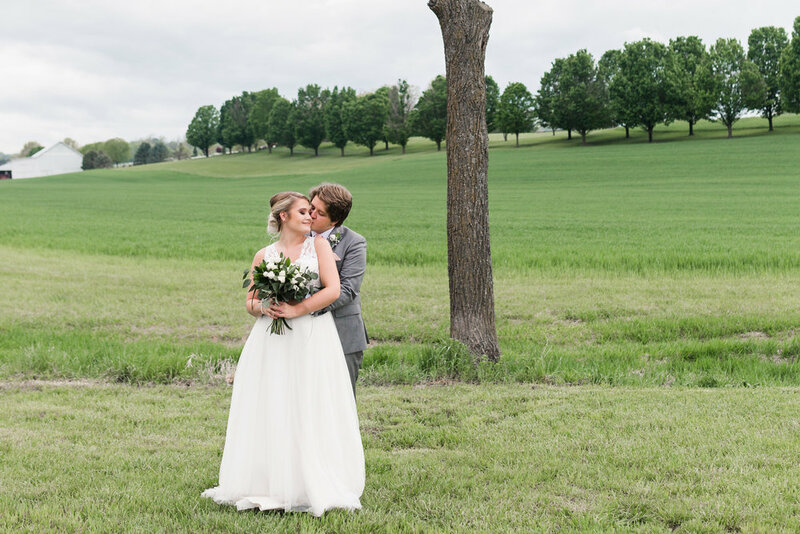 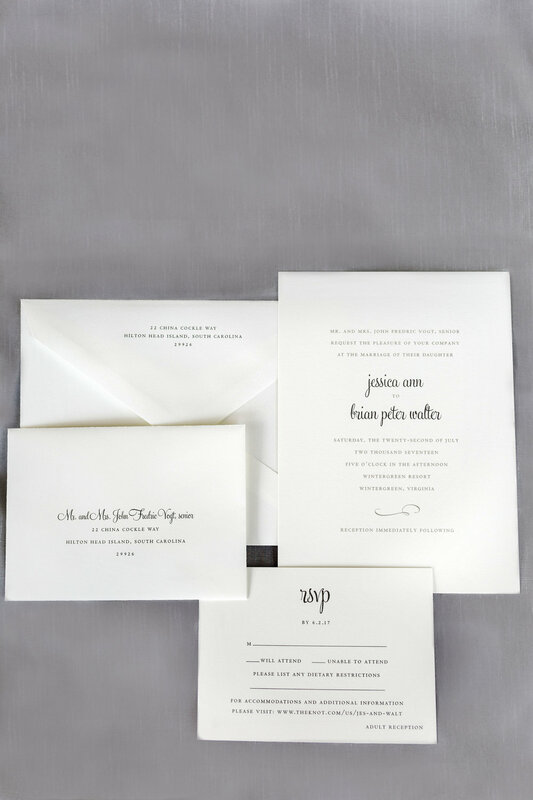 The couple wanted their wedding to feel "romantic and elegant but not overdone".